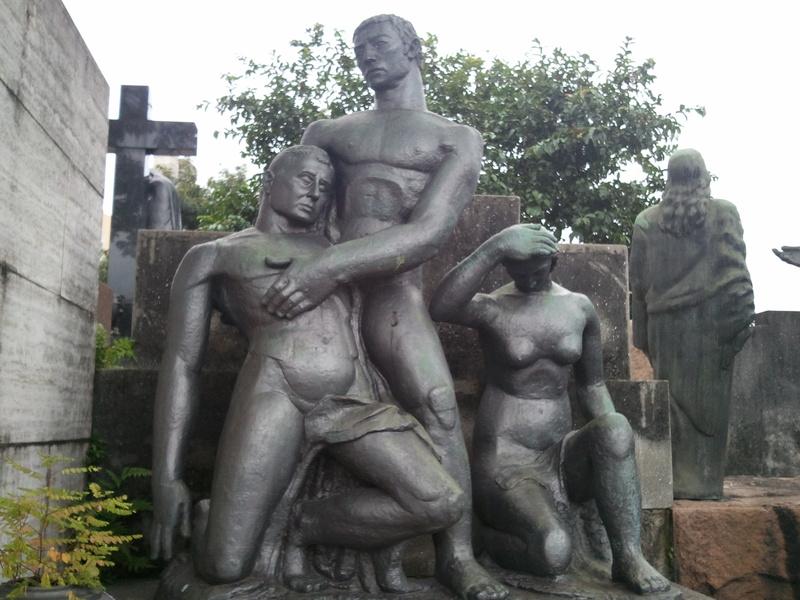 November 20th, Dia da Consciência Negra or Zumbi dos Palmares Day has been a holiday in the populous states of Rio and Sao Paulo since the 1960s, though not everywhere in Brazil. 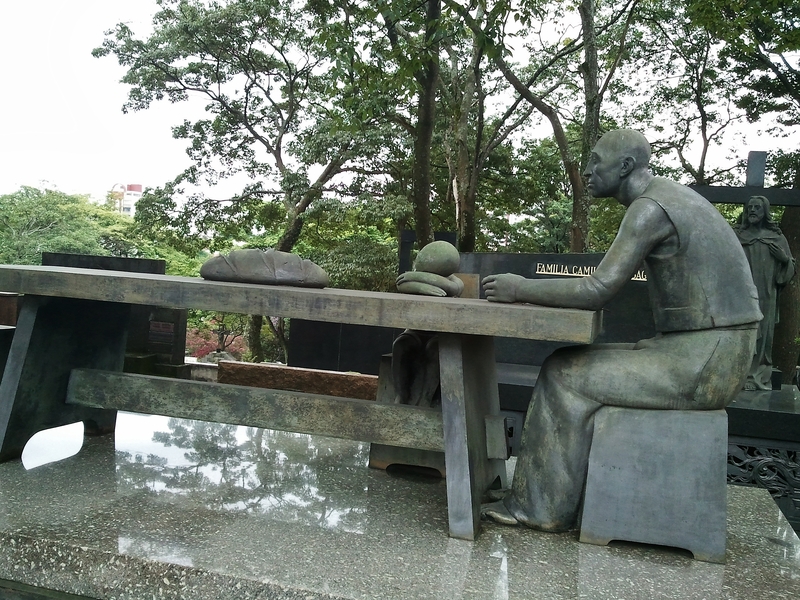 Public holidays are declared by federal, state and municipal legislatures – the 1932 Paulista Revolution, for example, is a holiday in the state of São Paulo only. 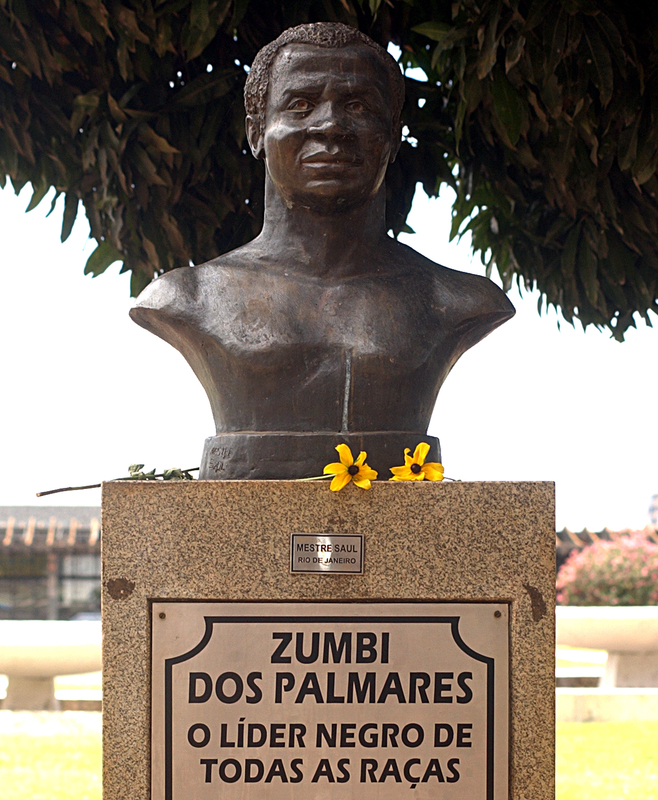 Black Consciousness Day marks the death of Zumbi dos Palmares, a 17th century military leader of the African and mixed-race slaves who had escaped to the settlements known as quilombos – or smaller mocamabos (huts or hide-outs), ladeiras (slopes) or magotes (heaps, piles) – in the interior. In the same way that Jesuit priests had established viable settlements or missões in the interior, the quilombos practised agriculture, while also using less ethical means to survive. And like expeditions against the missões, military expeditions were mounted to punish and destroy the settlements, which included poor white Brazilians. As an incentive, captured quilombolas became the property of their captors. In such turbulent times it’s easy to imagine that raid, theft, extortion, enslavement and violence were practiced on all sides. It’s an unclear and loaded history in which the academic authority seems to be Stuart B Schwartz, a Yale historian and Portuguese speaker. He has made new primary sources more accessible through translations into English. Zumbi continued to be a favorite in Arena’s repertoire during the 1960s and early 1970s. Produced also in the 1970s in Nancy in France and in New York, last week this piece was revived at the SESC Pompeia theatre in Sao Paulo. 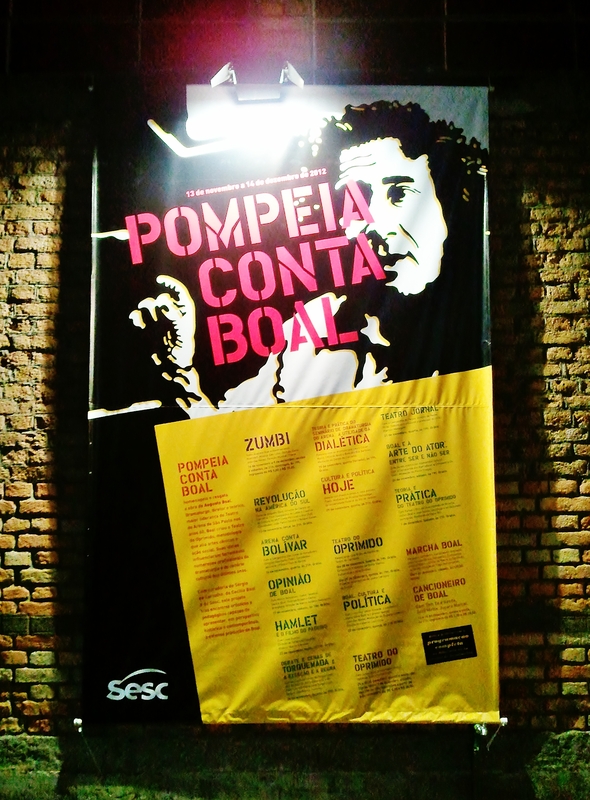 Arena Conta Zumbi is part of an extended programme at SESC Pompeia celebrating the contribution of Boal to Brazilian theatre. 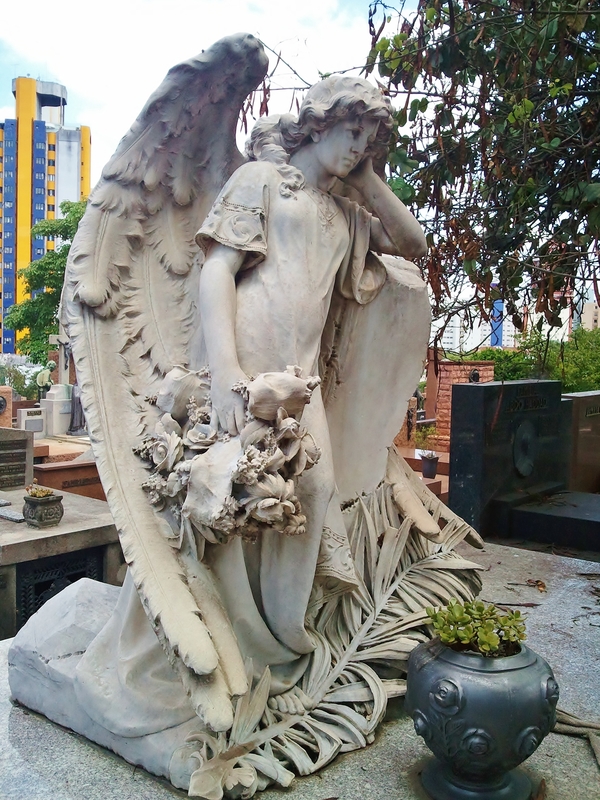 Avenida Pompeia is a Sao Paulo thoroughfare which rises steadily north east from the Vila Madalena metro station to the crest of a hill, then descends the slope in one long straight line as far as the Marginal which runs along the Tietê River. 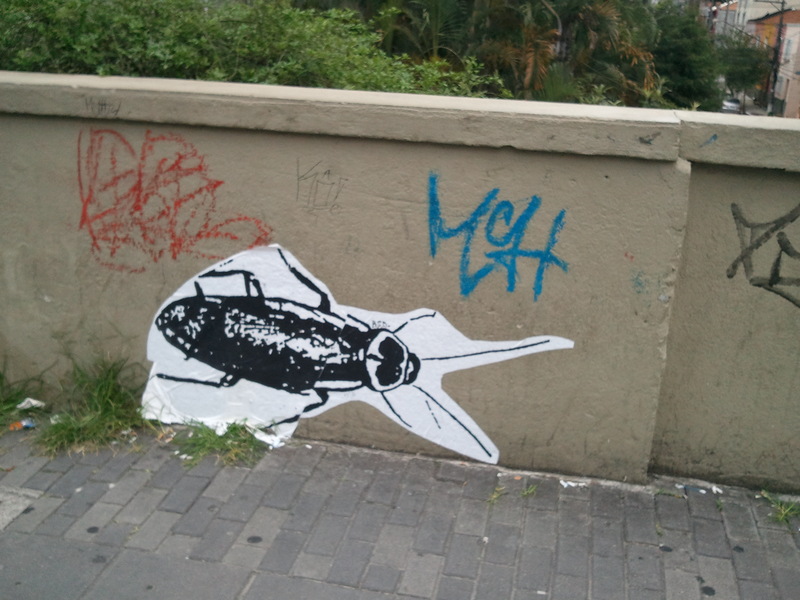 Vila Pompeia is a gentrifying suburb with a growing number of restaurants and small businesses, and abundant street art, extending even to the pavements. 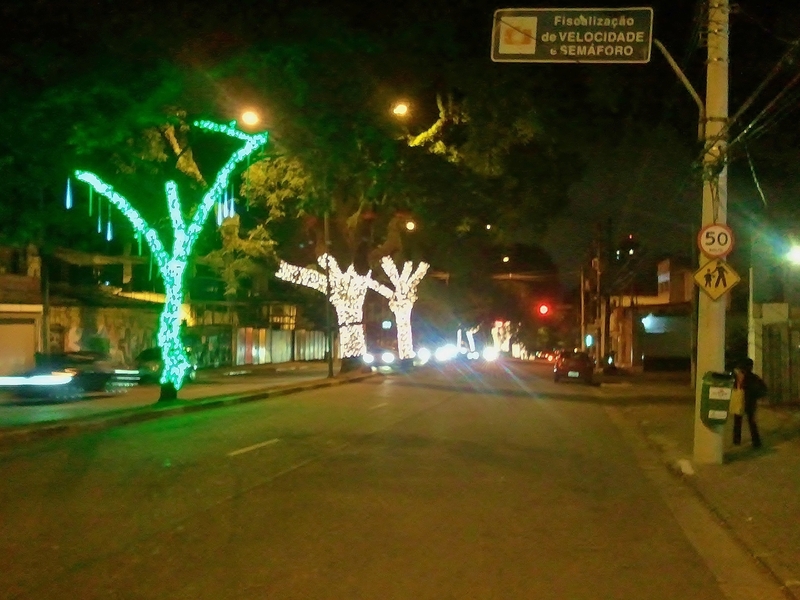 The Avenida trees in the central reservation lit up for Christmas are a fetching sight. 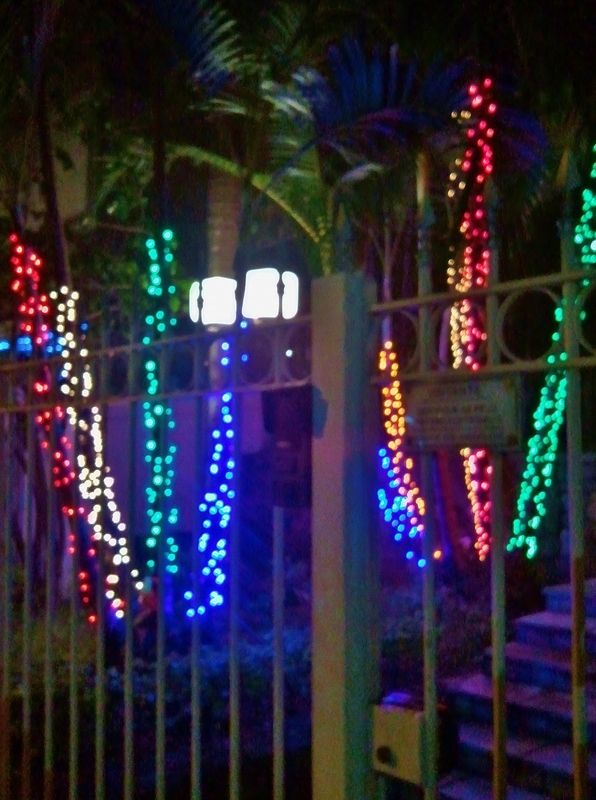 Down in Vila Pompeia proper, the buildings are lit for Christmas too. Headlights of ascending and descending cars play on the undersides of the car park carriageways as if in concert with the decorations. A far cry from the landscape of the quilombos. 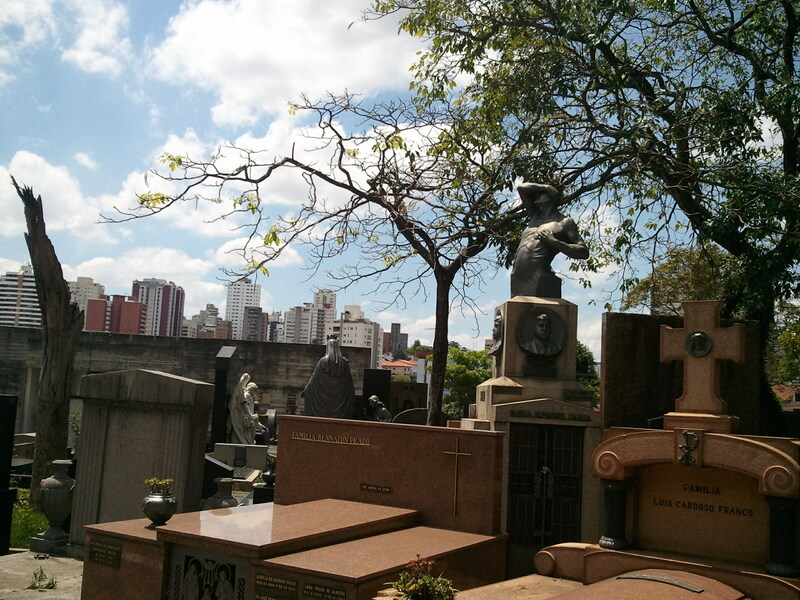 It was a public holiday in Sao Paulo last Saturday – the 460th anniversary of the founding of Sao Paulo. The holiday fell on a Saturday, so no time off work, but nevertheless, with a sunny weekend beckoning, there was a holiday mood. A good day for a walk. 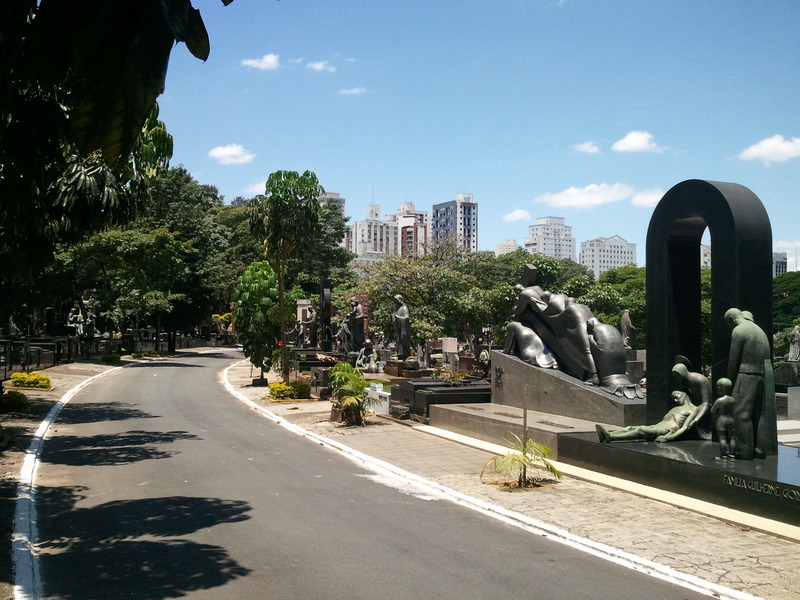 Avenida Paulista, where a street celebration was promised, or Ibiripuera Park, with weekend crowds and shaded walks? I walk up to Ibiripuera Park, the largest in Sao Paulo, through steady traffic. Vendors man their pitch at the lights, selling cut-price flowers, gadgets, and in his usual spot, a man who sells brooms. Sitting beside the road, I thought he had an exotic Brazilian animal on his lap, but it was only his stock of feather dusters. 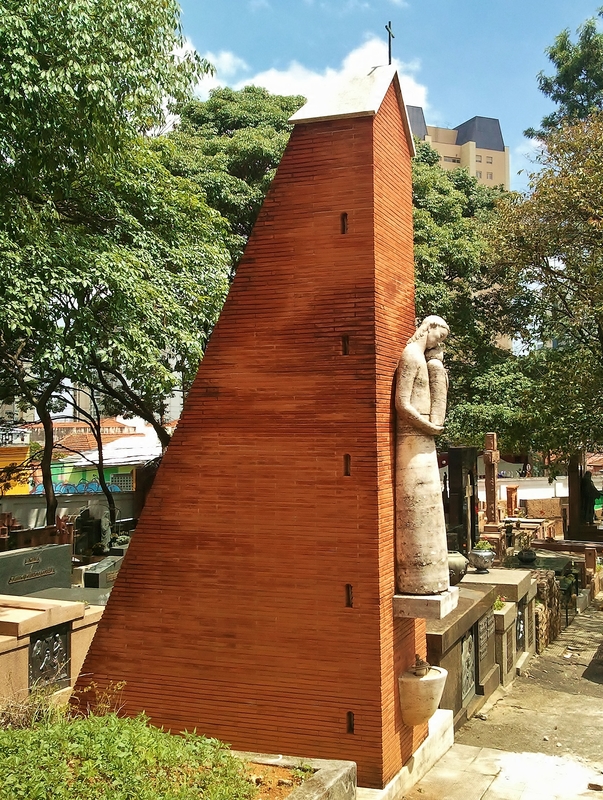 Sao Paulo is well supplied with public sculpture, perhaps aspiring to the European tradition of bronze soldiers and statesmen, but it’s generally on a more intimate scale, celebrating more modest Brazilians – journalists, tennis players, civic leaders. 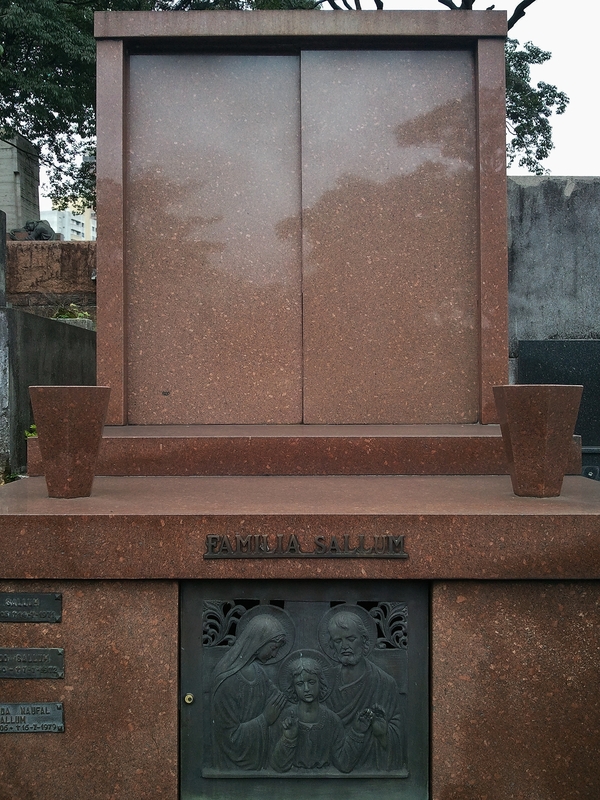 On an approach to a side entrance of the park there’s a bust of celebrated writer Cora Coralina (1889 – 1985), not published in book form until her mid-seventies, though she had been writing since her teens. 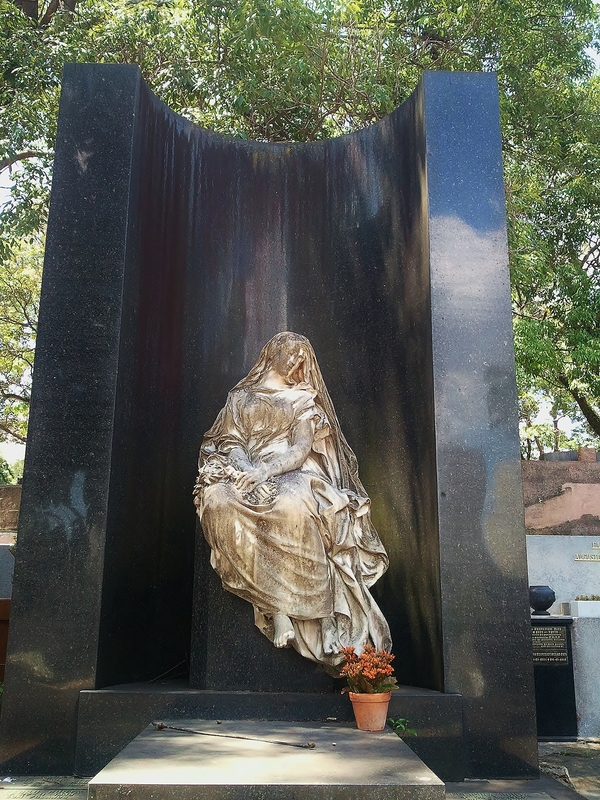 Living in Sao Paulo for much of her life, she was a modest and popular writer, born in the interior of Brazil in – and returning at the age of 67 to – the town of Goiás Velho which was the source of much of her subject matter. 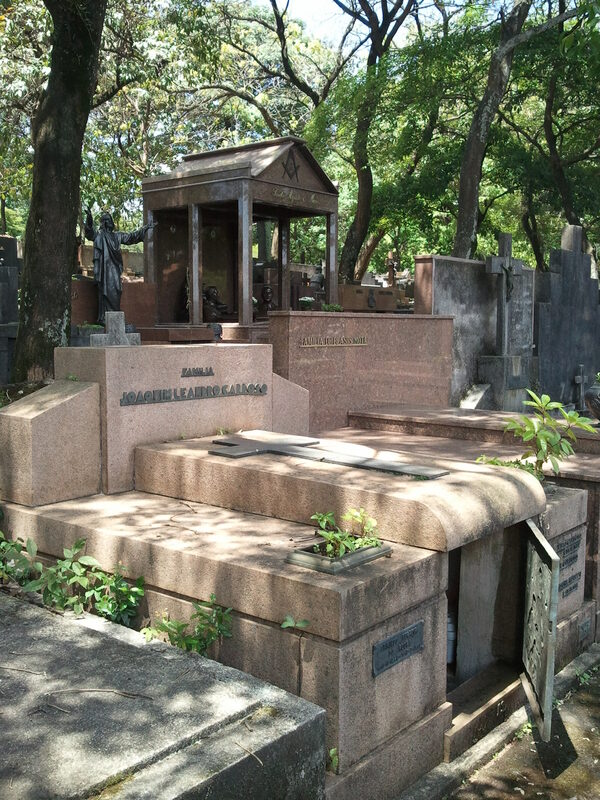 After her husband’s death she earned a living by making and selling sausages and cakes, selling books, and also writing stories, poems and children’s literature for the newspapers. The park is bustling with the Saturday crowd – cyclists, joggers, skaters and skateboarders, families with pushchairs, friends out power-walking as they talk – and here too there are vendors, of agua de coco, ice-cream, refrigerantes or soft drinks, and bicycles for hire. On the grassed areas there are the practitioners of capoeira – a Brazilian dance and martial art form – people singing and playing the guitar, pairs of lovers, tight-rope walkers practicing, people in hammocks, religious groups praying in public … Most people don’t have gardens, so the park offers them welcome space, fresh air and natural surroundings. During the week the park’s population reflects the affluent suburbs close by – they come to exercise – but on Saturdays they stay away. We walk along the shaded asphalt paths, a leisurely stroll, with all kinds of people walking in both directions, skaters weaving through the pedestrians, cyclists in their lanes, and every imaginable kind of casual dress and undress. Children play around the water fountain, a circle of youths and girls bat a volleyball from hand to hand, someone strings up a hammock. The sun is quite fierce, but an avenue of giant bamboo is quiet and fresh. A large plastic cup of cool agua de coco is welcome. The park is full, but not crowded. A park employee stands at a pathway junction with a whistle, warning skaters to stay in their lanes as they speed down the hill. 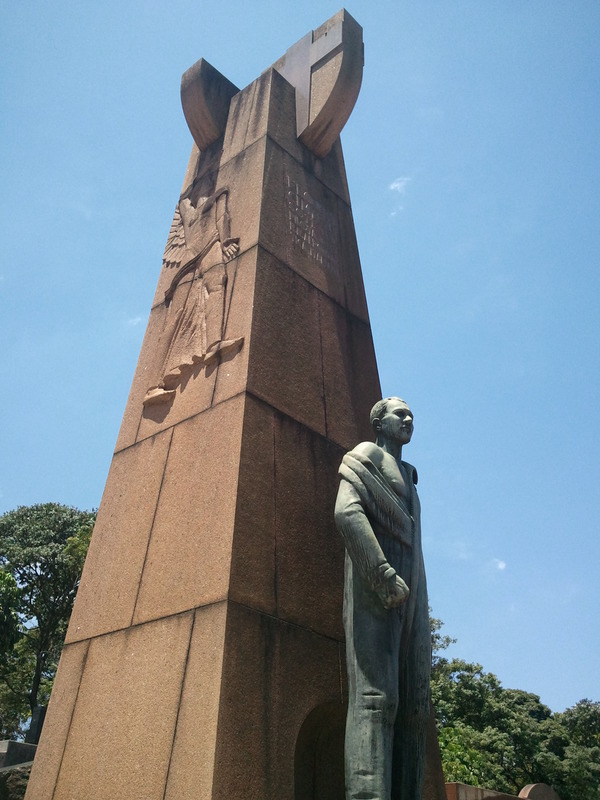 Statues appear scattered throughout the park, chosen for popular appeal. 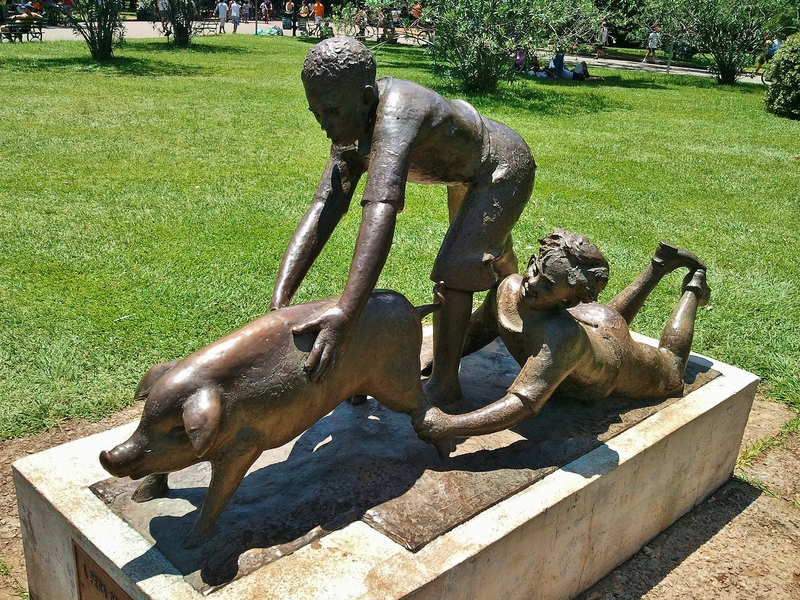 The bucolic game with a greased pig is clearly a favourite – its back and neck have been burnished by many hands. 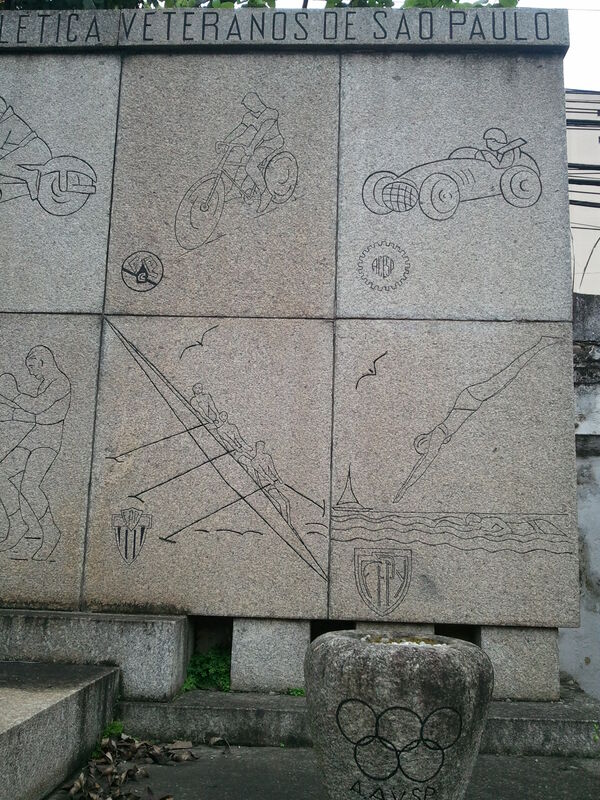 The sculptor Ricardo Cipicchia also has a piece on the esplanade in Santos, a fisherman casting his net into a boiling sea. 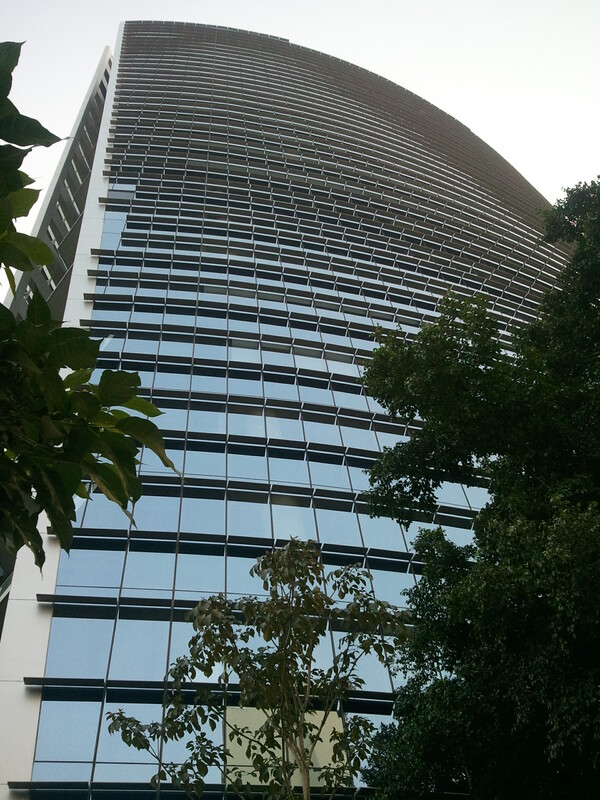 Here in Ibiripuera everything is peaceful. 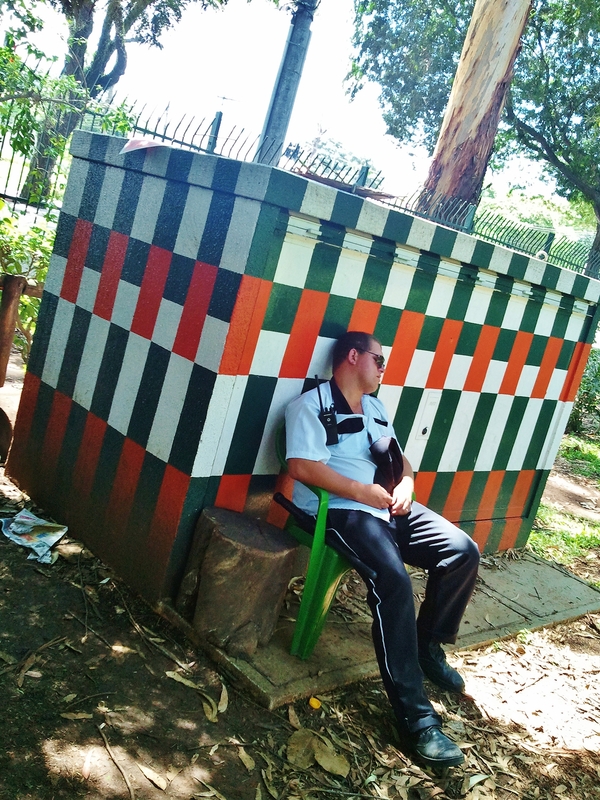 So much so that the park police have an easy Sunday. Who could imagine that down on Avenida Paulista the street party included a demonstration, which turned into a riot, complete with special police and property damage? From that perspective, you understand that one of the functions of public art is to define a national character, a model for citizens to follow. The gentle, innocent country people and poets are acceptable, desirable, but urban rioting seems to be just under the surface this summer. 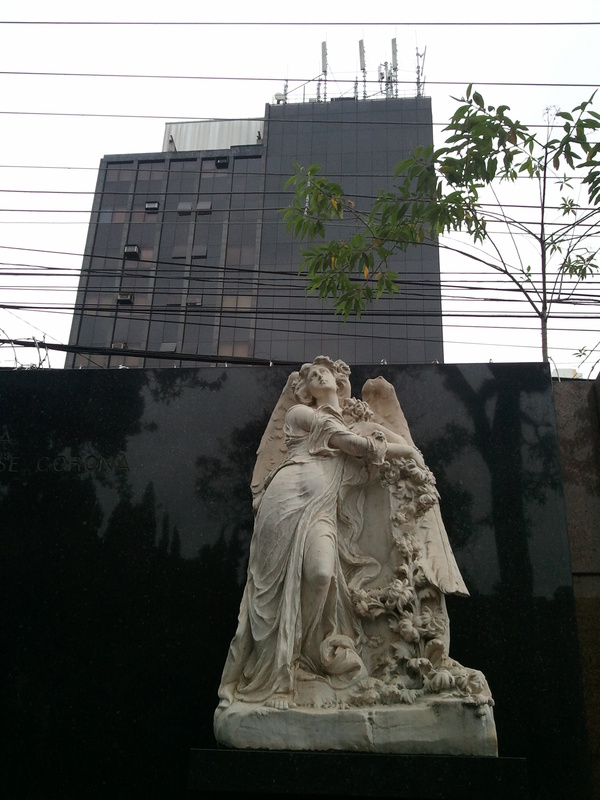 Both are cultural expressions, posited as opposing tendencies, and the function of public sculpture in this is clear. In 1933 the Mercado Central opened in the centre of Sao Paulo, establishing a covered venue for what had been a collection of street markets for all kinds of food. 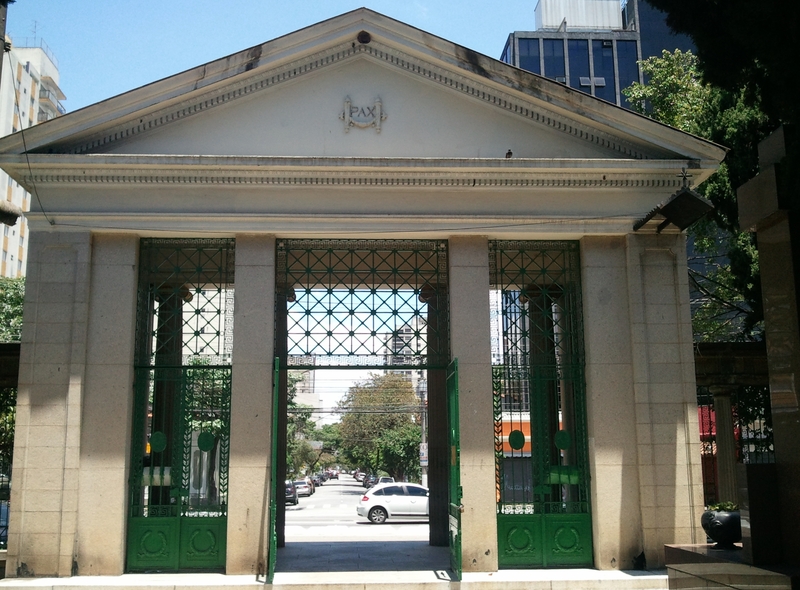 Harking back to the dominance of agriculture during the café com leite era ended by the Revolution of 1930, the agricultural products of Sao Paulo state were to be sold in what was a grand and decorative yet also a functional building. 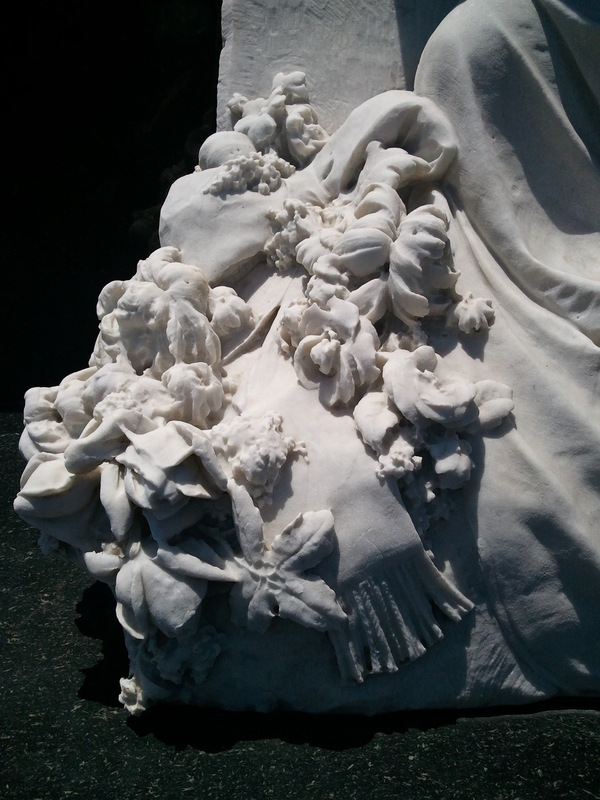 The cornucopias supporting the Sao Paulo crest are echoed in the fruit-filled urns surmounting the keystone caryatids – could this be the origin of Carmen Miranda’s famous millinery? 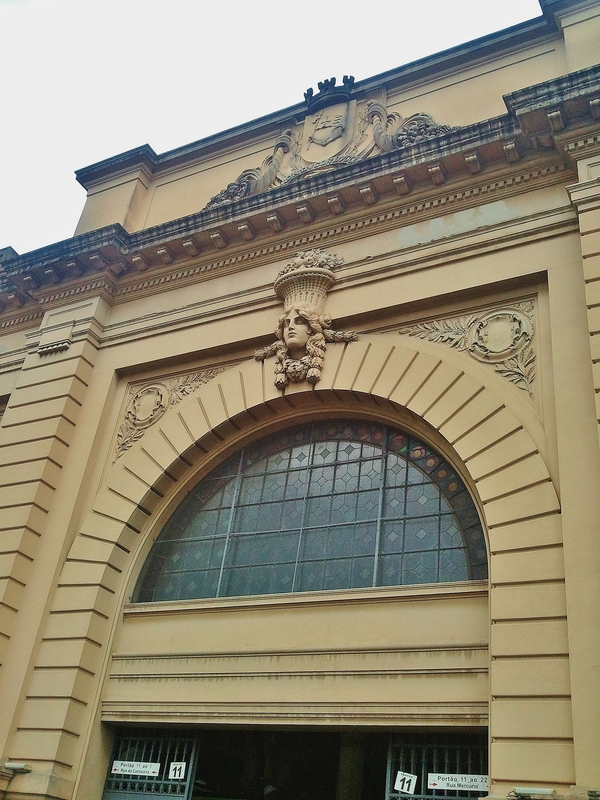 a building which began life as a vocational school for the applied arts. 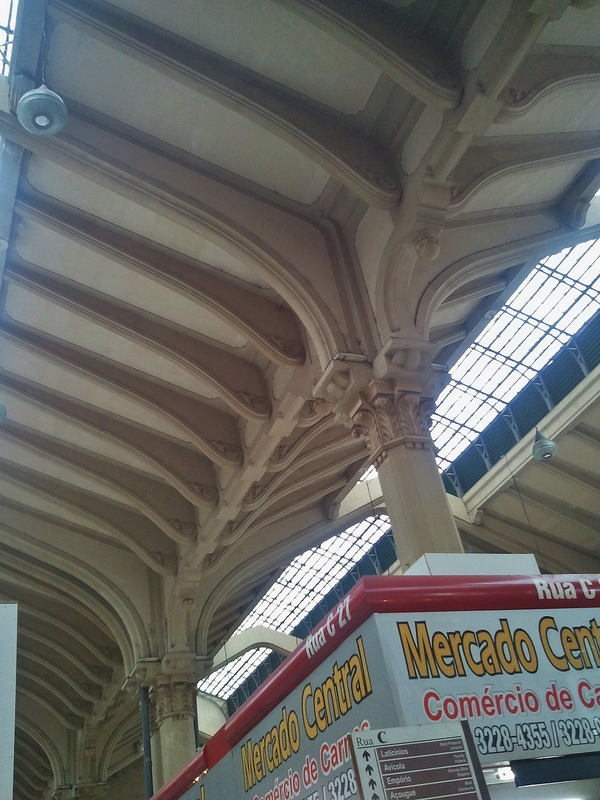 The Mercado has also undergone changes of use – renamed the Mercado Municipal, and from 1969 transformed into a retail- and leisure-oriented space, while the sale of wholesale agricultural produce has moved to the larger, out-of-town-centre CEAGESP site at Vila Leopoldina. Like the Mercado, this site is also open almost every day. 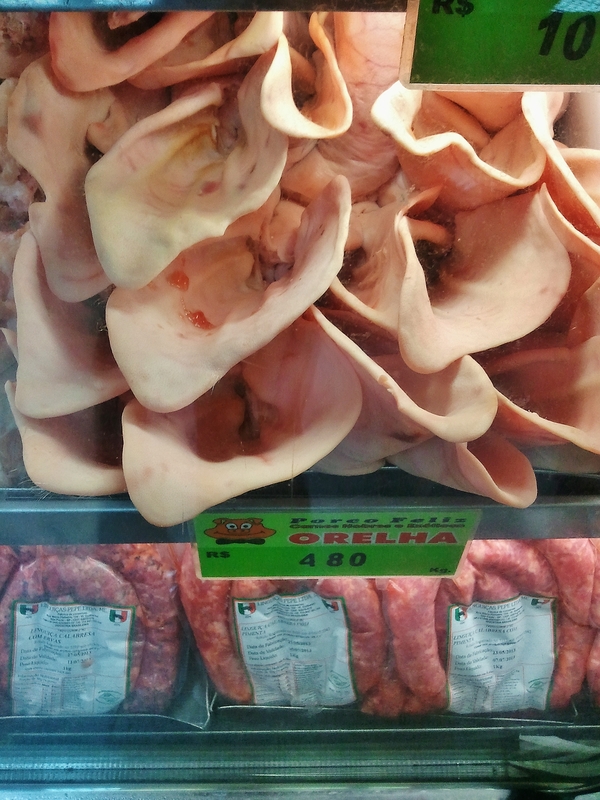 including that essential for the feijoada pork and bean stew, pigs’ ears. The food enthusiast can spend a happy hour or two shopping for the wares of vintners and butchers, fruiterers and fish-mongers (including piranha), sellers of herbs and spices, cheese-mongers, every kind of coster-monger … the variety of food is astonishing. A mezzanine floor has been created inside the ample proportions of the market building. It has a good collection of restaurants of varied types, with a large common seating area crammed with chairs and tables, and a range of counters preparing the food bought to you by busy waiters. Going to the market is a family day out. In summer, the tables are cooled by large fans which spray misted water over the diners. A striking feature is the series of stained glass windows on agricultural themes on the opposite side, above the food stalls. What’s missing from this picture? We couldn’t smell any freshly baked bread, though there are some few stalls which sell bread, and some of the older stalls serving food downstairs are famous for their bologna (mortadella) filled bread rolls. Perhaps food hygiene prohibits baking anywhere except in the padaria. What was stranger for Brazil was not being able to smell freshly roasted coffee – we didn’t spot a single stall. They’ve Got an Awful Lot of Coffee in Brazil … ? 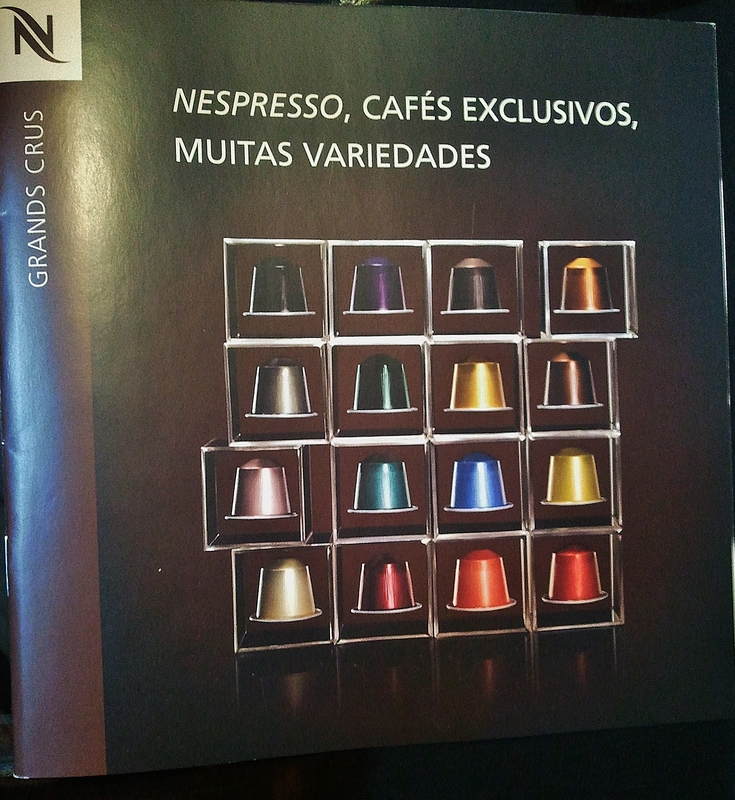 But you can visit any of six Nespresso shops in Sao Paulo, and more elsewhere in the country, where coffee is not so much a commodity as a high-margin luxury item, supporting the sale of expensive coffee-making machines which – truthfully – are nothing like as successful as the old Gaggia machine in any corner bar of Italian extraction. The staff are dressed in muted browns, the shop fittings are carefully co-ordinated, and you can serve yourself with capsule coffee. But that glorious smell is not in evidence there either. Strange country, Brazil. 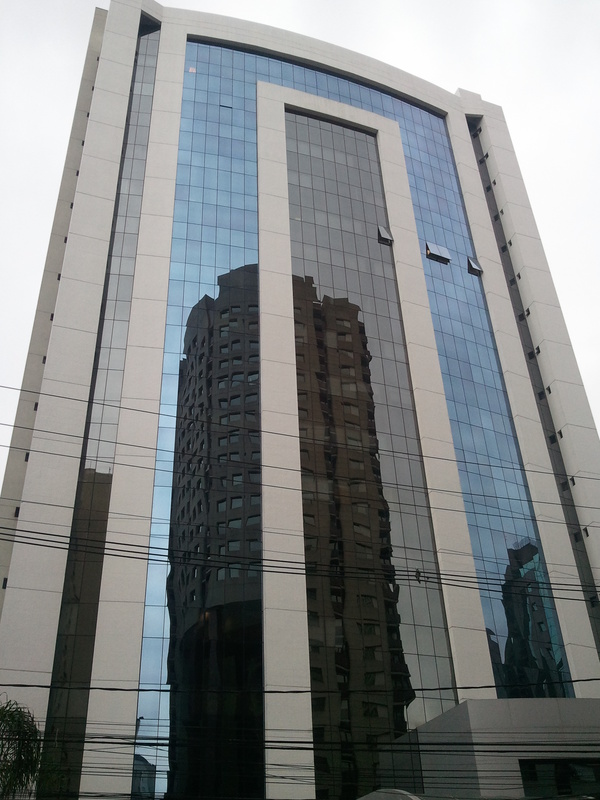 Sao Paulo is under constant development and refurbishment. As in many large cities, the sounds of building work are a near-constant accompaniment to daily life – power tools, delivery trucks, steel and concrete fabrication, the shouts and whistles, and the hand-tools, of workmen (haven’t seen a woman builder yet) are woven into the soundtrack. 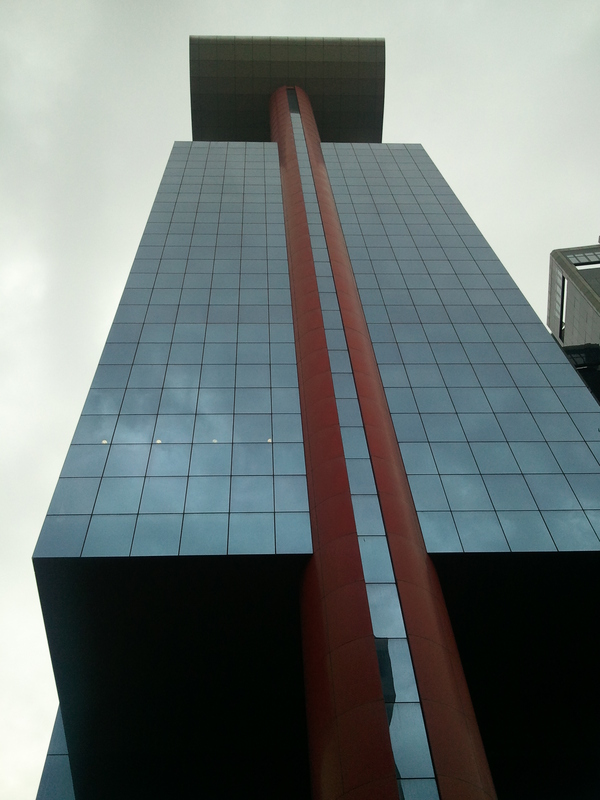 In Sao Paulo, ‘verticalisation’ is the main activity. 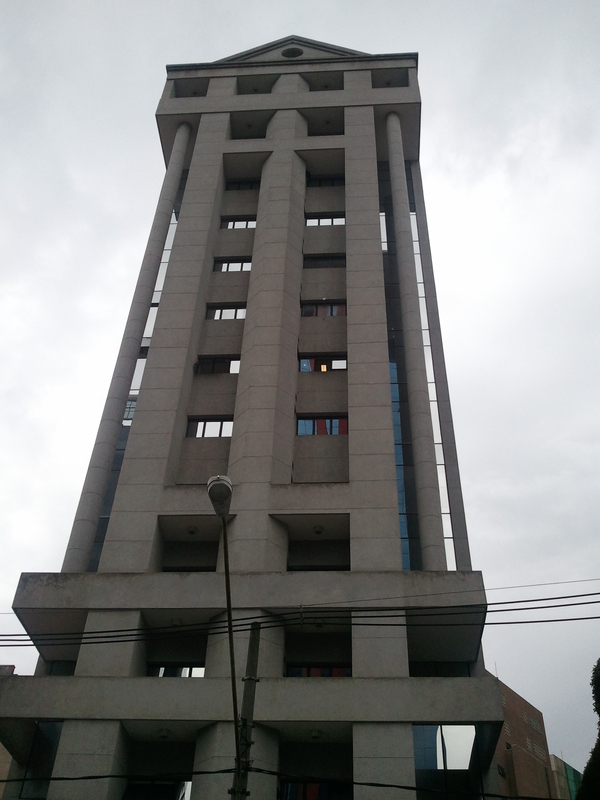 The older buildings are gradually demolished to make way for towers of apartments, with perhaps a commercial element included. 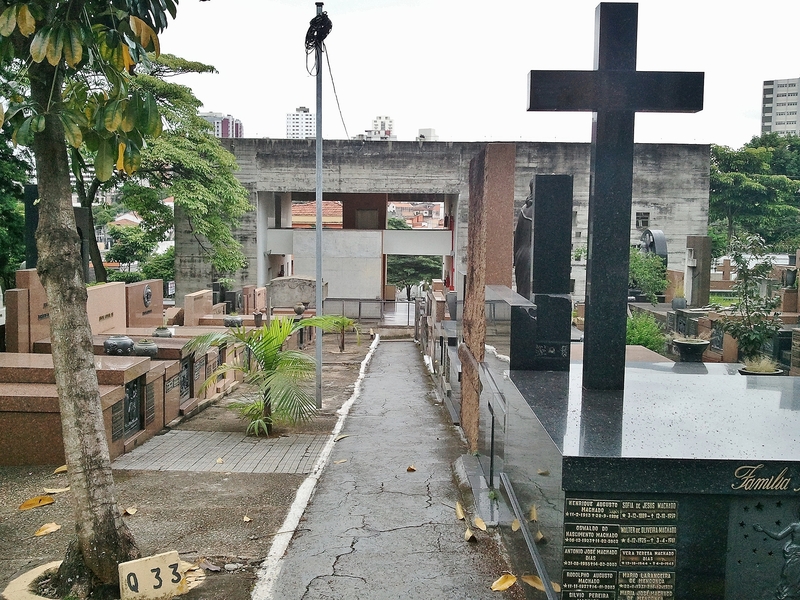 This process is not always straightforward – the redevelopment of Avenida Faria Lima in the 1960s, for example, met with some resistance. 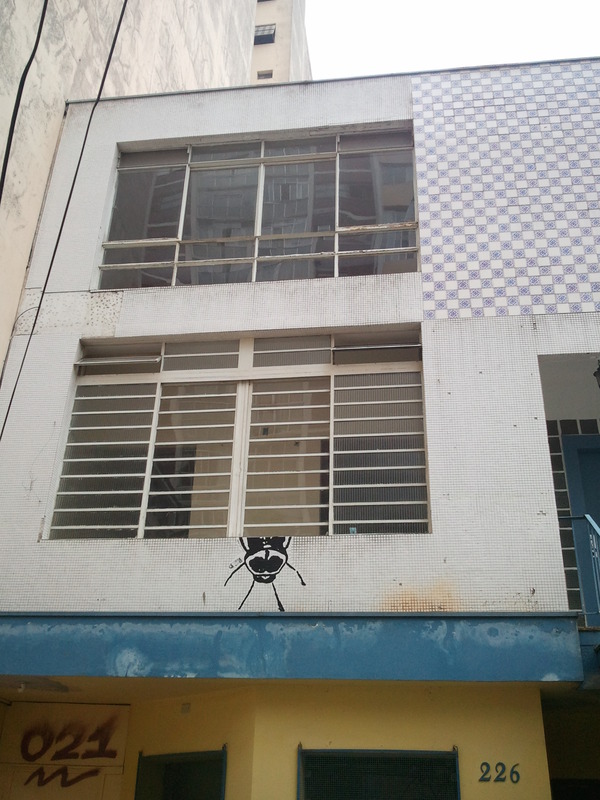 See https://theproverbial.org/2012/08/16/regeneracao-gentrificacao/ . 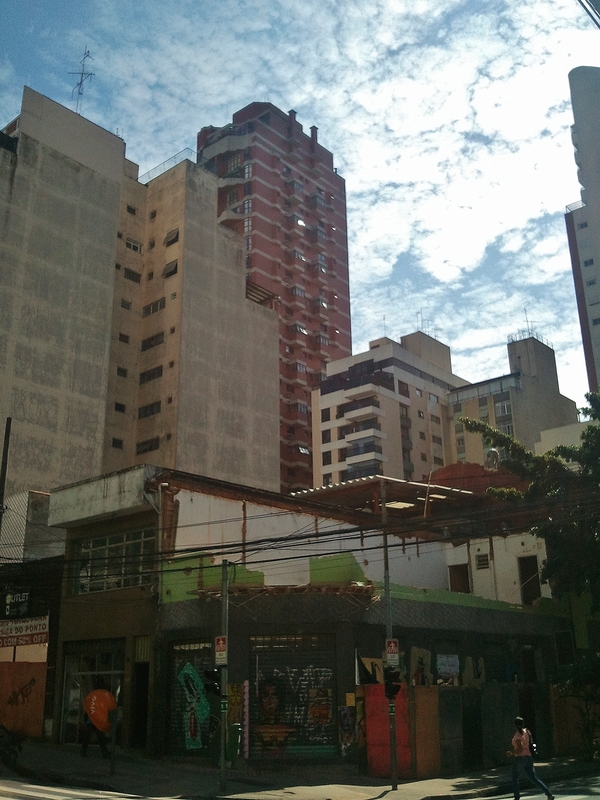 On the corner of Azevedo and Fradique, one block of buildings has been gradually shut down for demolition and re-development. 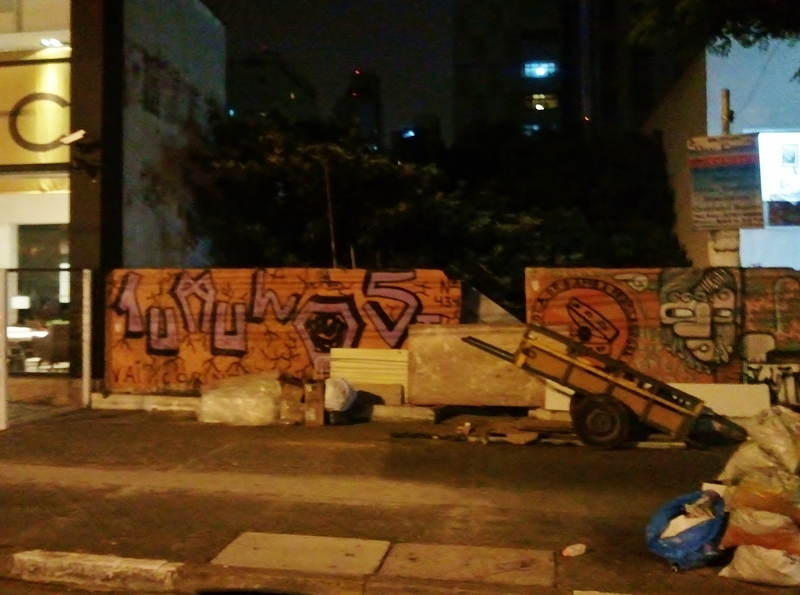 A series of graffiti-style posters has appeared, drawing attention to the site. The female figure was the first to appear, on the traffic control unit, much as they have done in nearby streets, at first painted onto the unit direct. 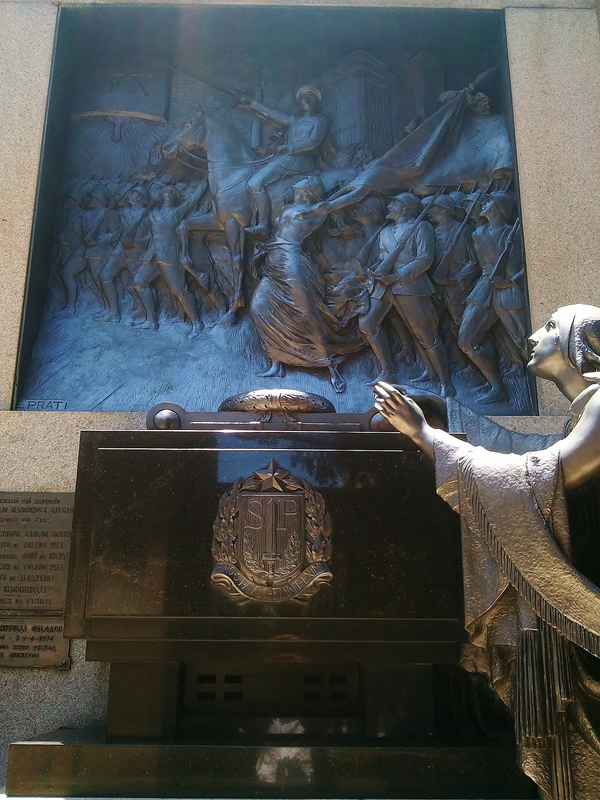 Eventually all four sides of the Azevedo and Fradique unit were covered, security banding adding a randomly appropriate element to the image. 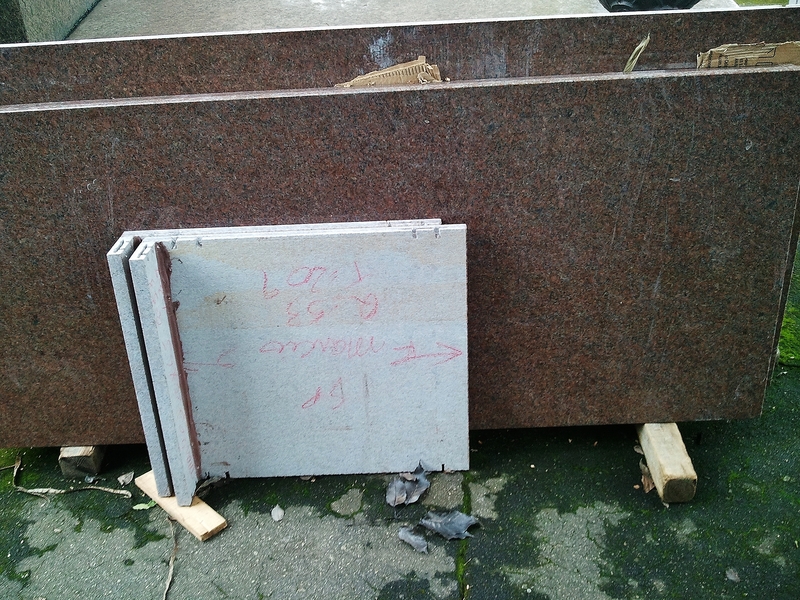 Images on paper had begun to appear elsewhere in the neighbourhood. As buildings fell vacant, the images spread, much as their real-life subject might do as they are disturbed by demolition. The instinctive revulsion most people feel towards cockroaches was deployed very effectively in this piece of guerrilla art. 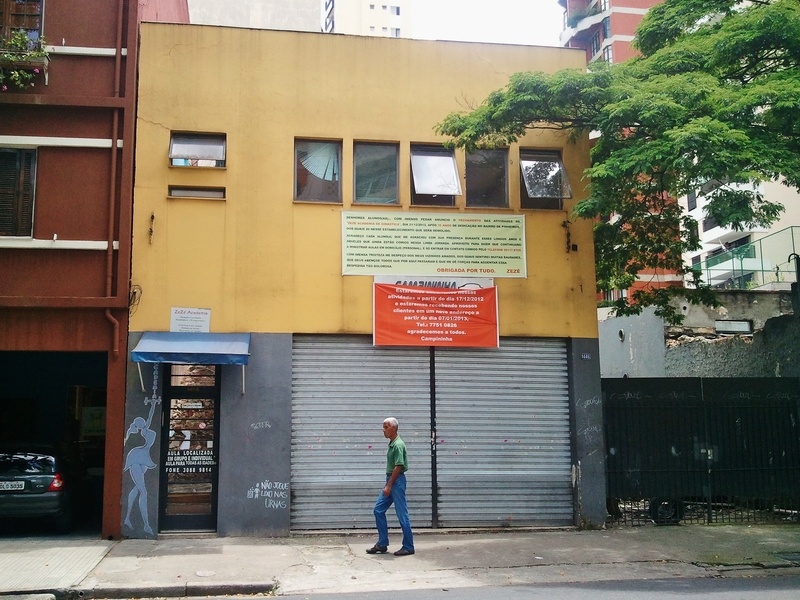 Zezé of the gymnastics academy had been above the shopfront on Azevedo – latterly an automotive workshop – for 35 years, and bid her students and neighbours a sad farewell. 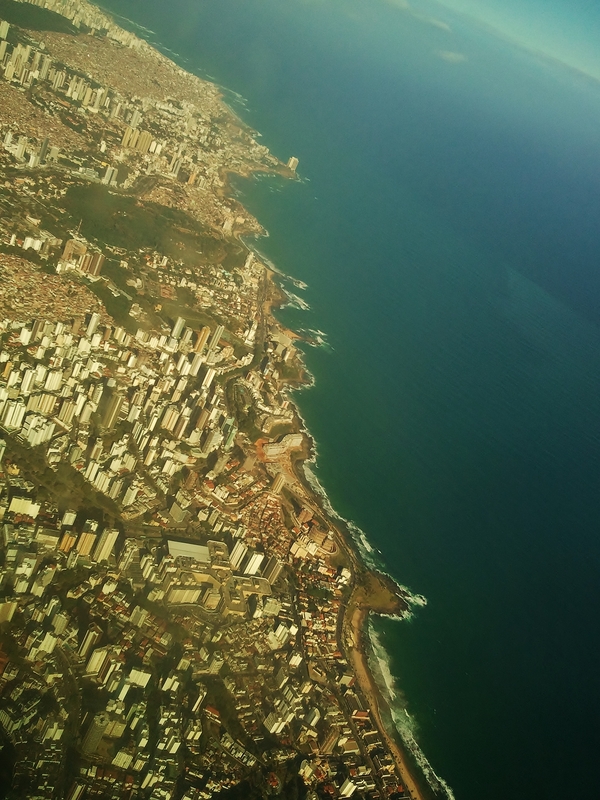 This development is symptomatic of a deep-seated issue in Brazil – the ownership of property. Business owners often do not own their premises. The goodwill they build up over years can be destroyed with little notice to make way for a more profitable development. 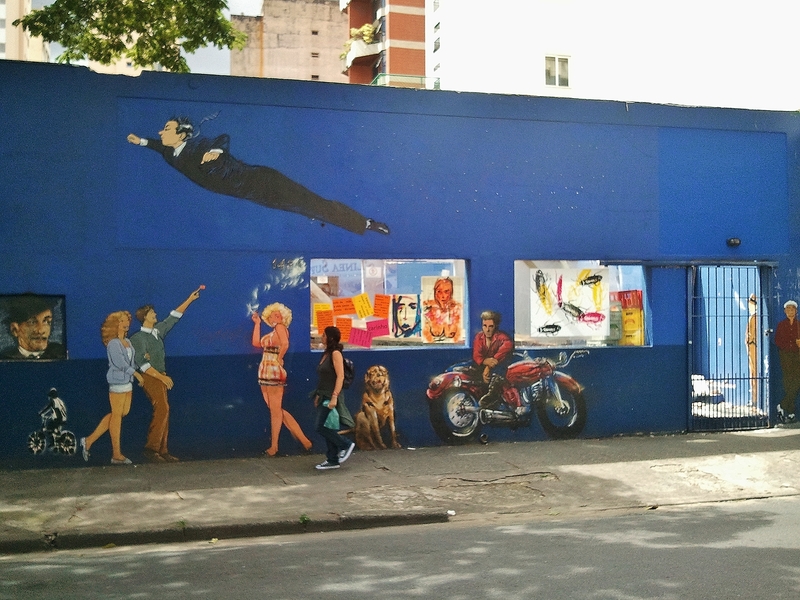 A year ago the artist put the finishing touches to the mural on the local pool hall, also established about 30 years ago (the leaping / floating man against a blue background an homage to French surrealist Yves Klein – see http://tudosobretech.wordpress.com/2012/11/11/exposicao-a-fotografia-manipulada-antes-do-photoshop/ ). Whatever benefit the new building delivers, I doubt it will be as characterful as this establishment. Are the graffiti artists the only ones to mourn its passing? UPDATE Demolition is well under way. 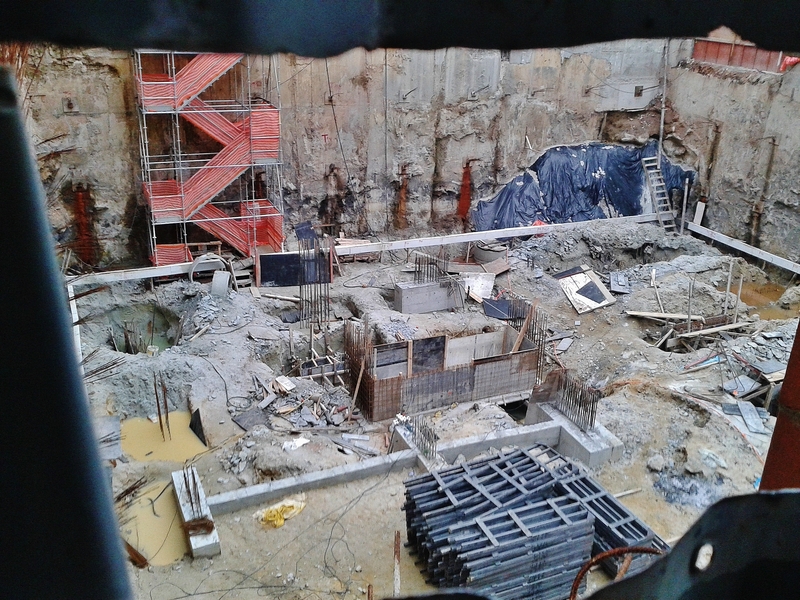 A hole in the fabric of the city, soon to be filled by another vertical. For a moment, the unadorned sides of cast concrete buildings are exposed. Here’s the hole in the ground from which the new tower will be built. 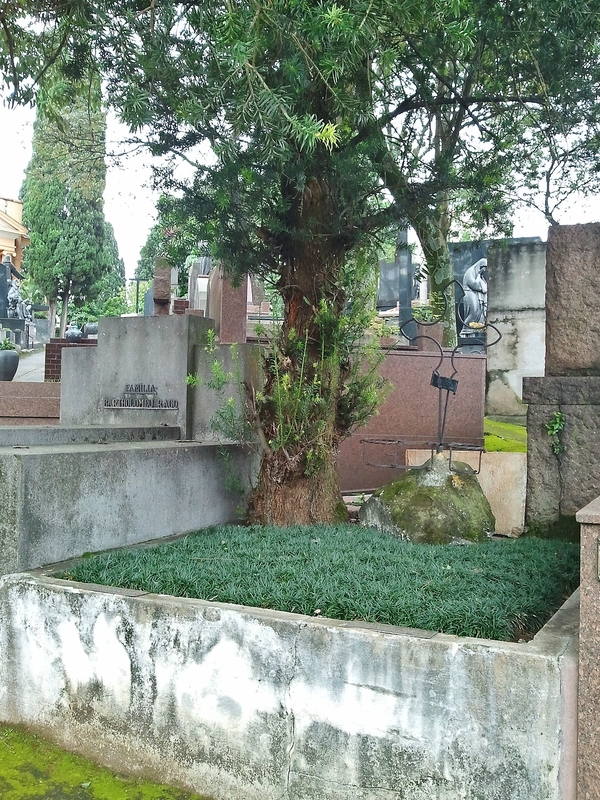 In a previous post https://theproverbial.org/2012/11/19/sao-paulo-necropolis/ I sketched the history of a leading cemetery, the Cemitério São Paulo on Rua Cardeal Arcoverde. 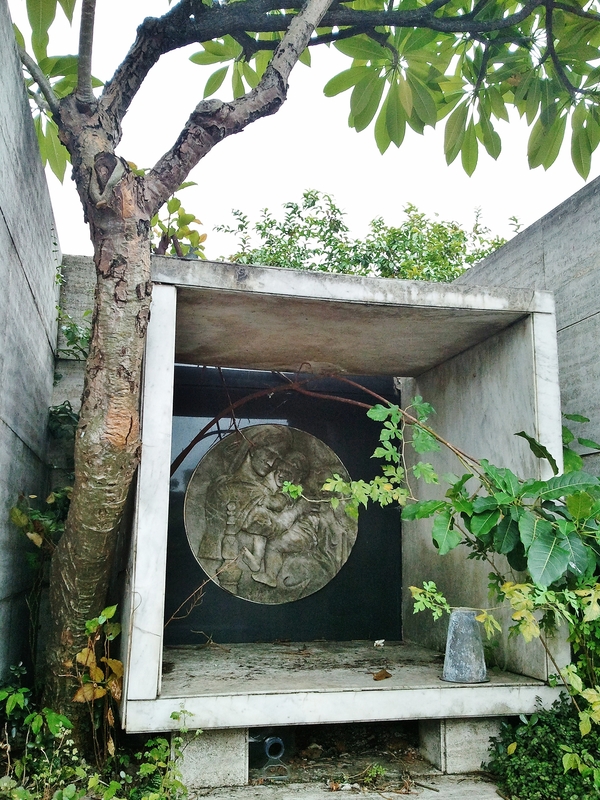 I went back on Sunday for a stroll – it’s a quiet place in a noisy city, its sculptural works are some of the most impressive to be seen, and it’s a noticeably green spot in the concrete jungle which surrounds it. Arriving early, you encounter the destitute who sleep in the shelter of the grand graffiti-ed entrance porch, with blankets, cardboard and plastic for warmth. Some also use cachaça – sugar cane spirit – perhaps mixed with soft drink. 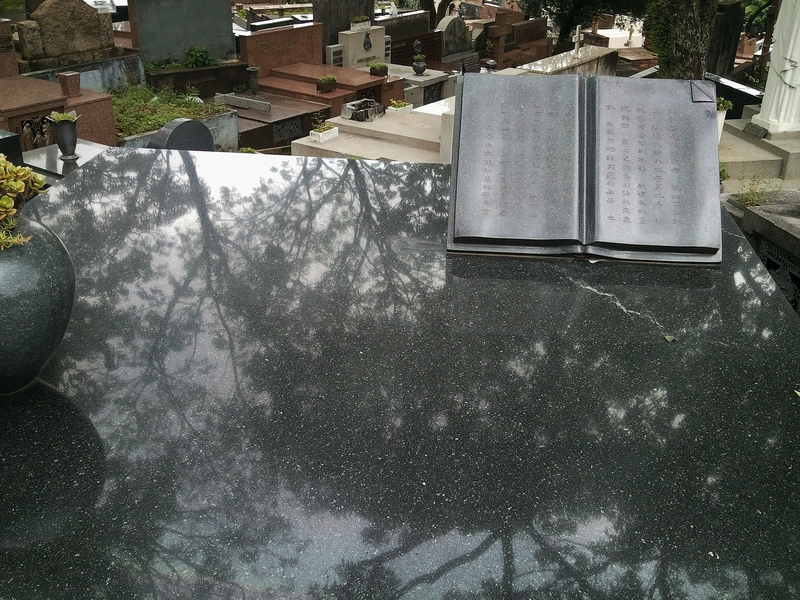 In this setting, one is more inclined to think “There but for the grace of God … ” than to condemn. 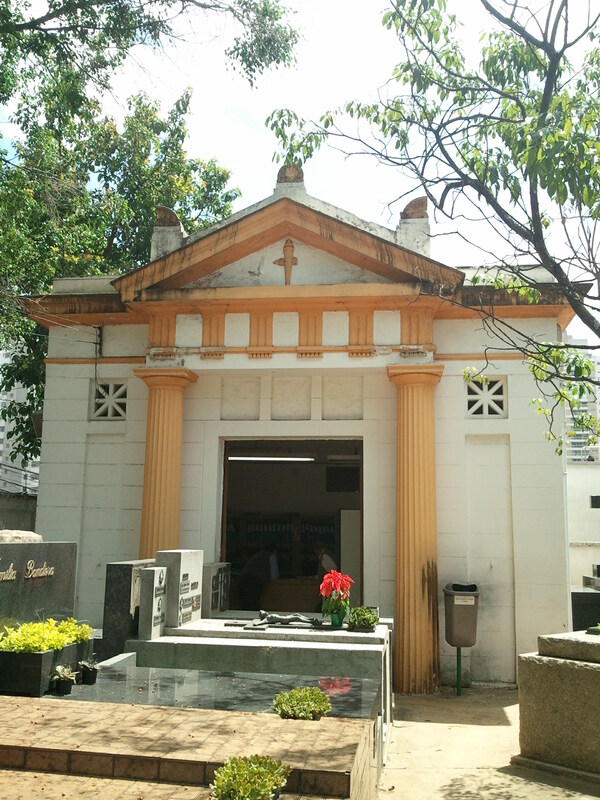 Rua Conego Leite which leads to this entrance suggests the cemetery’s former grandeur too – a terrace of picturesque Art Nouveau villas hides under painted motley, a neo-classical loggia on one corner of the crescent facing the entrance echoes the porch’s style. Inside the cemetery there are signs of life too. 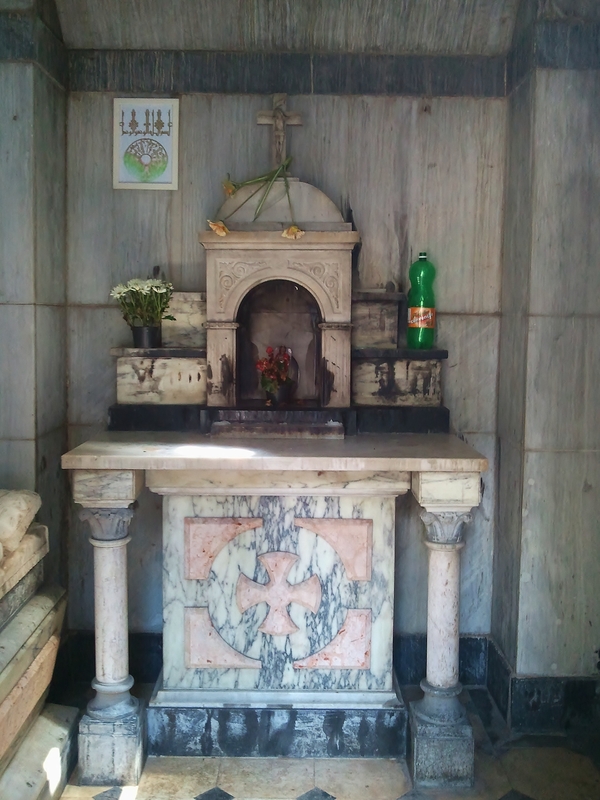 I explored another corner this time, and beside a plot too small and awkward to use I found a kind of living space and home-made shrine on the niches for cremations, where a sheltering tree grows. The trees and plants, here by accident or by design, are in good shape. 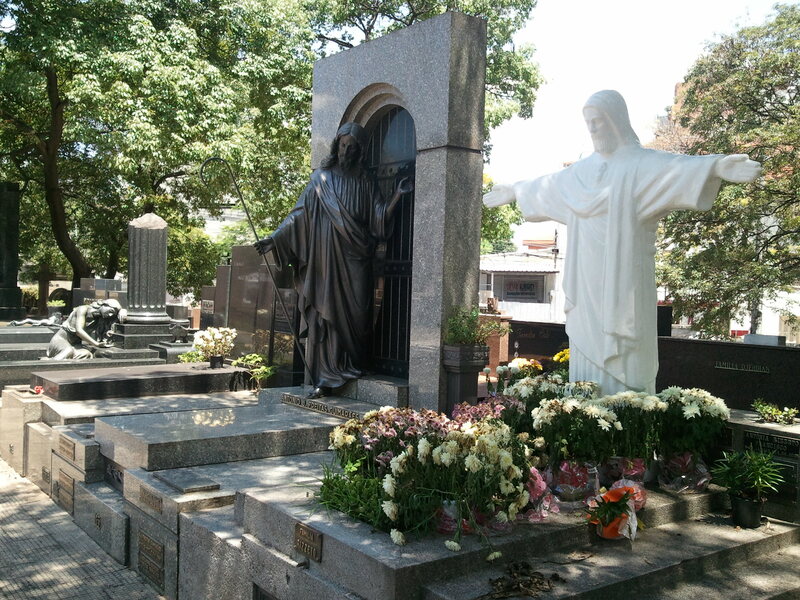 The cemetery is thronged with the usual devotional and memorial sculpture – vistas of Christs interspersed with Pietas, the occasional Madonna and Child, grieving families, and a scattering of angels. More unusual examples stand out in this feast of sculpture. 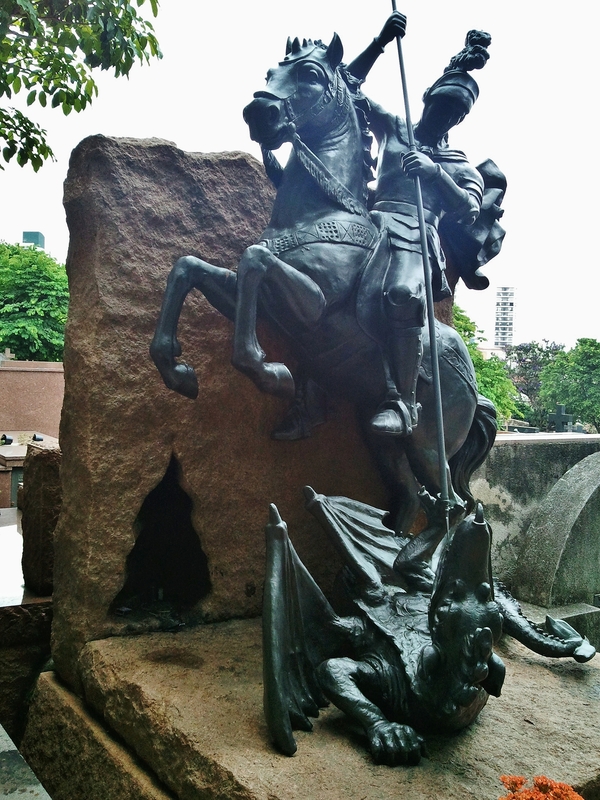 An imaginative approach to sculpture is not restricted to the human figure here. 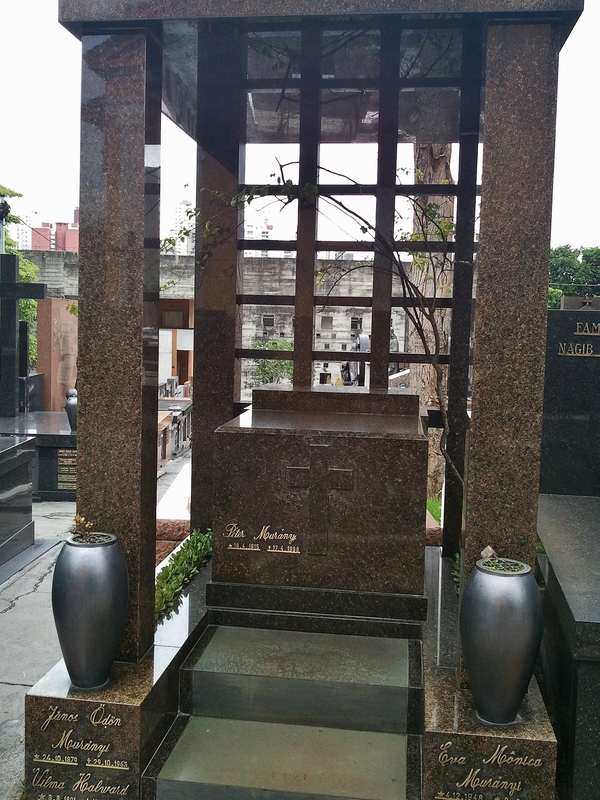 Contrasting colour, shape and texture – an arabesque of carved marble against a slab of dark polished granite – the use of arch- and box-shaped space, the integration of plant life with stonework, even the varying treatments of the plinths, all display the keen Brazilian sense of the visual. 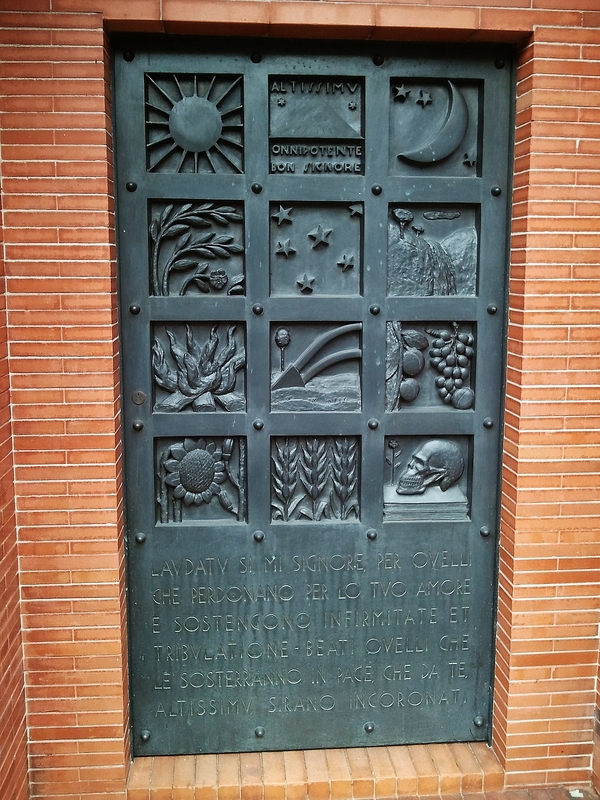 The symbol of the opening door recurs. 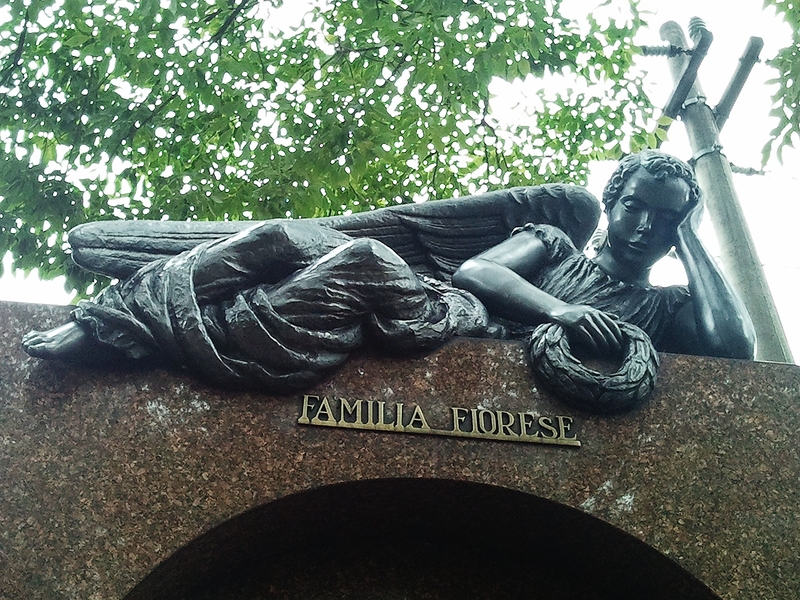 … or serve as a sculptural reminder of a first-rank family. 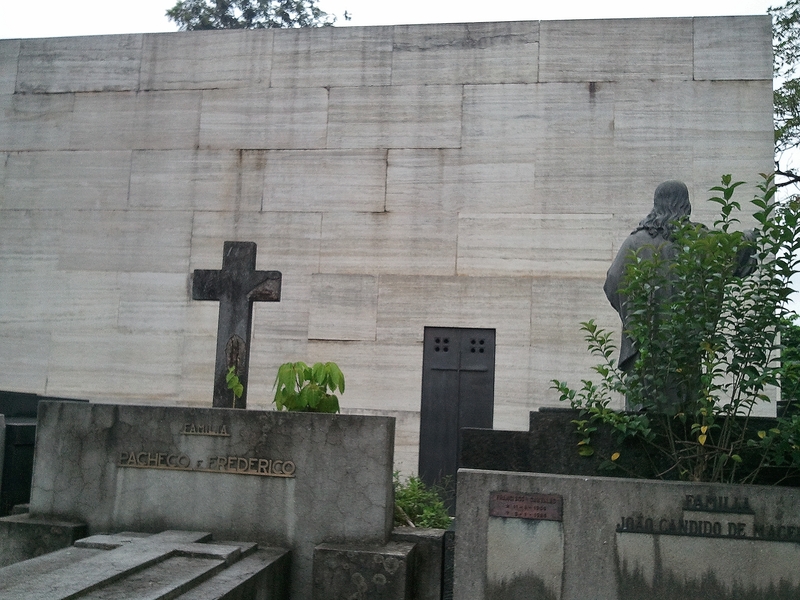 (Front-facing view on the crest of the hill in my previous post https://theproverbial.org/2012/11/19/sao-paulo-necropolis/ ) The northern entrance at the bottom of the hill echoes the idea with a more prosaic but nevertheless striking composition in raw concrete. It’s an effective background to another innovation, stone trelliswork which echoes the pierced wall of concrete and also integrates plant life. 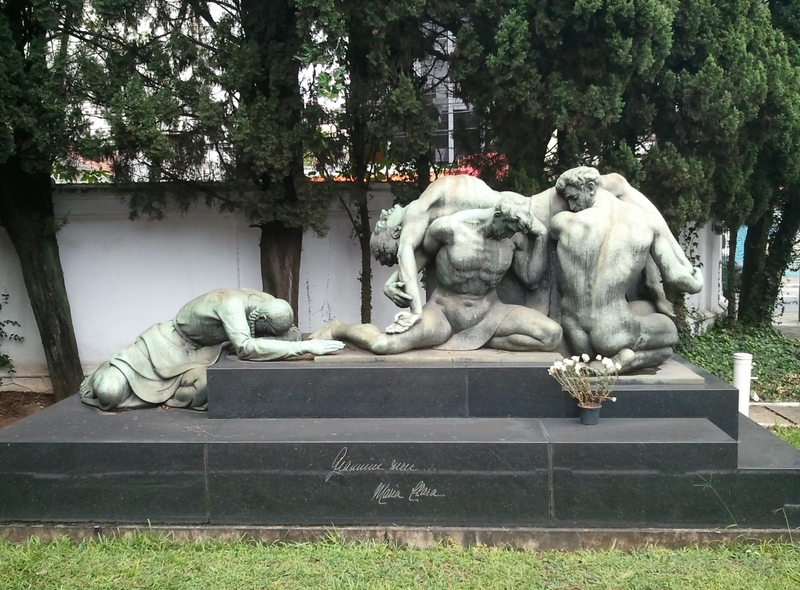 This memorial alerted me to yet another Paulistano immigrant community, the Hungarian, and with the same ‘thoughtful integration of plant and stone’ as the box-shaped Hungarian memorial above, made me ask if I was seeing a Hungarian aesthetic. 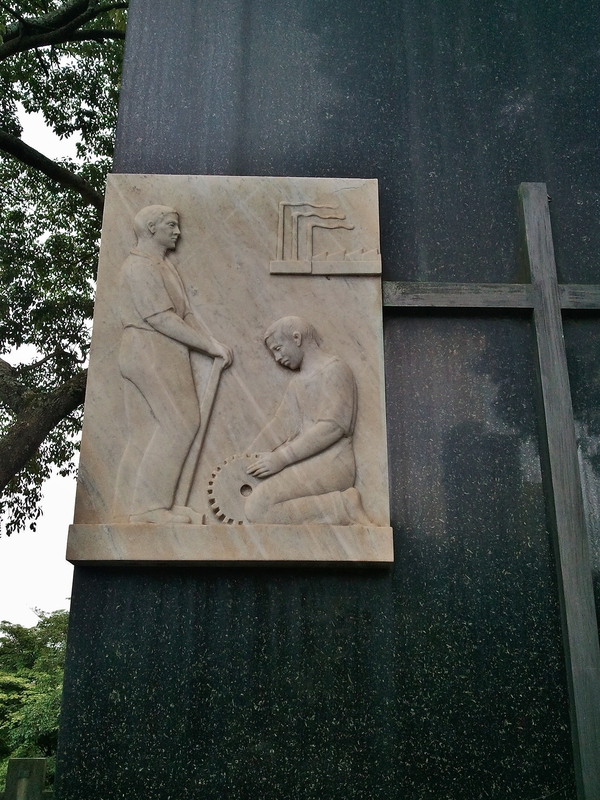 … or a more symbolic portrayal. 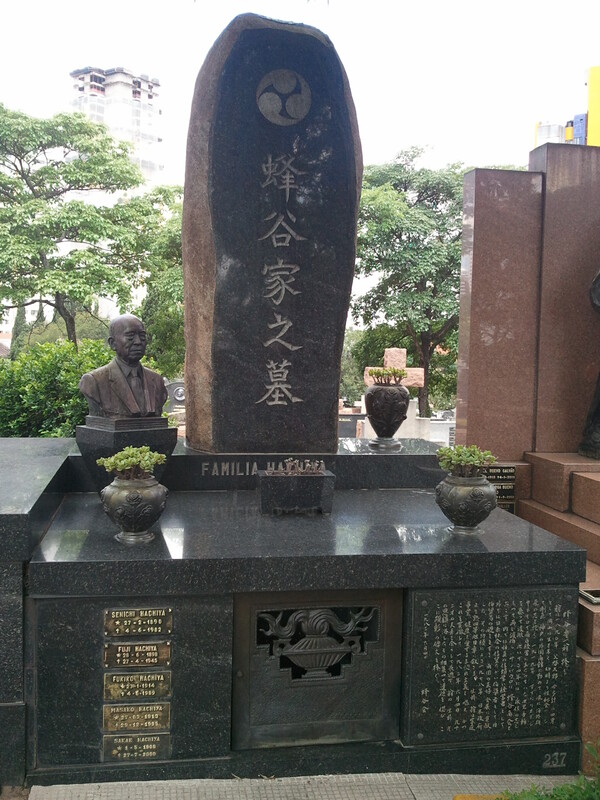 Purely cast bas-relief can also be found. 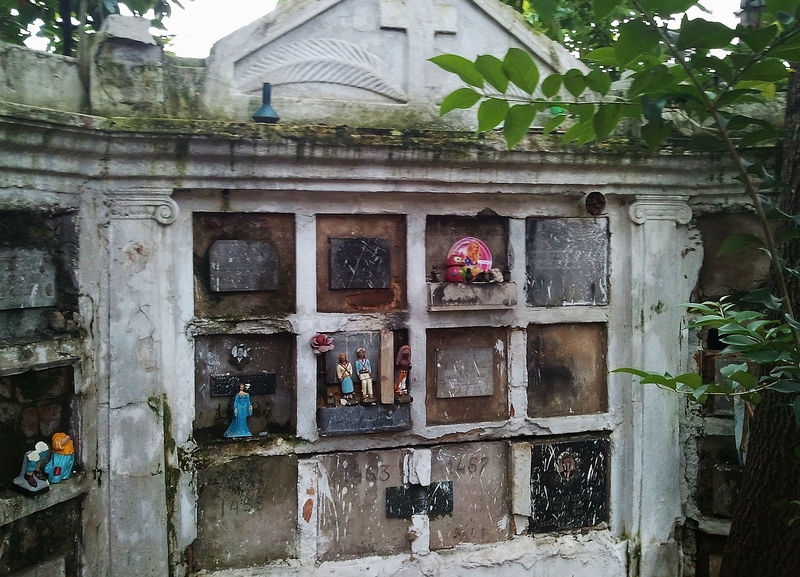 There are signs that people occupy themselves in varied ways here – placed on the back of one tomb I saw a collection of broken pieces of white marble, and imagined children amusing themselves by collecting them while older family paid their respects and browsed. The staff inter the dead, but they also gather fallen branches, build and make repairs, clean the tombs with feather dusters. 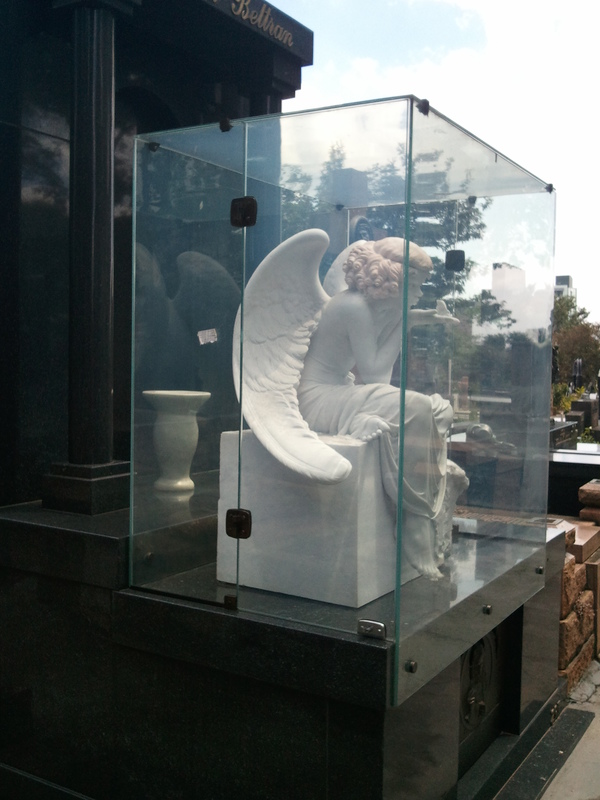 If you visit as I did not to bury or to pay respects to family or friend, nor with a morbid urge, it’s the sculptural aspect which is so striking. A range of examples illustrate the point. but equally for its finely judged expressiveness. This is a portrait, an archetype, and a spiritual ideal. 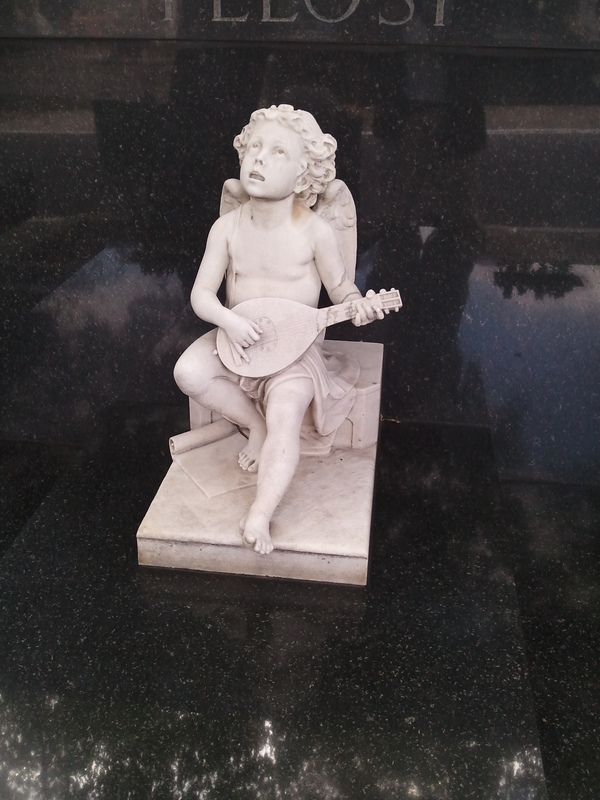 It sits quietly amidst the ritual and the workaday aspects of the cemetery, a beautifully executed artwork. 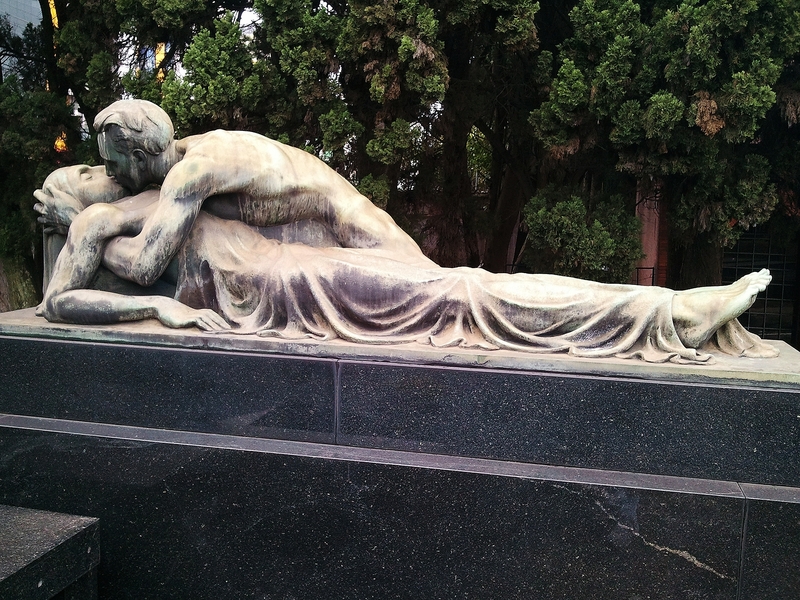 Memorial sculpture can be showily theatrical or surprisingly frank here. 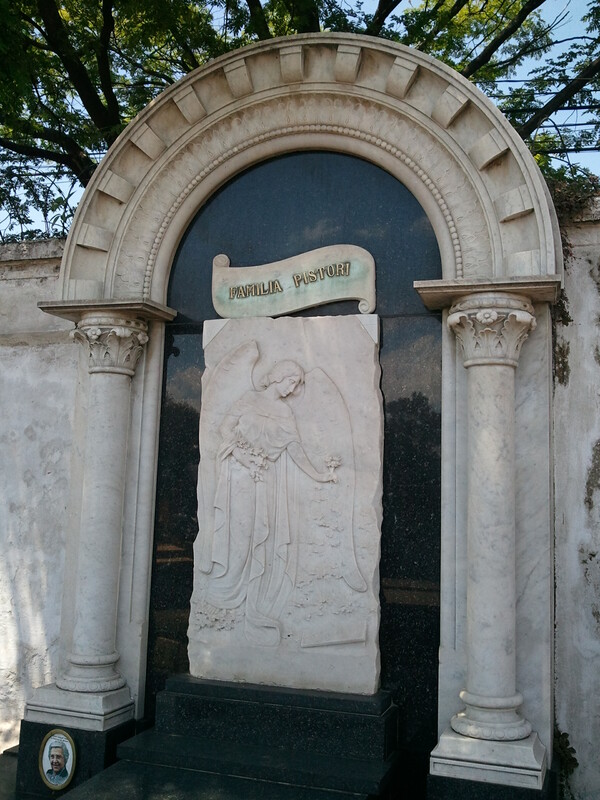 On the ridge of the hill, a well-known though less direct work by another Italian Brazilian sculptor is known as the Túmulo do pão, the Tomb of Bread. 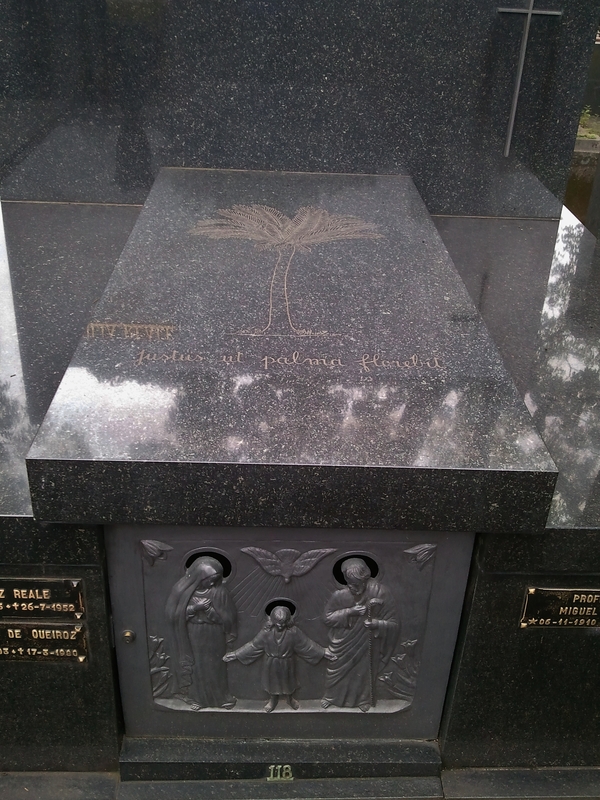 It’s a poignant reminder of the impact of a death in the family. 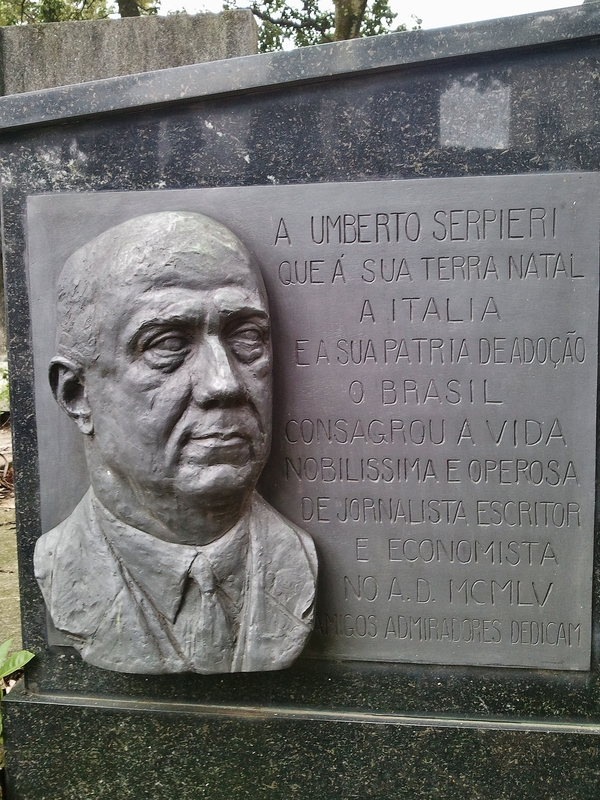 Sculptor of the military obelisk in Ibirapuera Park which commemorates the 1932 Sao Paulo Constitutional Revolution, Emendabili is of course popular here. This smaller-scale, more private work has a huge impact. 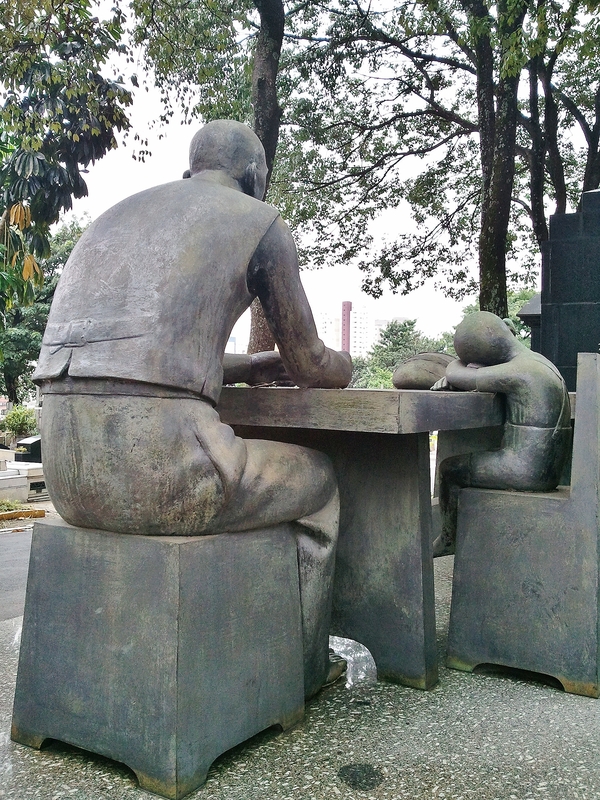 The pathos of the boy’s head on the table and the stoical grief of the man are beautifully conveyed. Staged to make full use of its setting, giving the same symbolic weight to the table and to the loaf of bread as to the human figures, this is a tour de force, one of the strongest in an impressive collection of sculptures which stand the test of time. 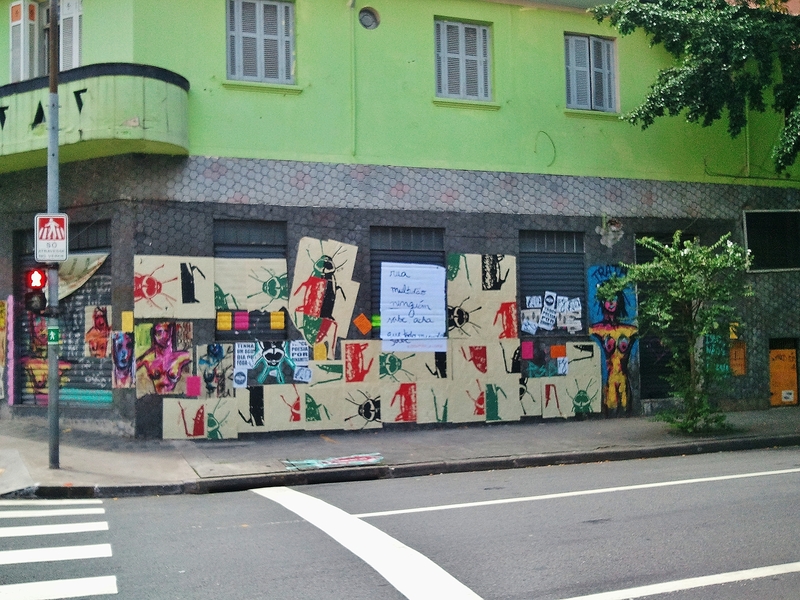 Walking down Rua Cardeal Arcoverde, at the gateway to the bar-and-restaurant-mecca of Vila Madalena in Sao Paulo, I stumble upon artistic traditions, old and new. I’ve been this way before, and enjoyed the street art along a roughly-built brick wall flanking a car parking site. 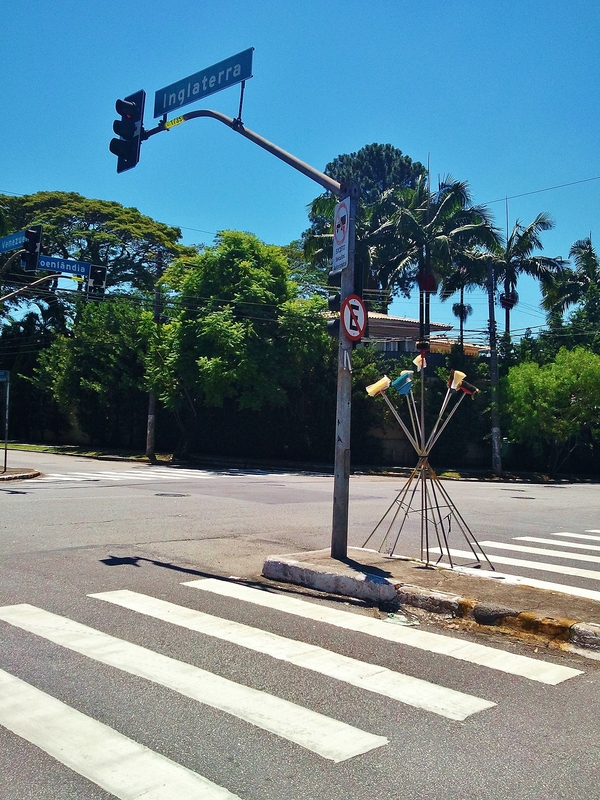 As so often in Sao Paulo, the open space is fleeting, temporary. Car parking is a way of making real estate cover its costs until you can make it really pay, by building an apartment block on it. 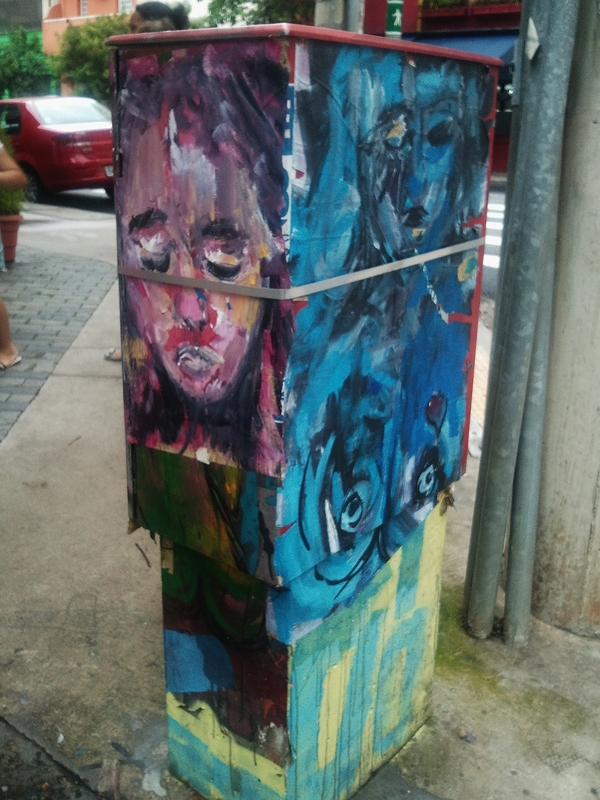 The street art may have been superceded, but something catches my eye. 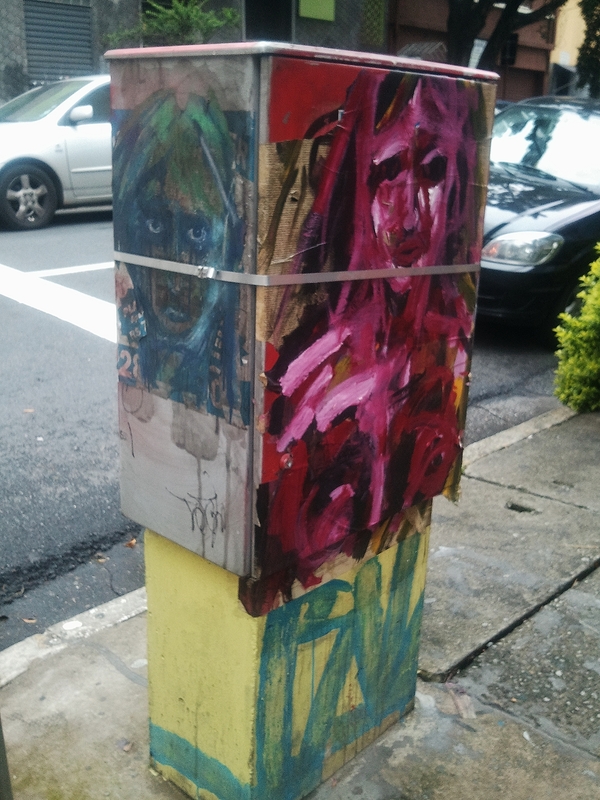 I’d noticed a form of street art recently which had made me smile – images on paper flyposted to the street wall. It seemed appropriate, given the subject. Here was a whole nest of such images – maybe this was from where the other had migrated, or was I seeing a new trend emerging? ‘Xilo print’ is Portugenglish for woodcut print. From this shopfront a group of artists produce and sell printed T-shirts, prints on paper, and printed canvas bags and cushion covers. Blocks are cut by hand into MDF (medium density fibre-board) and stored in racks in the shop – they print a shirt while you wait. The images are cultural icons – musicians, artists, actors, cinema characters, signs and symbols, the ever-present sexual images. 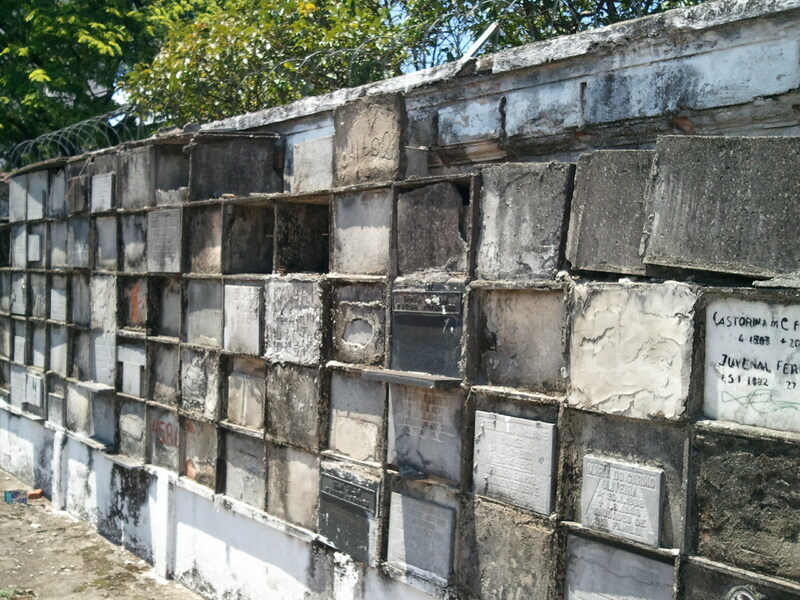 Old blocks are built into the decor of the shop. And they offer woodcut printing classes. There are originals for sale too, mixed media on paper, displayed hanging by bulldog clips from nails in the wall. High art appears among the cultural icons, from Leonardo to Magritte. I mention the now-obliterated art across the street, and I’m told that the harlequin figure – see above – was by a Spanish artist. These folk care about their art, and they make it pay too. What’s more, Xilo Shirt is in a little cluster of original clothing shops, all decorated in the distinctive manner of Brazilian street art while blending seamlessly with the ‘native’ graffiti. A car mechanic’s wall next door sports a colourful satirical piggy bank next to a blue octopus with a manic grin. . 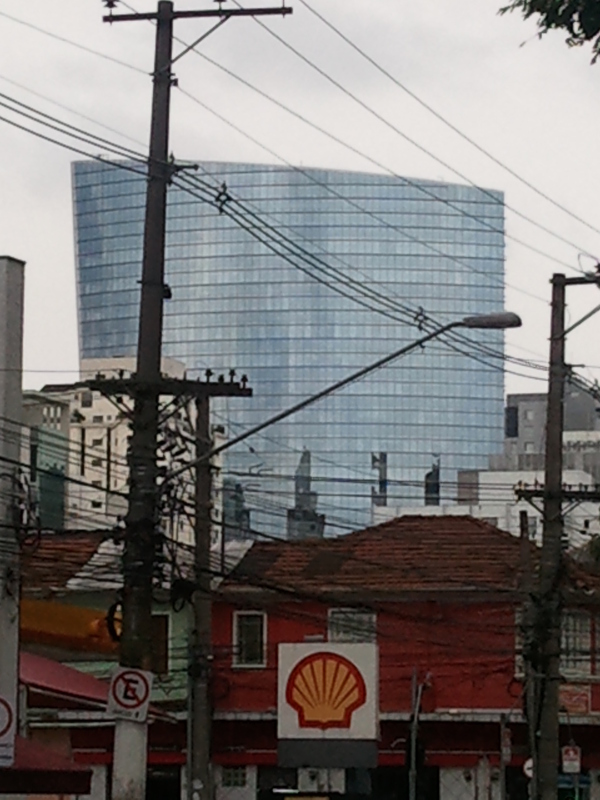 The combination of outspoken visual brio and entrepreneurial energy strikes me as characteristically Brazilian. You sense the huge potential of the culture, especially when you consider the country’s immediate economic prospects. What was less expected was a glimpse of the past. Further down Cardeal, there’s a basement shop which has always intrigued me. It’s a jumble of furniture, architectural fragments, light fittings, bric-a-brac and the odd painting, but I hadn’t seen it open before. 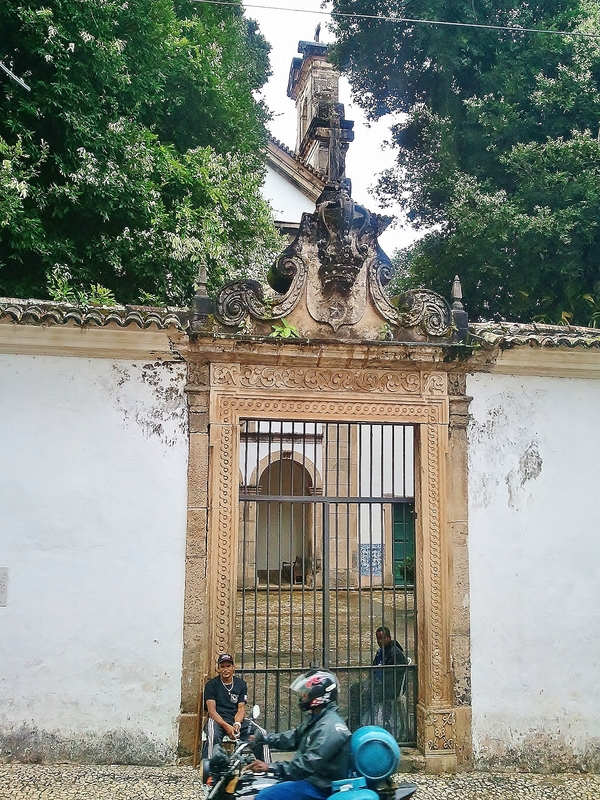 The door was open, so I made my way down a sloping walkway with inset steps – like the entrance to a tavern cellar – and spent an intriguing half hour with the occupants and their wares. Turns out they are restorers of antiques, hence the varied jumble. 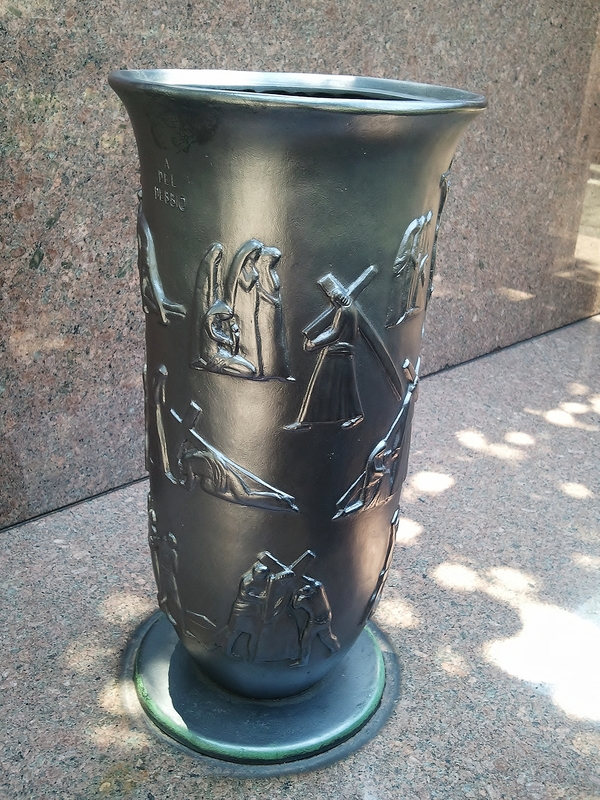 They make objects to order too – a resin Egyptian sarcophagus for someone’s birthday celebration – and carve plaster moulds for novelty figurines. 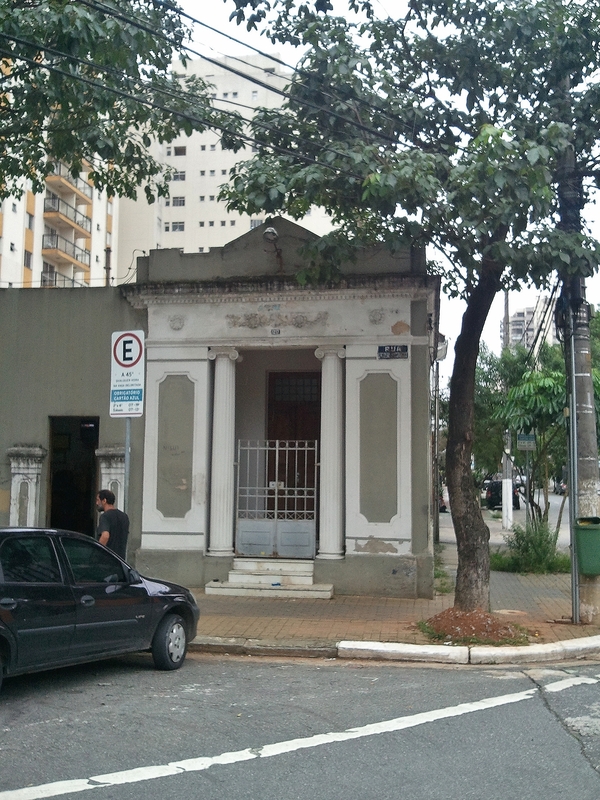 Incredibly dusty, this Aladdin’s cave gave me a glimpse of another Vila Madalena, a fine arts workshop. 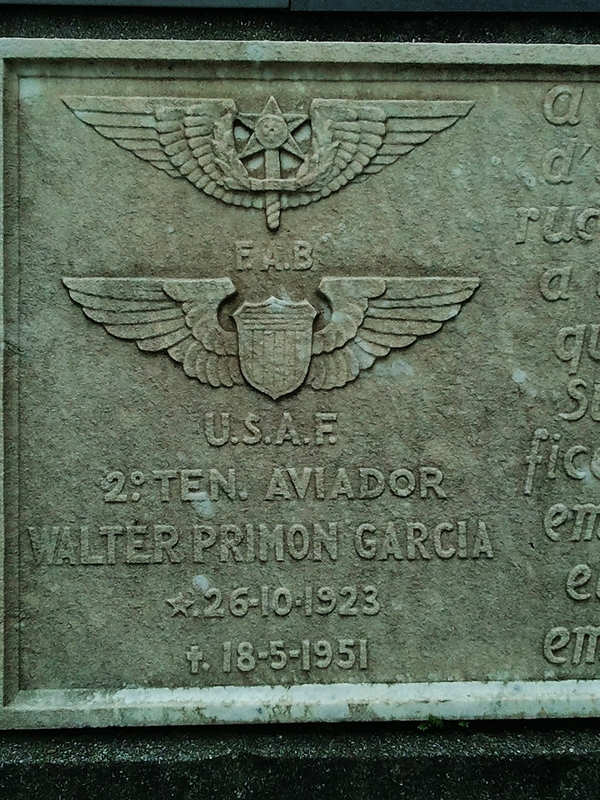 I recall that it’s said that the craftsmen and women working on the Sao Paulo cathedral in the 1920s lived in Madalena. Like planets aligning, the pull of the area became clearer. I saw the street art from a longer perspective. 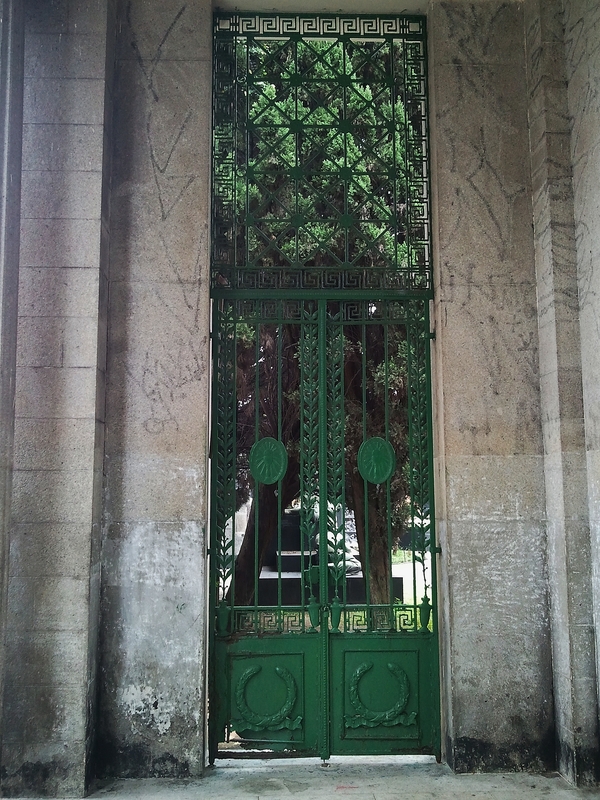 It really is called that … this municipal cemitério has a grand entrance. The street opposite ends in a semicircular crescent, now obscured by commercial development. The shops specialise in antique furniture, appropriately enough, whereas the porch shelters the destitute. 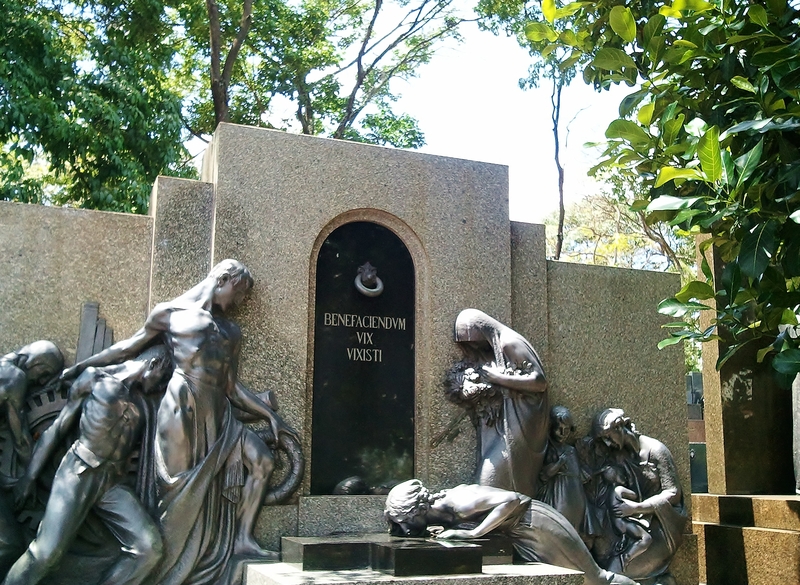 Begun in 1920, since both the Cemitério da Consolação and the Cemitério do Araçá were full, the Cemitério São Paulo extended the opportunity for the socially ambitious literally to build on their reputation with grand tombs and statuary by established sculptors. 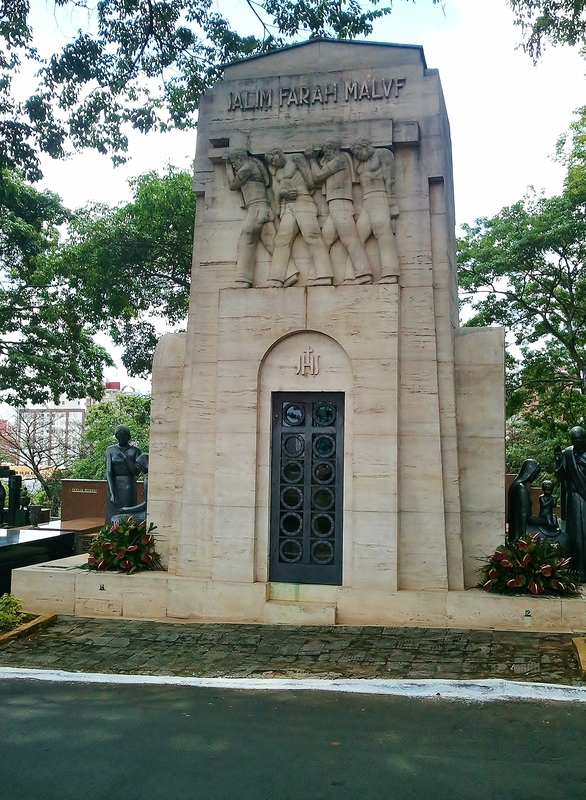 Just past the entrance there’s a well-kept memorial to the combatants of the 1932 Sao Paulo Constitutional Revolution, showing the city’s crest. The gate is a neo-classical composition, matching the chapel and the records office in style if not in colour scheme. 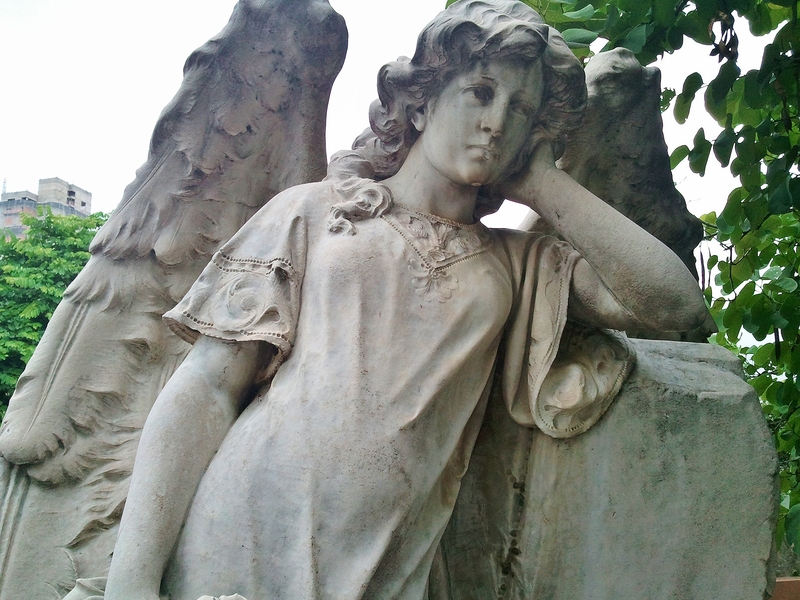 You’re struck by the profusion of statuary, especially of the human figure in every attitude of grief. The sloping site positively writhes with humanity in vistas and avenues. 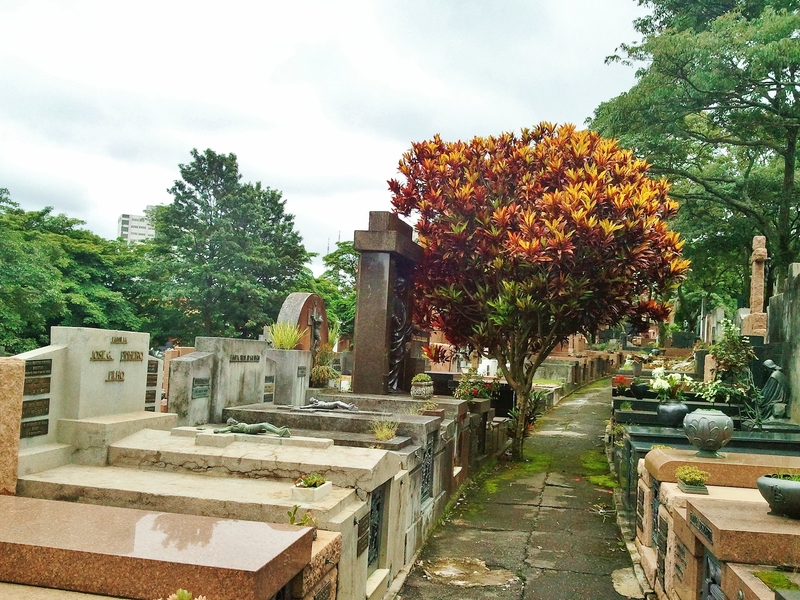 The cemetery is a welcome patch of nature in its urban surroundings, providing quiet, fresh air and cool shade, though as in the surrounding city, every available space is used. … the vast majority are family vaults, and focus on their dynasties from both sides of the family, emphasising the male line. – in this context, meaning accrues readily. 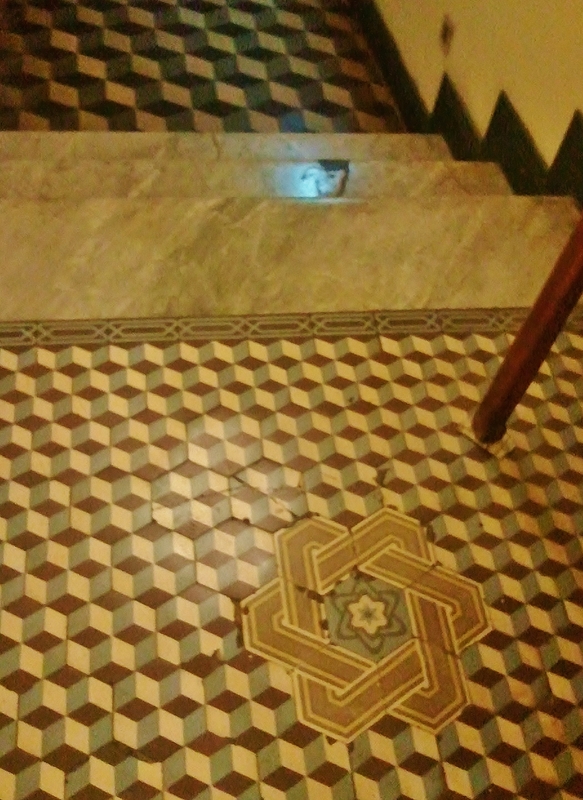 Tile work makes an occasional appearance. 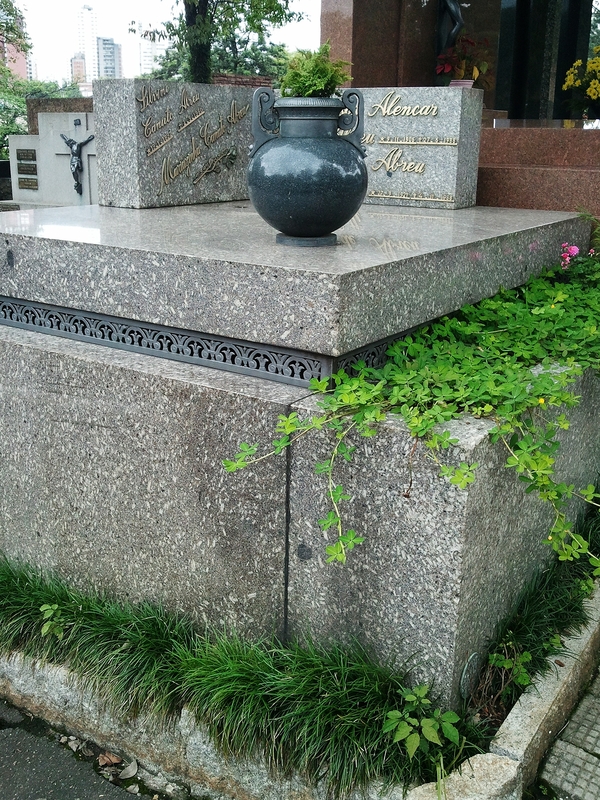 Statuary in metal and in stone is finely wrought. 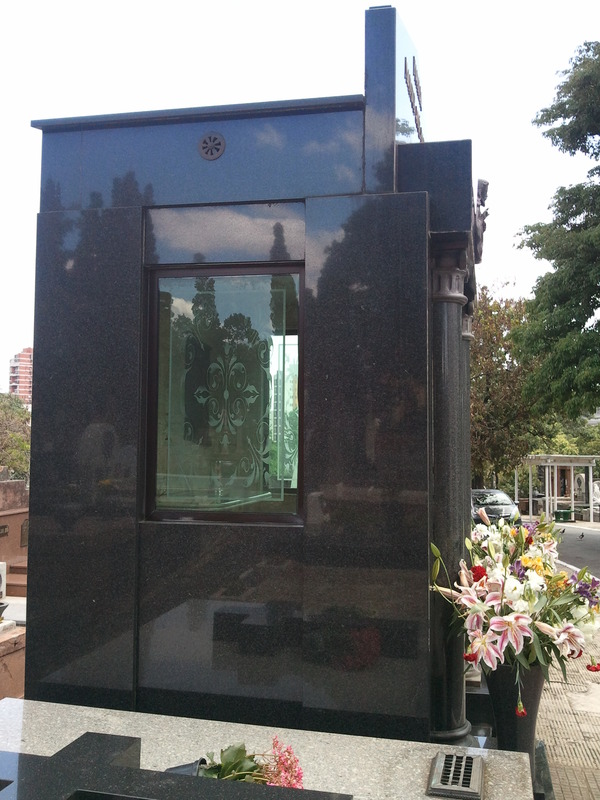 The mausoleums are well built, with careful detailing. 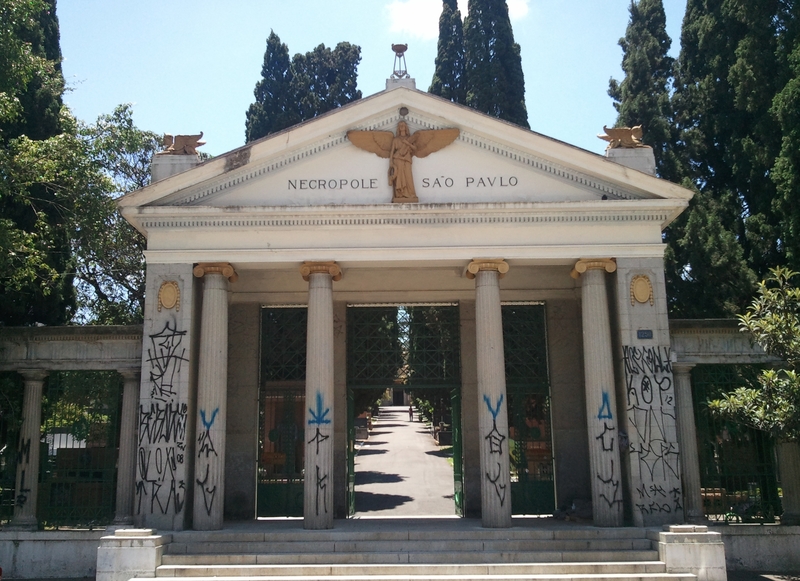 Some measures have been taken against the ravages of the twentieth century – air pollution, for example – and there are almost no graffiti. 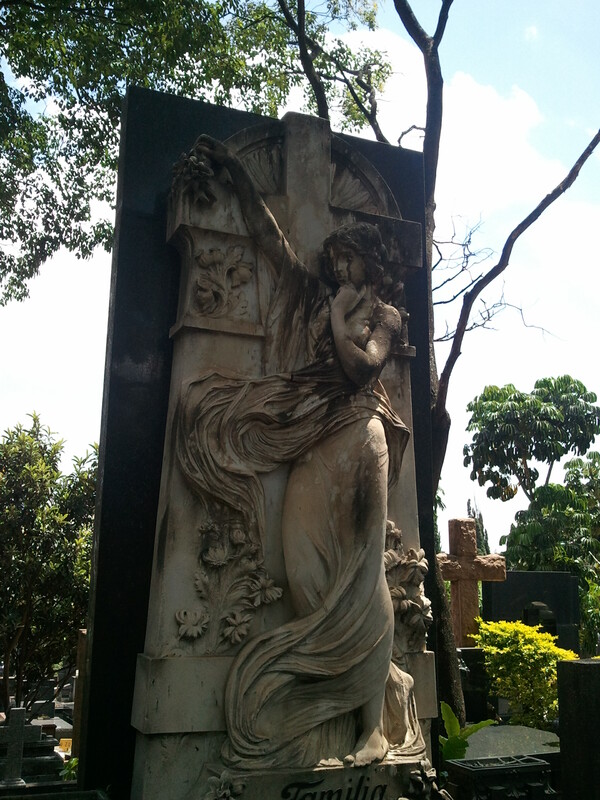 Some memorials were prettily and deliberately conservative in the 1920s. Some embraced the future with a will. Some symbols are updated in style, or used in a less obviously religious way. 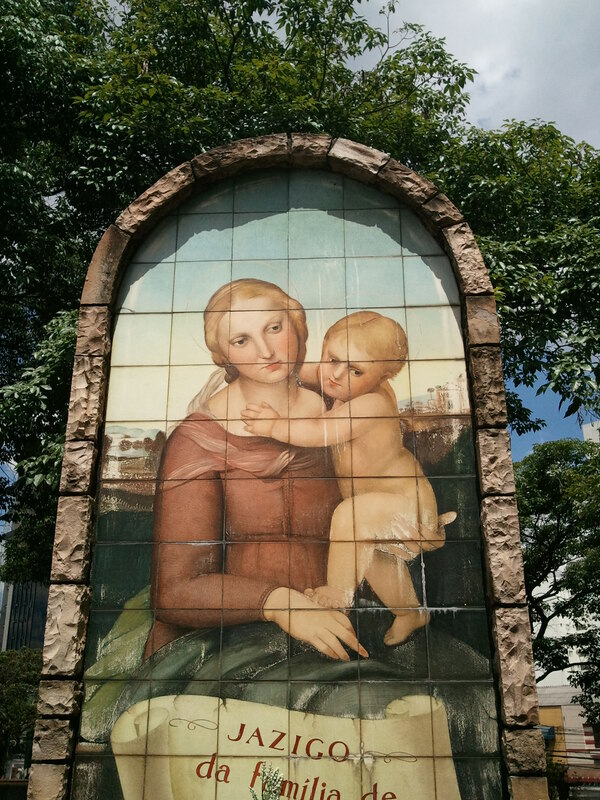 The worship of Mary is a recurring theme in Brazilian Catholicism, with appearances as the Virgin and as the Mother of God. 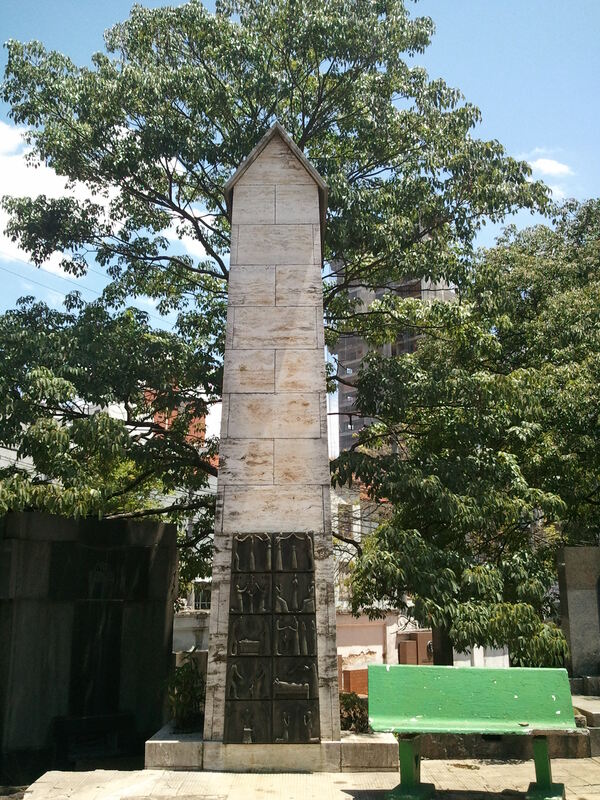 Obelisk or chapel, traditional or modern, family or individual, even Christian or not, all kinds are gathered here. 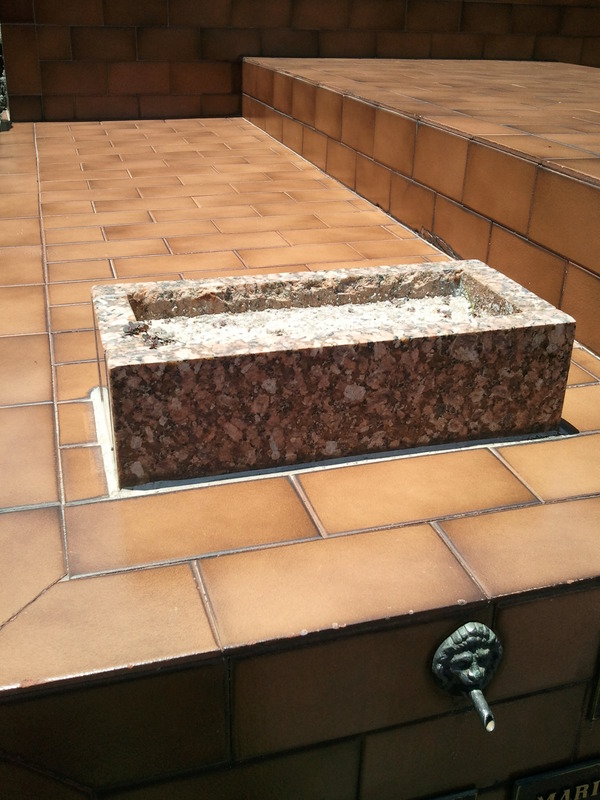 … complete with altar, Islamic inscription, Candomble offering … ? a door does seem an appropriate symbol. – where the tower blocks are commercial, not yet residential. 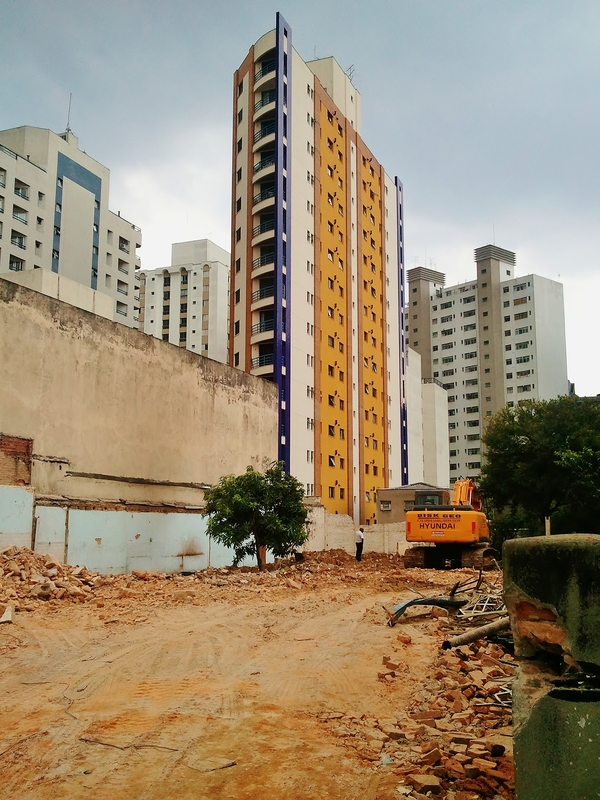 In Pinheiros, residential towers are springing up on available plots, though the apartments being sold off plan are not moving as easily as once they did. You notice that in a suburb like Itaim Bibi, which has been developed as a business and residential district for some time, the property owners and their architects seem to be competing for landmark status. It becomes a bragging contest, in which money talks. The retail branches of banks – they do very well in Brasil on a level of customer service which expatriate Anglo-Saxon customers find surprisingly inadequate – are dotted about the city. Their investment in branch property is modest, but well presented. 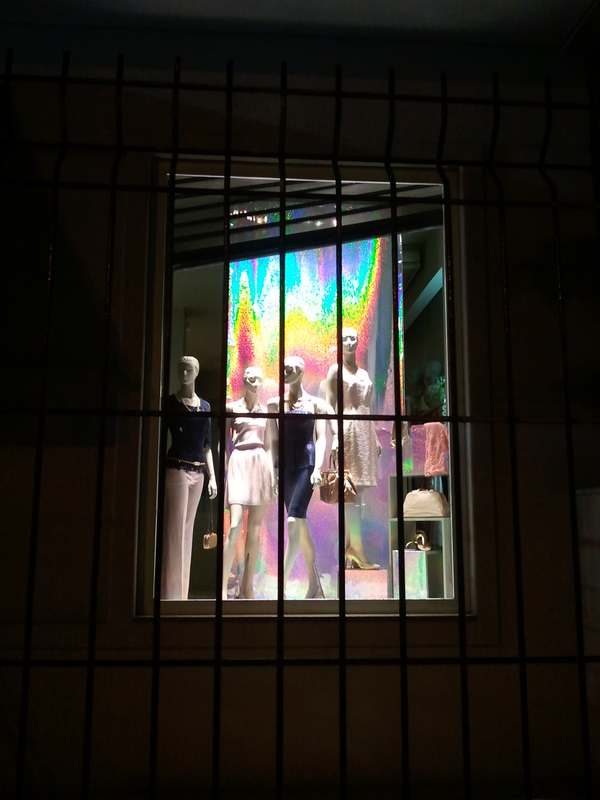 The chic boutiques display their wares cautiously for the emerging middle class. You sense a precariousness about their existence which does not seem to be shared by the banks. Alongside, on the hoardings of building sites, street art flourishes briefly. And in the interstices between developments, the poor make a living. … even book-ended by such disparities in prosperity. Perhaps that is not the problem we perceive it to be. 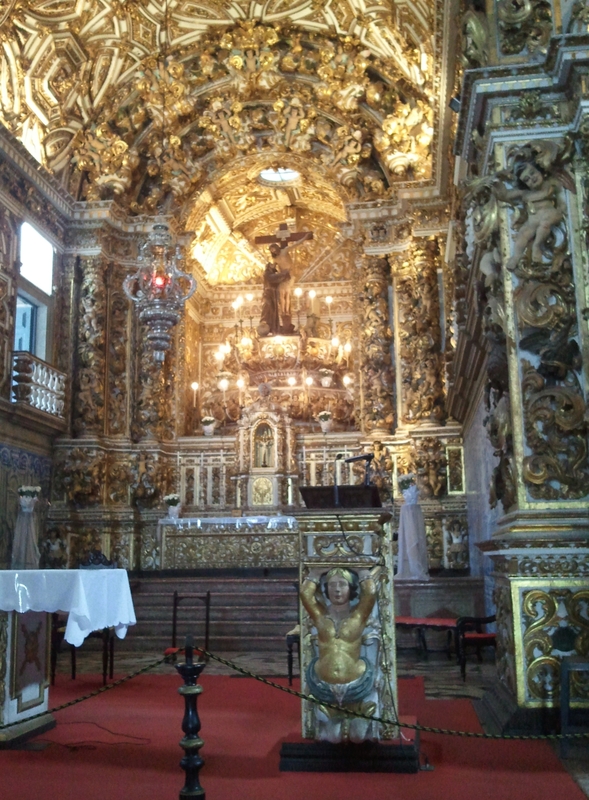 The Church and Convent of São Francisco (Convento e Igreja de São Francisco) in Salvador is a well-known tourist destination – its gilt woodcarving is deliberately and overpoweringly impressive. You may have seen it in Michael Palin’s recent BBC documentary series on Brazil. A church of the Franciscan monastic order, the current buildings were begun in 1686 (the convent) and 1708 (the church) though decoration of the interiors continued through the first half of the 18th century. 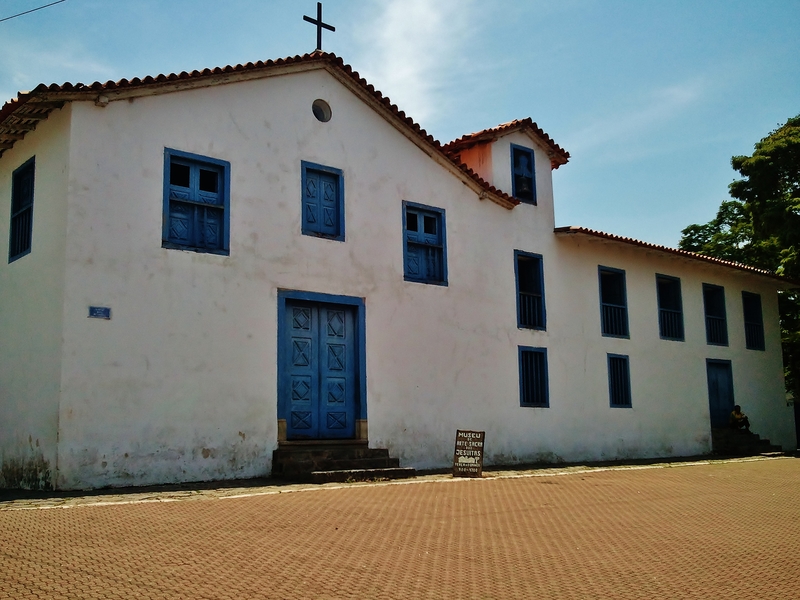 The church is set at the end of a long narrow square – named for one of the first Jesuit missionaries to Brasil in the 16th century, José de Anchieta – off the main square in Pelourinho, the historic town centre. 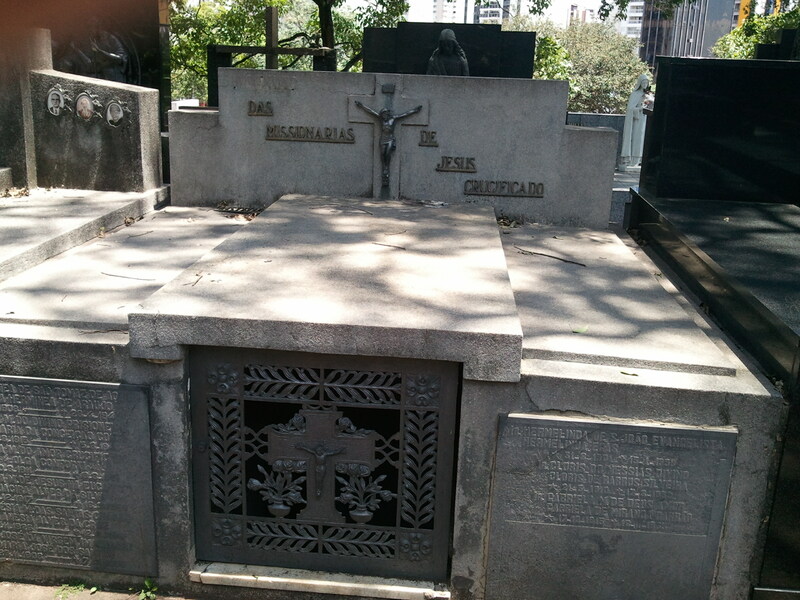 The cross on the praça is a 19th century addition. … though it works well close up. You enter via a porch to the right. 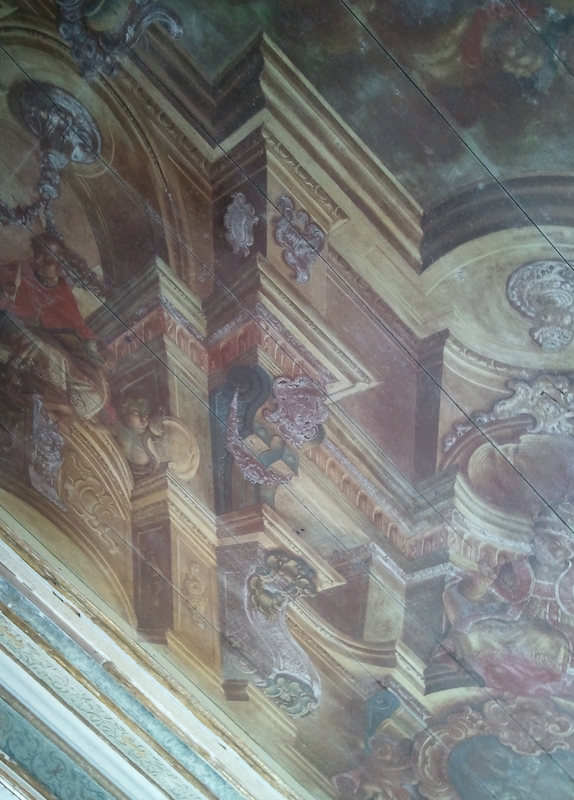 Painted perspective on the ceiling of the porch. 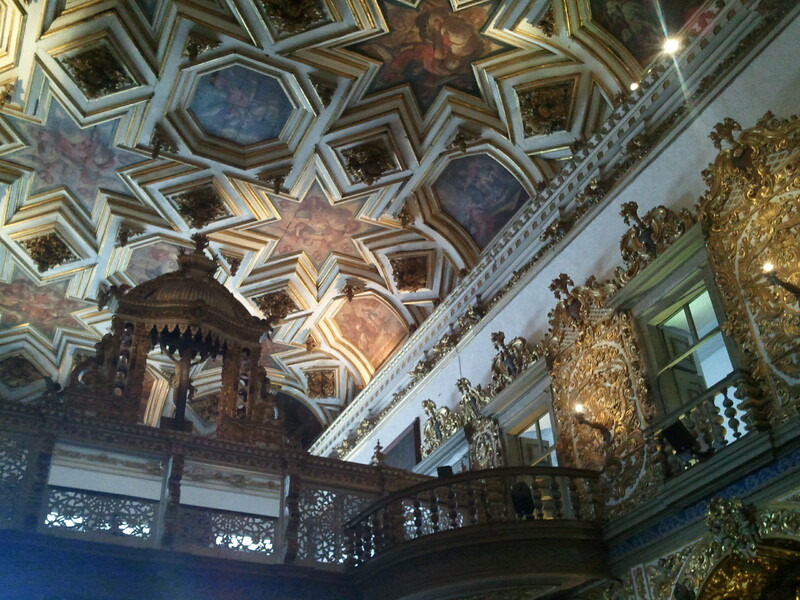 Built between 1749 and 1755, the porch is an impressive piece of interior decor, with panels painted on wood, and a striking illusionist ceiling painted by José Joaquim da Rocha in 1774. It’s a bravura display of skill in baroque composition, albeit in paint. 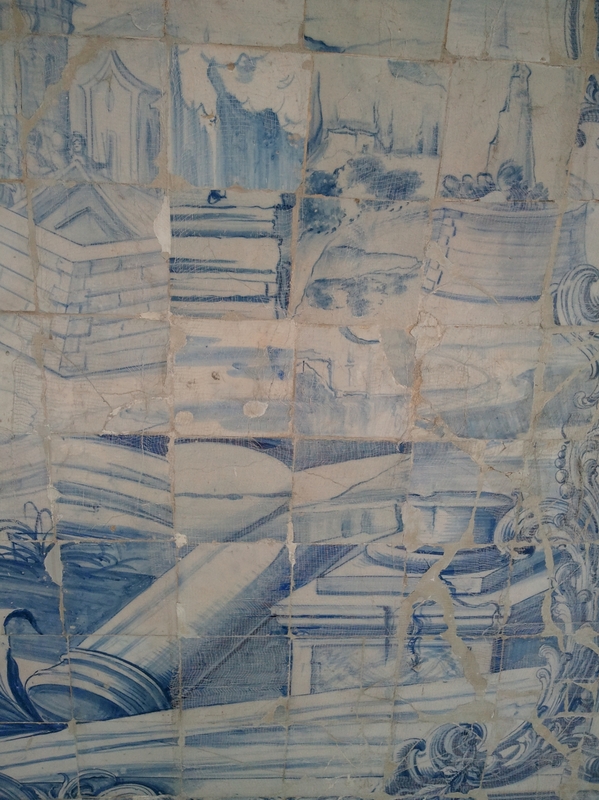 Panels in blue and white tile work (azulejos) are a 1782 addition. From this dark paneled and painted chamber, you emerge into a cloistered stone courtyard lit by a fiercely blue sky. It’s as though you’ve traveled three centuries from inside a Renaissance cabinet of curiosities to step into a surrealist Giorgio de Chirico painting. 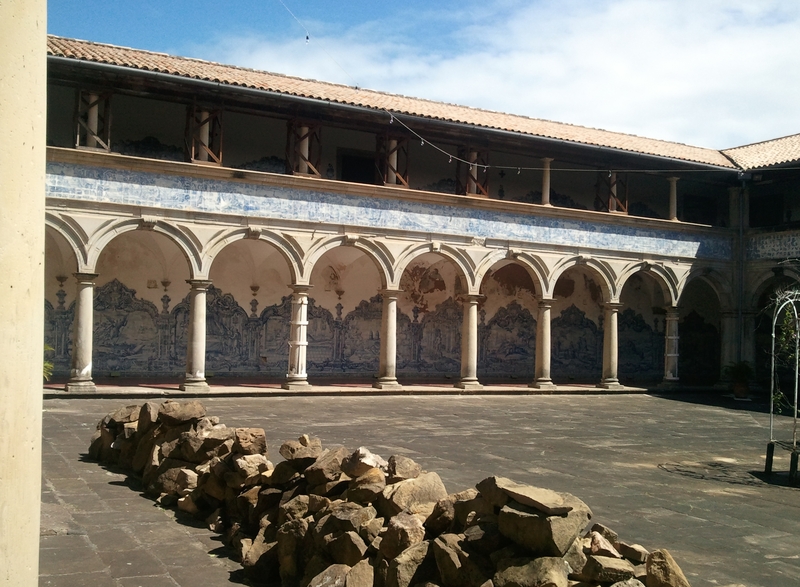 The inner walls of the cloister are decorated with azulejo tile panels based on the work of 17th century Flemish artist Otto van Veen, who produced engravings illustrating epigrams from Roman poet Horace. 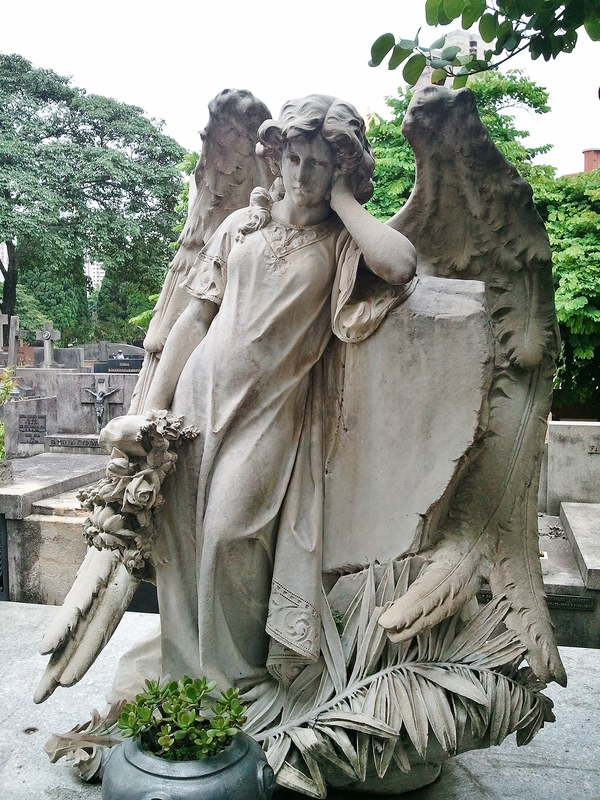 The choices are gloomy and perhaps inevitably sententious – there is much brooding on death and the fate of sinners, as well as on the virtue of knowing your place and of being thrifty. 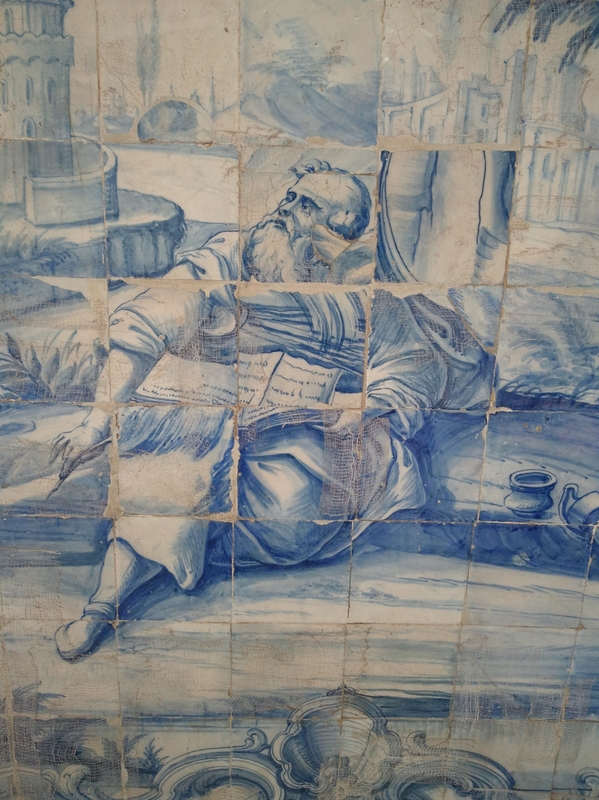 The tiles are held in place by crude repairs and patches in places – an unintentional effect is to underline the ‘tempus fugit’ theme, but sometimes the effect is comic too. The worthy scholar’s confused mien is understandable – he looks like he’s trapped in a sliding number puzzle. This looks like an architectural salvage yard. Van Veen taught Pieter Paul Rubens for a number of years, and produced a number of ’emblem books’ which influenced and served as source material for many later artists. 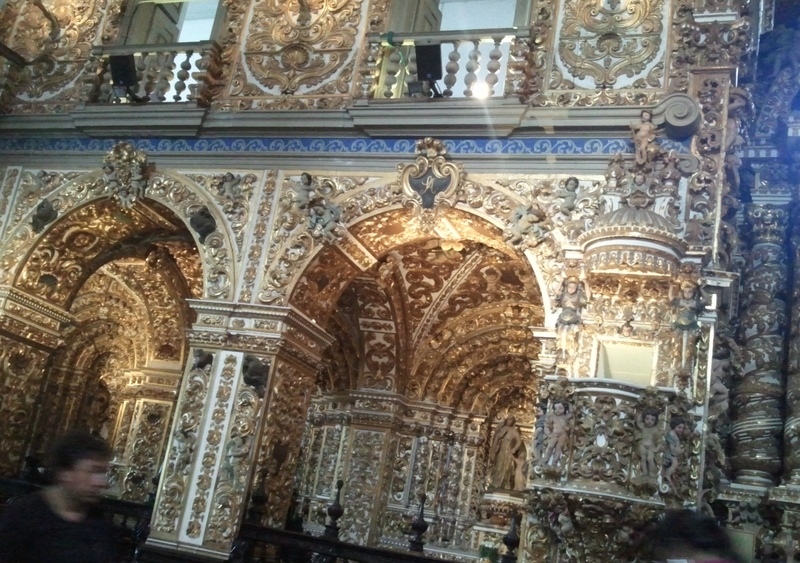 However bright the skies, nothing can prepare you for the blinding interior of the church, said to be the best example of the igreja dourada or ‘golden church’ style of Brazilian colonial baroque. The splendour of the surfaces, the elaborateness of the carving, the spiralling columns, the profusion of decoration on every available surface, the almost total absence of straight unadorned line, even the choice of complementary colours – white and blue – all are designed to overwhelm the worshipper with the gilded glory of this church. 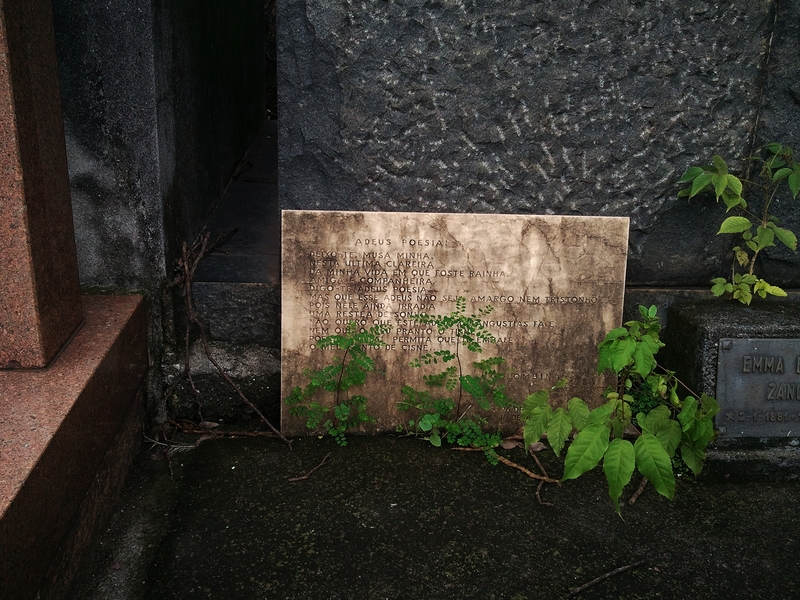 I found myself looking for a more restful surface on which to focus. 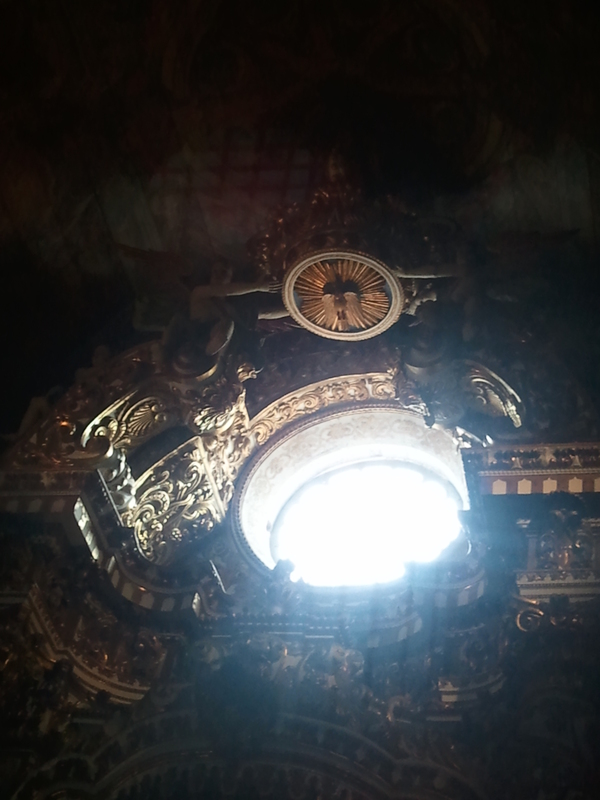 The ceiling over the altar was a little quieter. 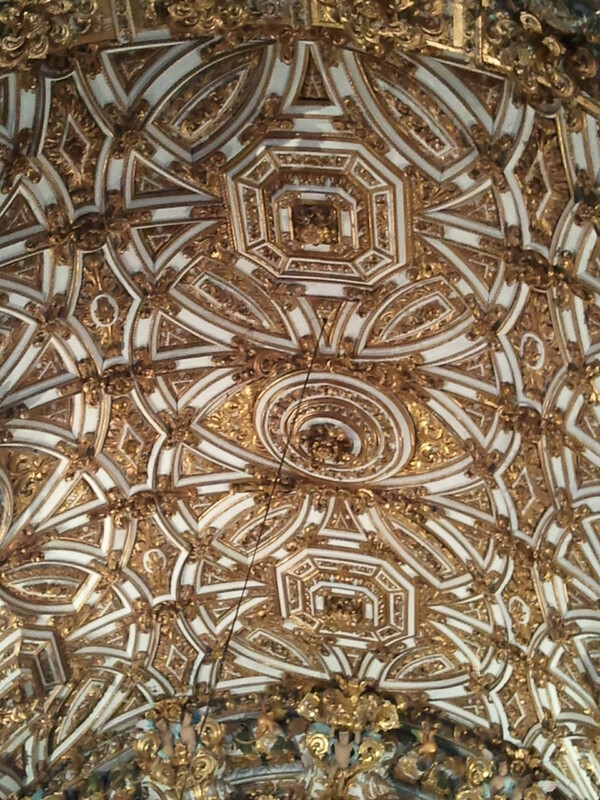 The nave ceiling was heavily decorated too, but with less gilt. 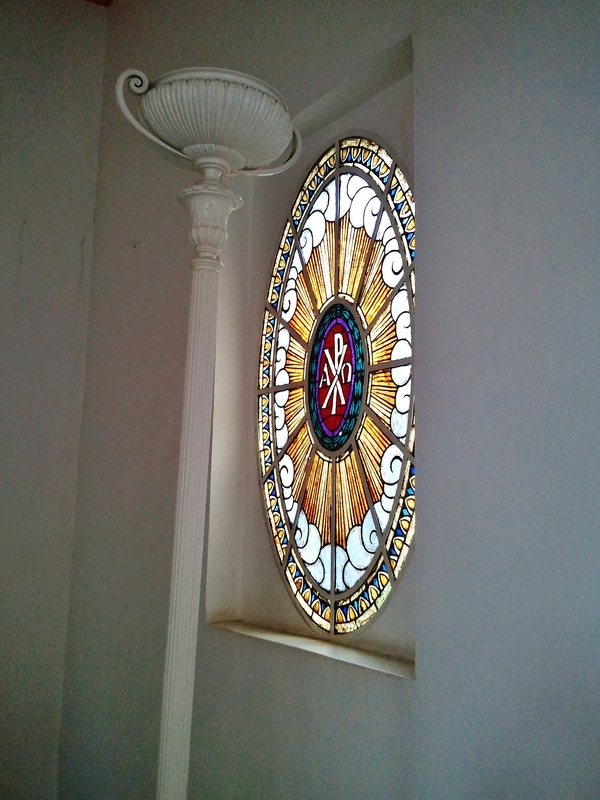 Even the chiaroscuro of a bright window offered some respite from the blazing glory of the dourada style. 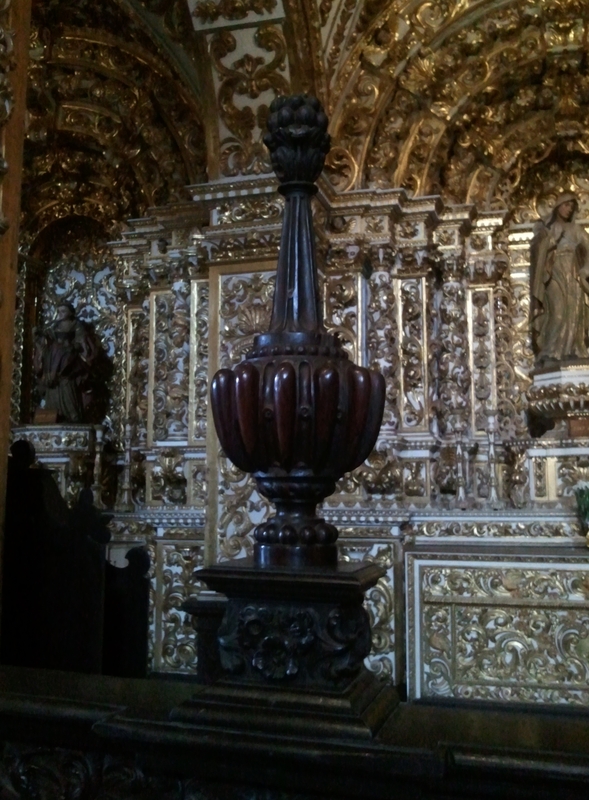 Your eye may alight and rest on the dark lustre of carved jacarandá wood, the work of Frei Luis de Jesus ‘The Woodcarver’, for which this church is also justly famous. 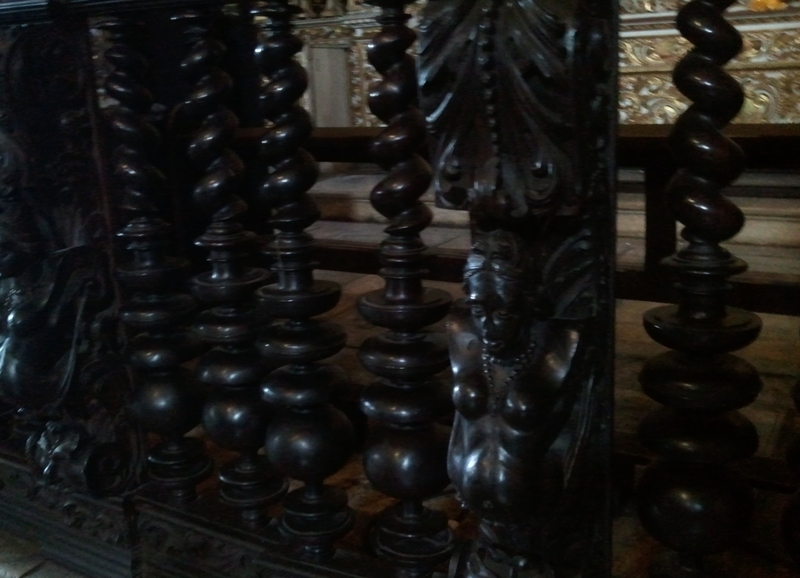 If your eye falls below the handrail, you may wonder how or indeed why the monks were able to decorate their church with such voluptuous sway-backed acolytes. At the altar the caryatids are fair and gilded, with pink hands and faces. And above the altar an unusual crucifix, after the image by the Spanish painter Murillo, shows Jesus embracing founder St Francis of Assisi. 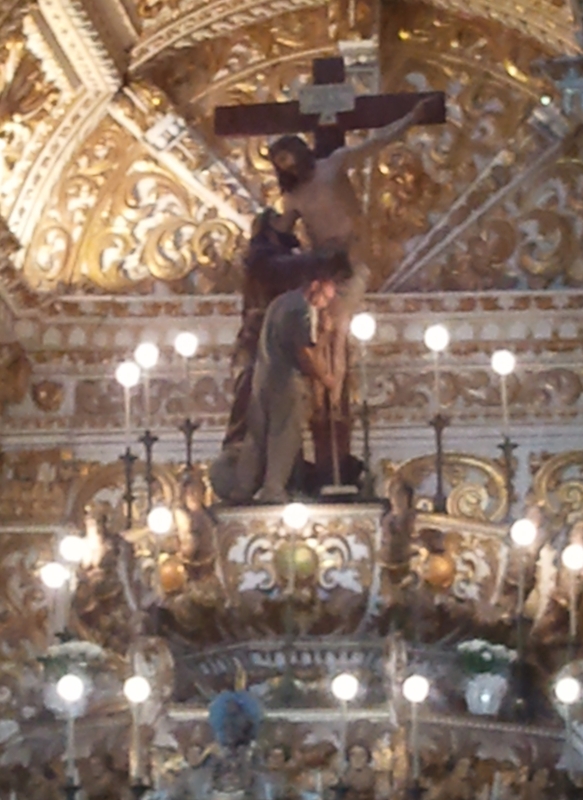 High up on the altar, a workman calmly and carefully sweeps up the dust. Another man was going around replacing light bulbs. I found myself resting my eyes on their activity.You welcome such visual interest in the goldstorm of this interior. 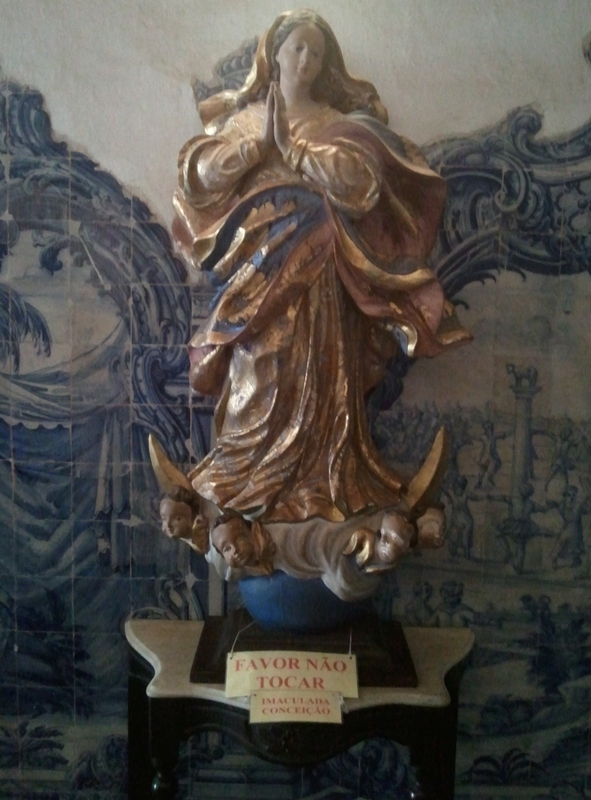 My perception was truly confused – was this holy water font, donated by Dom João V of Portugal (‘O Magnânimo‘), golden or not? 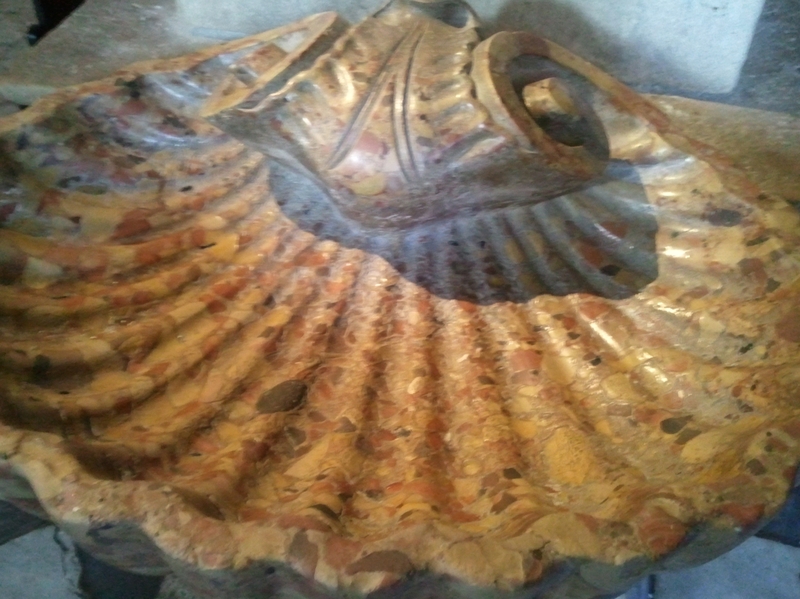 Deliberately chosen no doubt to allude to the dourada style, it is made of yellow conglomerate. 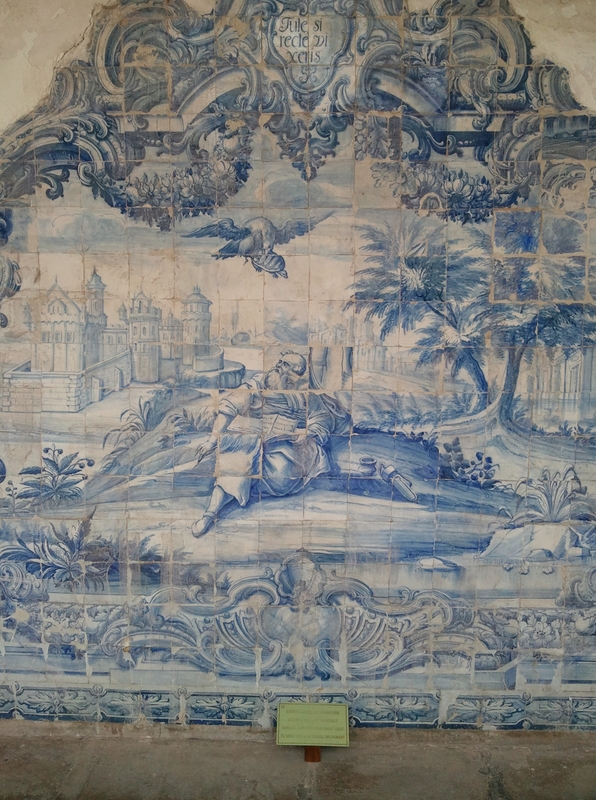 Dom João also donated the Horace / van Veen azulejos. 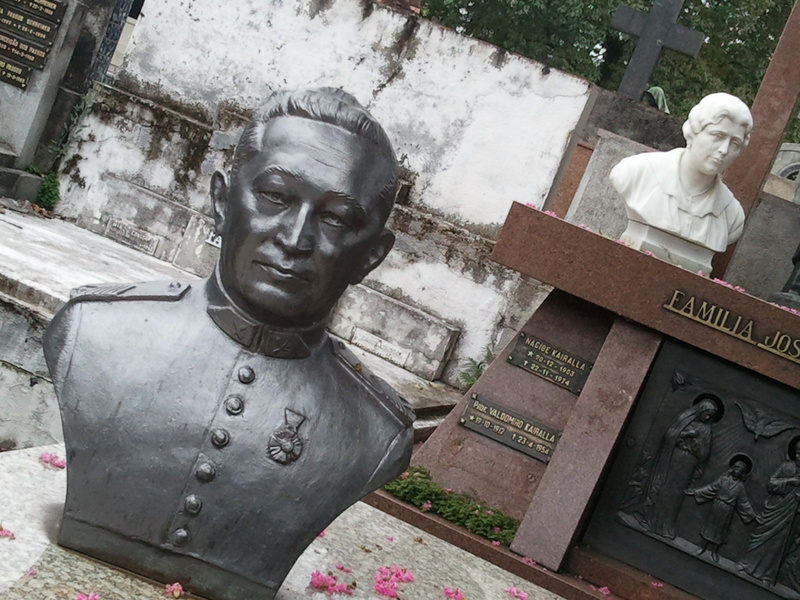 When you learn that a fifth of each ton extracted from the gold and diamond mines of Brasil was crown property – Portugal is said to have collected more gold over a few decades than Spain took from the rest of Central and South America over 400 years – and that Dom João was also known as O Freirático because of his preference for nuns as sexual partners, the interior of this church comes into clearer focus. 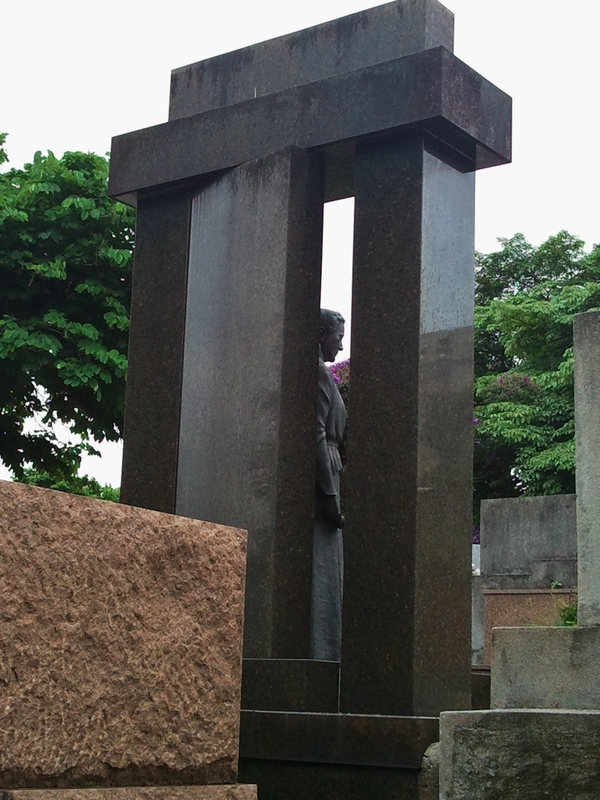 Brasilians are philosophical about such cultural history. 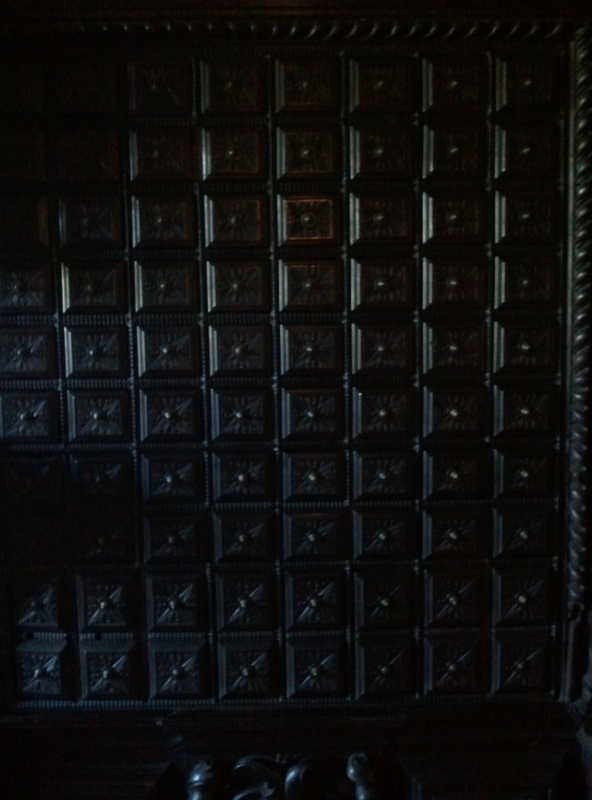 This piece of furniture in the sacristy was used as a kind of ecclesiastical safety deposit box, where the fathers of prospective brides placed money for their daughters’ dowries and presumably for the cost of their weddings. No visitors to the church were surprised that behind the regularity of its squared facade, some doors gave onto bigger boxes than others. 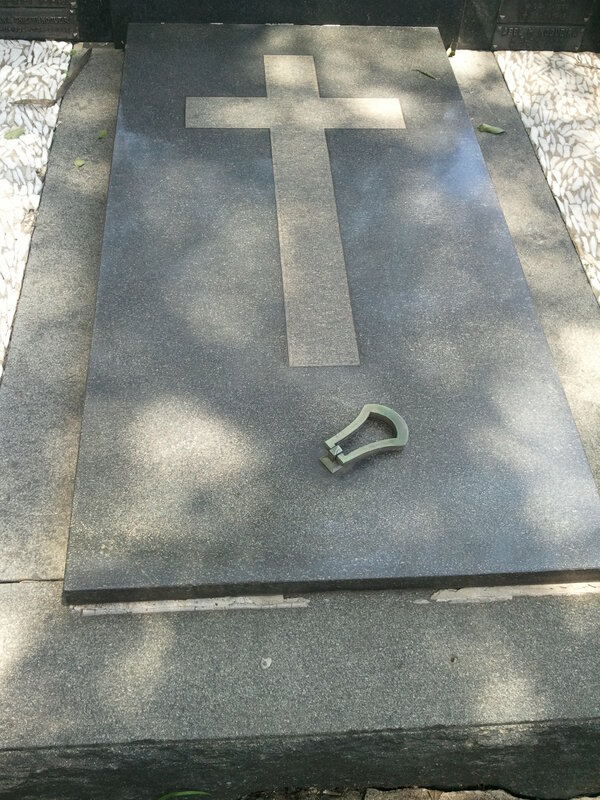 In 1742 Dom João suffered a stroke which left him, the erstwhile Prince of Brasil, politically ineffectual. 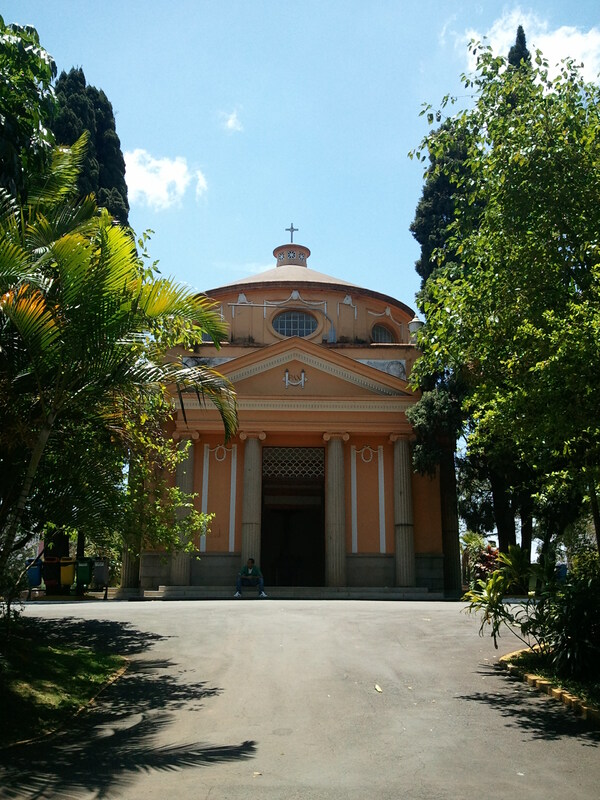 He spent the last years of his life, the time of his donations to this church, devoted to religious activities. 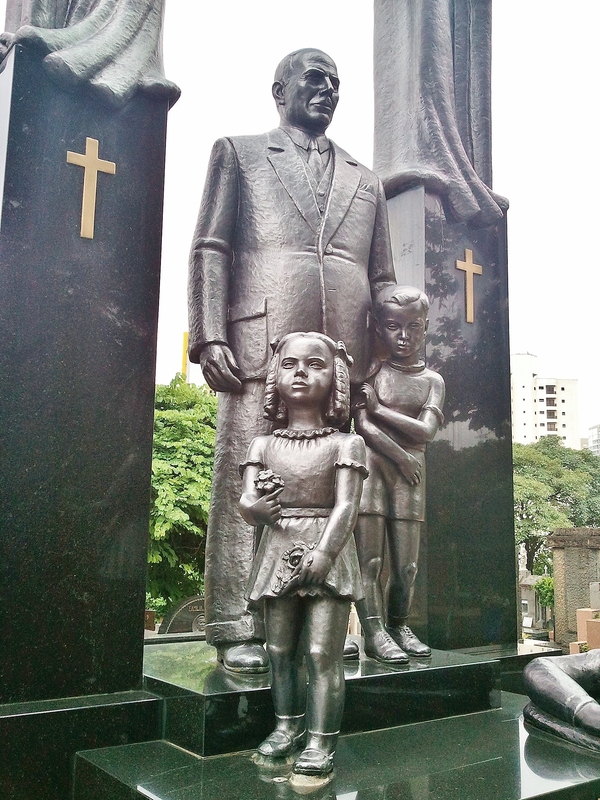 The relaxed attitude – now and during his reign – of Brasilians to religious life is at one with the syncretist version of Catholicism tinged with west African Yoruba traditions which continues to grow in Brasil today. 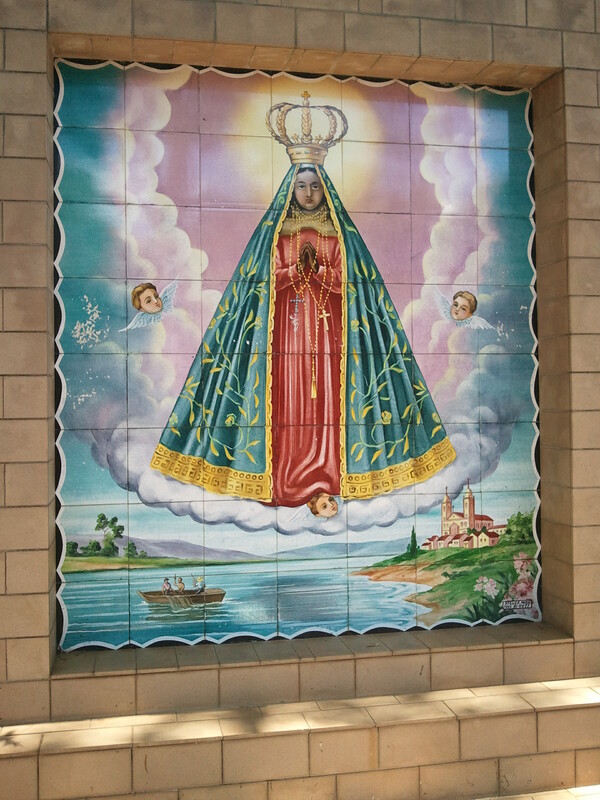 Is this statue of the Virgin of the Immaculate Conception actually standing on a crescent moon, like the Yoruba goddess Iemenja? 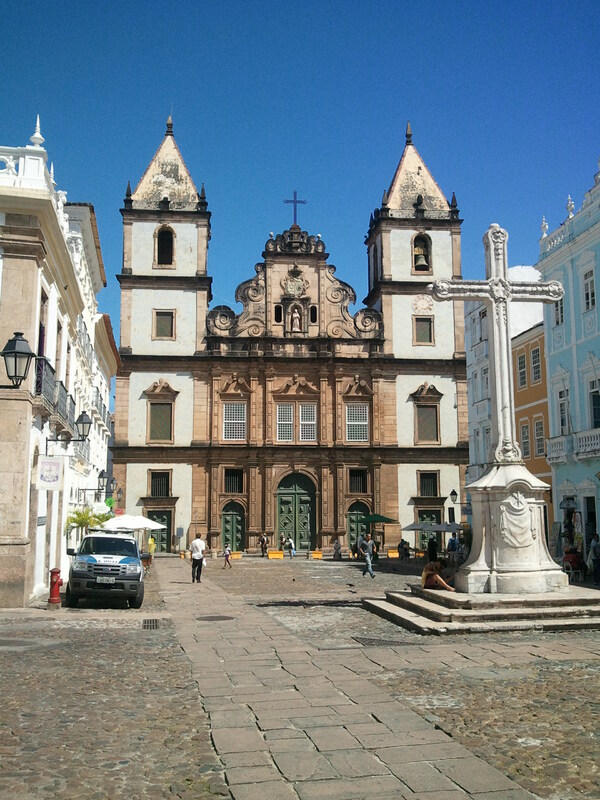 Brasil’s culture swirls with fascinating cross-currents – the Franciscan Igreja de São Francisco faces the Jesuit Catedral Basílica de Salvador across the square, for all the world like rival football clubs. 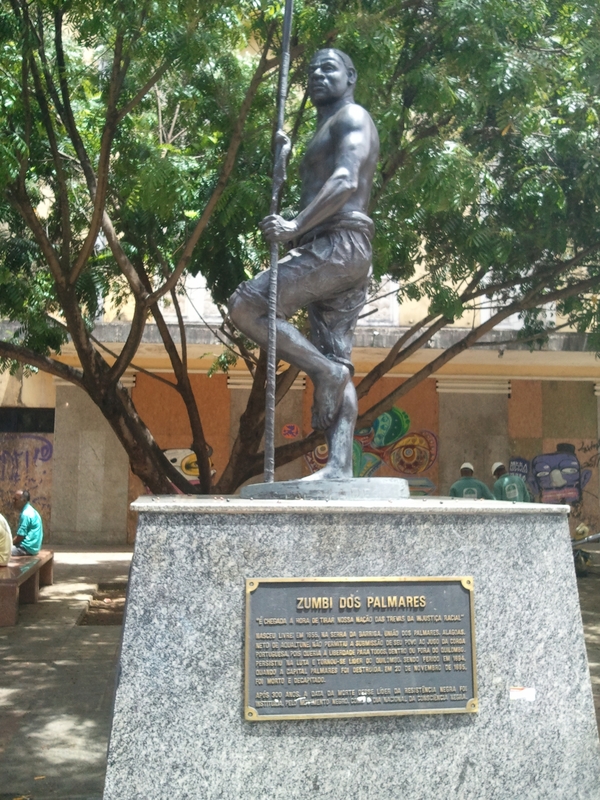 Both are in a district, Pelourinho, named for the public pillory or whipping post used for punishing African Brasilian slaves “pour encourager les autres”. Brasilians accept such seeming contradictions easily. for an example) and the gap between rich and poor significant – is a little harder to accept. 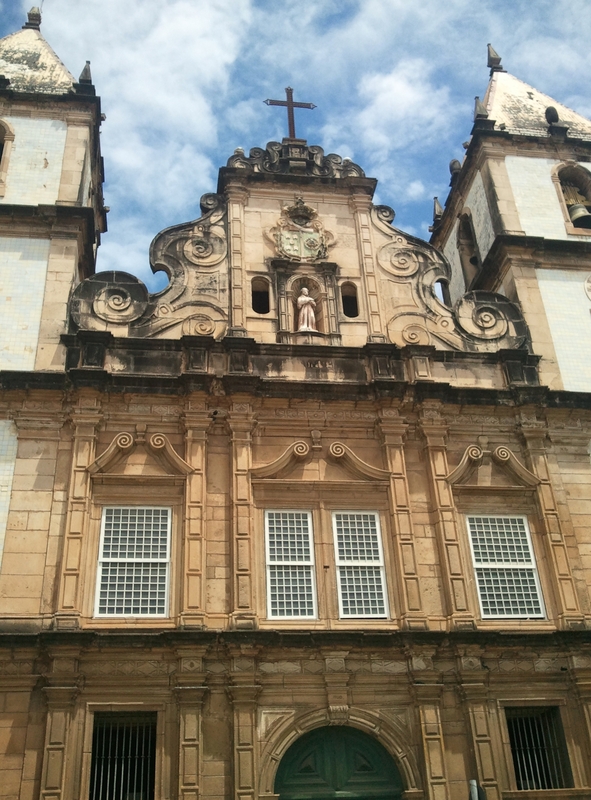 Given the strength of religious feeling in Brasil, you might expect the Museum of Religious Art in Salvador da Bahia to house a significant collection, and to be thronged with visitors. ‘Yes’ to the first, but a clear ‘no’ to the second – the museum has excellent collections of religious statuary, paintings, silver and other artefacts, but the attendant told us that visitor numbers had been affected by the European downturn, since that is the origin of the majority of visitors. 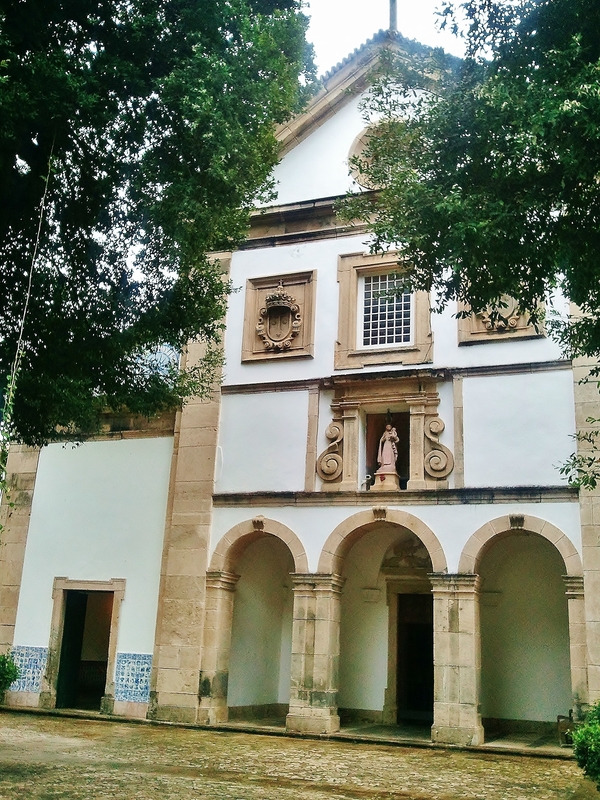 The museum was built as a Barefoot Carmelite monastery between 1667 and 1697, serving as a seminary from 1837 to 1953. 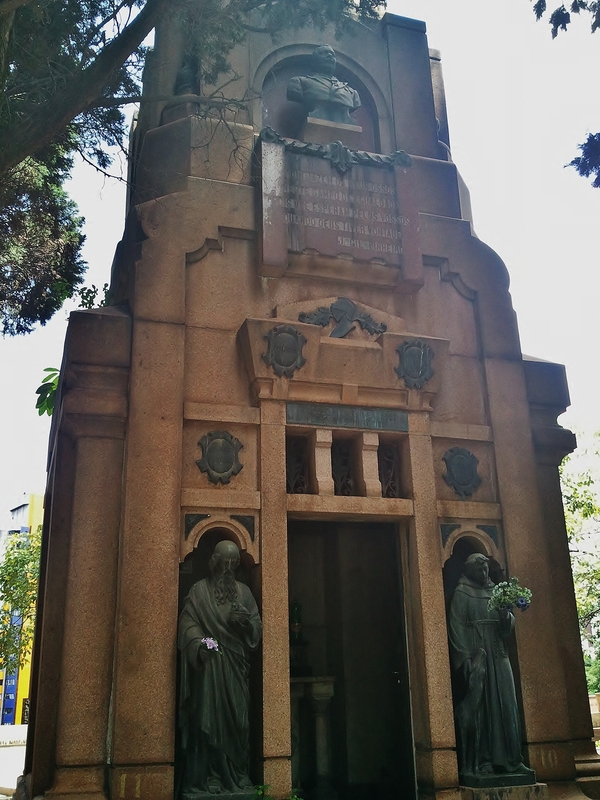 It’s tucked down the Rua do Sodré, off the busy Rua Carlos Gomes thoroughfare. An unfashionable down-at-heel area, the architectural heritage is nevertheless of high quality, both the Museum itself and some neighbouring buildings. Security is evident and cautious. We were advised by the parking attendant to be wary, but we saw family life going on too – sons visiting older parents – in the same street. From the Museum, the view over the Bahia de Todos os Santos is lovely. 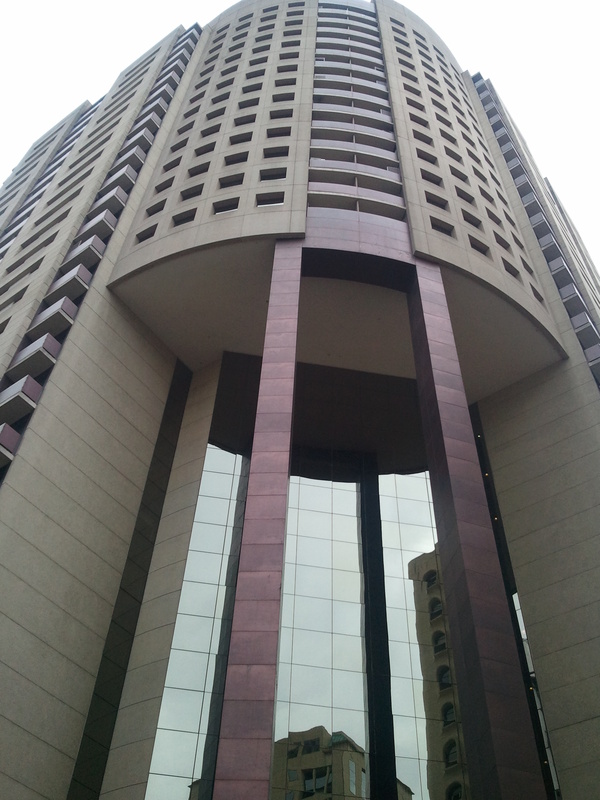 The scrolling volutes of the facade suggest an interesting building, and the interior does not disappoint. 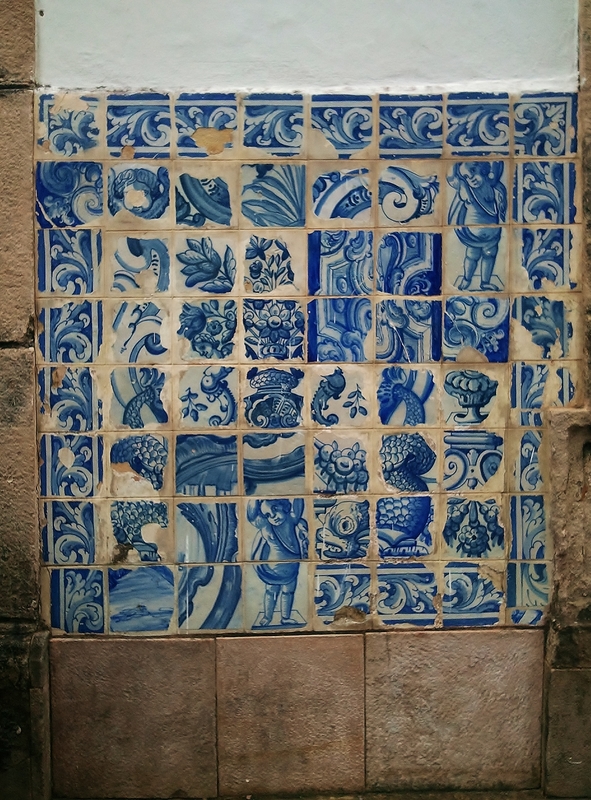 Seventeenth century tiles – azulejos – showing flora and fauna and religious imagery line the eight confessional niches and the walls, and also appear on the facade of the church. 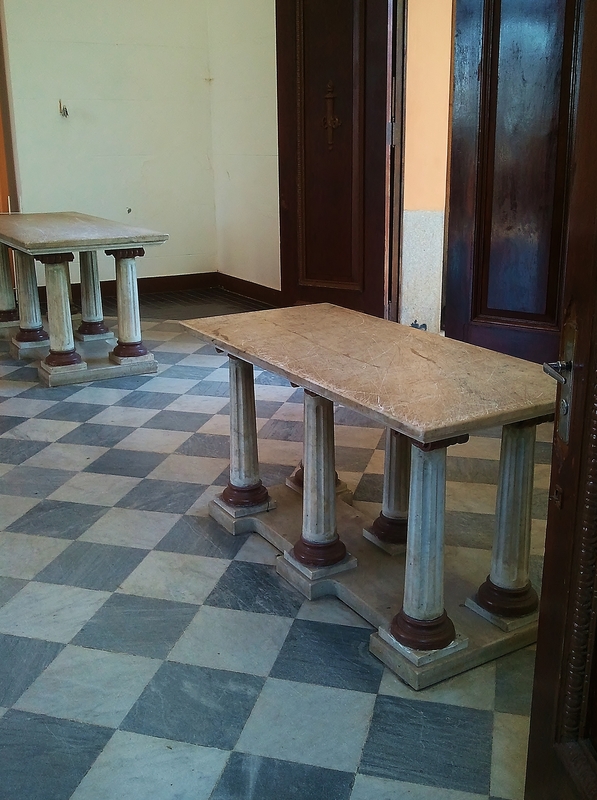 The confessionals, built as part of the original church so that monks could hear confession without leaving the monastery, are unique in Brasil. A plain and elegant interior – round sandstone arches and a white plastered vaulted ceiling over sandstone Doric columns – is crowned with a simple cupola. The floor of polished wood burial niches is divided by stone courses. 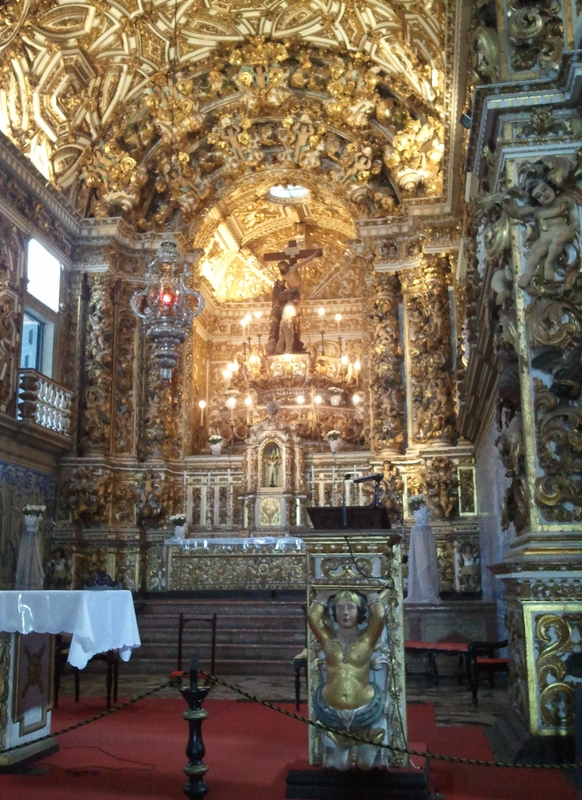 Only the altarpiece is ornate, made of finely wrought silver and silver gilt, with a Madonna floating above. You need to remind yourself that this is a museum, not a church. What’s perhaps more surprising is that building was in serious disrepair before the Museum was transferred there in 1957. 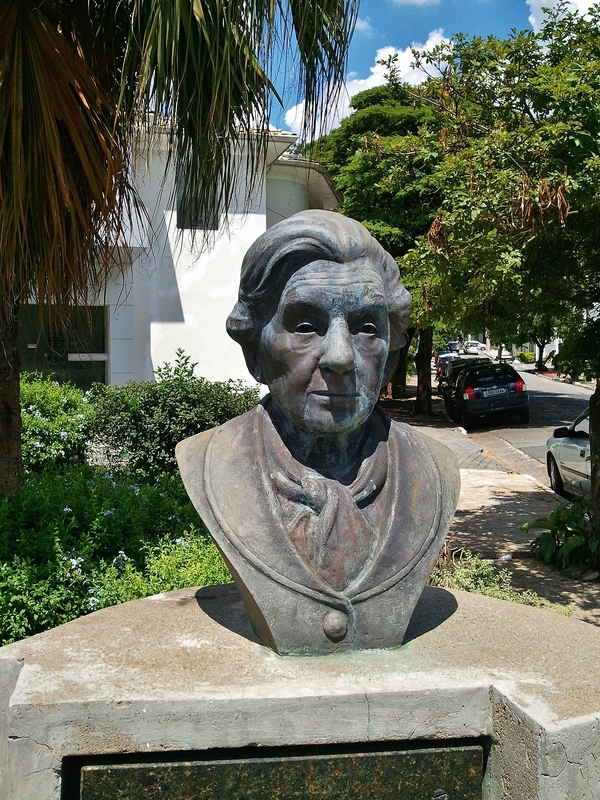 That was the initiative of the Rector of the Federal University of Bahia (UFBA) Edgar Santos Rego, a key figure in the cultural life of Salvador and of Brasil. 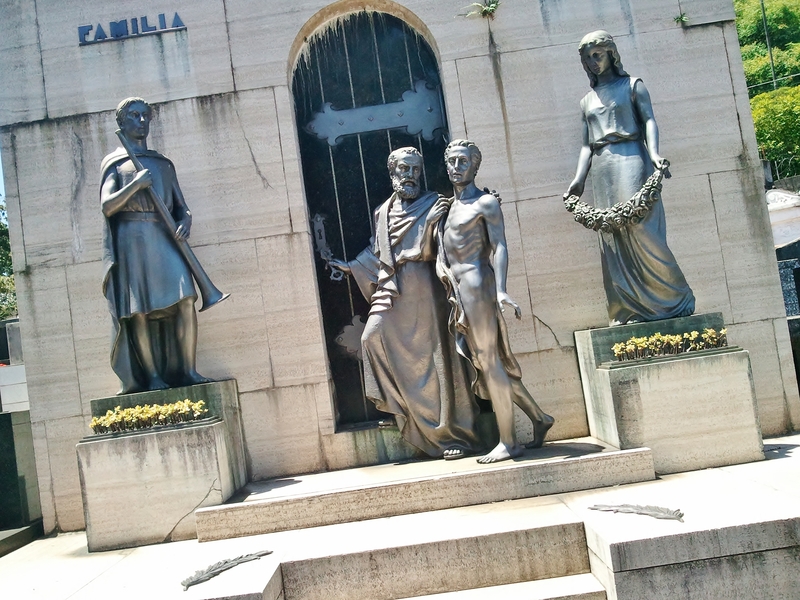 Though it’s not much visited by Brasilians, it is a popular venue for wedding ceremonies. You are directed and supervised carefully around the collection by the attendants. The Museum discourages photography, so you will have to imagine the charming details of this interior – on the hand basin for officiating clerics, bronze taps in the shape of dolphins against quatre-foils of madder and veined black marble, leaping deer and piping birds on the auzulejos, the light, cool, spacious interior, the arrays of male and female saints – separated in image as in religious life – mounted in serried rows on the walls of an upstairs room. Or you could visit it in person. It’s a worthwhile and refreshing detour from the tourist trail. On the south-west edge of the Sao Paulo connurbation, Embu maintains an identity distinct from the urban sprawl of its enormous neighbour. 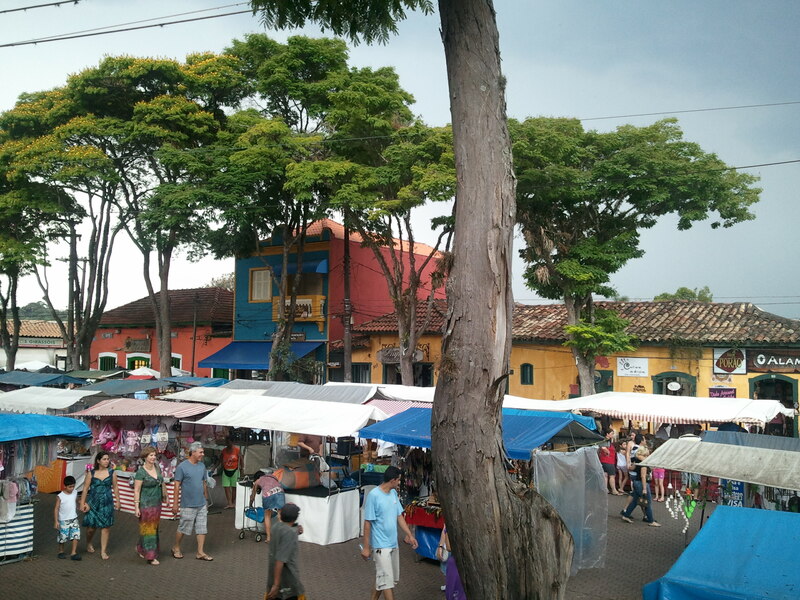 The centro histórico is a series of cobbled streets with brightly painted stuccoed houses, and shops and restaurants serving the tourist trade. Elsewhere in town there are collections of shops selling ‘arty’ furniture – heavy wooden mock-rustic chairs, kitchen and console tables, wrought iron chandeliers, gates and panels, pool-side furniture, sculptures made from scrap car parts – but in the centre the work is finer. 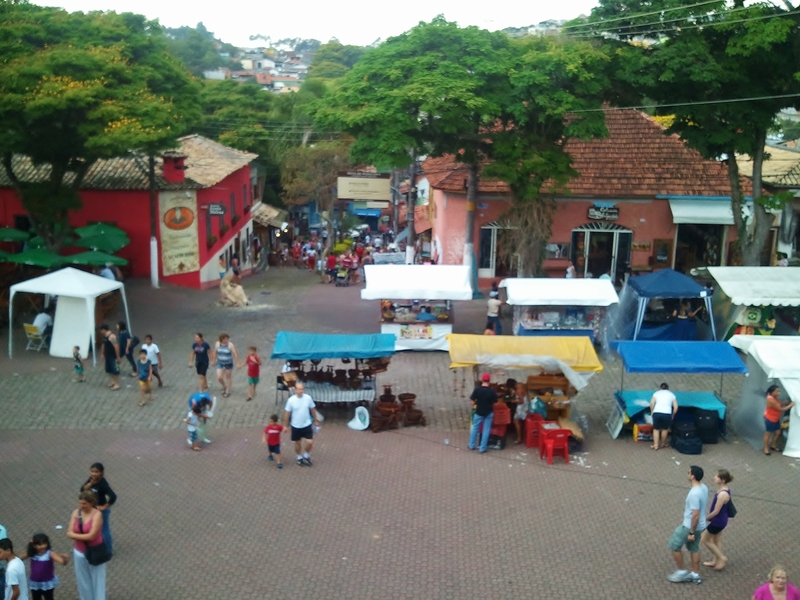 The shops and stalls sell a wide array of paintings – naive, realist, Brasilian and European landscapes, abstract and op-art – and sculpture, all kinds of handcrafts, bric-a-brac, food and drink, semi-precious stones and jewellery, carpets, and antiques. 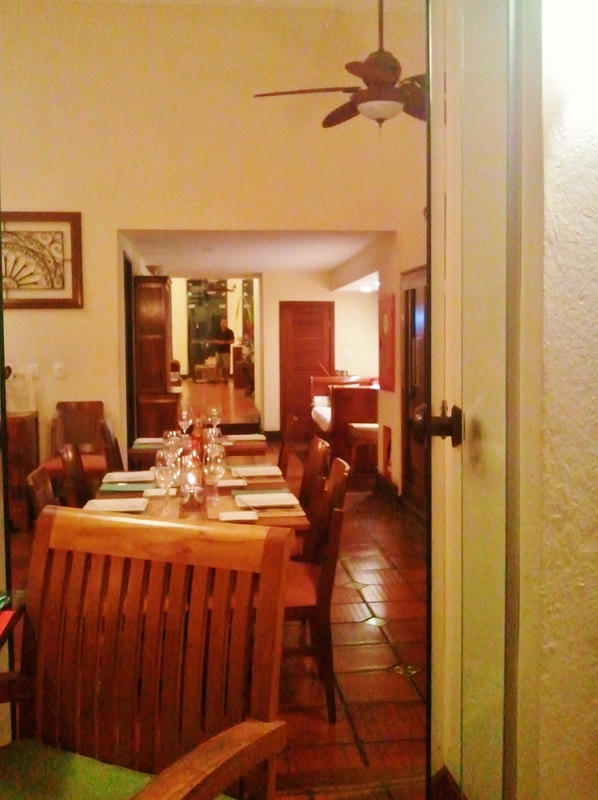 The better quality antiques, some as early as eighteenth century, come from the fazendas or large farms – Marcelo Aguila has a tall library bookcase including steps and a landing wide enough to accommodate an armchair. 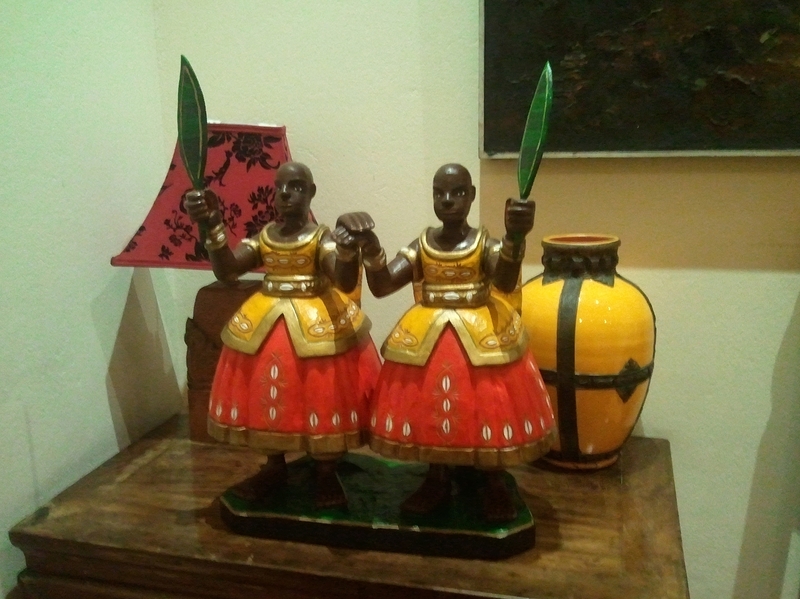 He also has a set of four white-glazed earthenware statues of women portraying the seasons, and a pair of console tables of jacaranda wood with marquetry tops and ivory detailing. 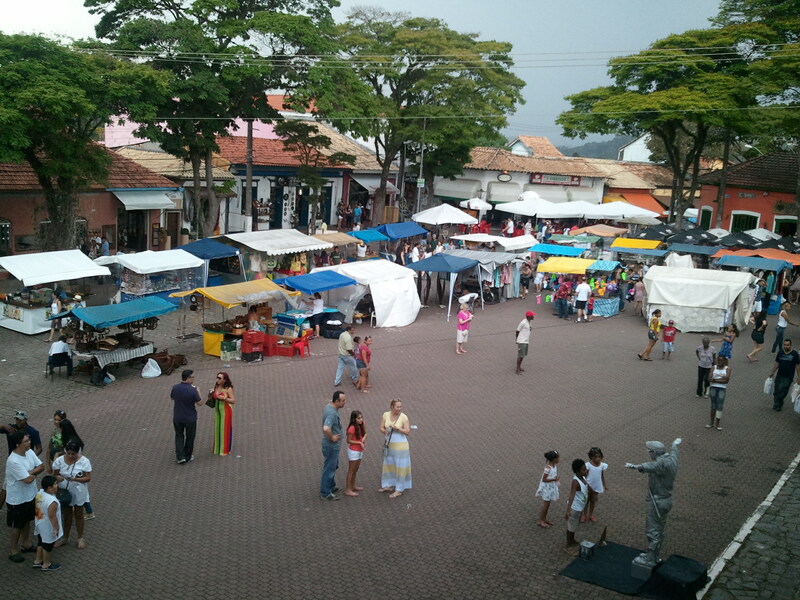 There are lace and fabric handcrafts, wooden objets d’art and utensils, and hats and other clothing for sale, and a specialist pet market. An excellent silversmith sets a wide range of Brasilian stones. A forro duo play accordion and pandeiro – like a tambourine – on a street corner. A clown in full costume offers to make balloon animals. The covered terraces of restaurants are filled with day-trippers enjoying food, drink and live music, some even dancing in the lunch-time crowd. The sun beats down fiercely, though the dark clouds piling up bring lightning and heavy rain later. 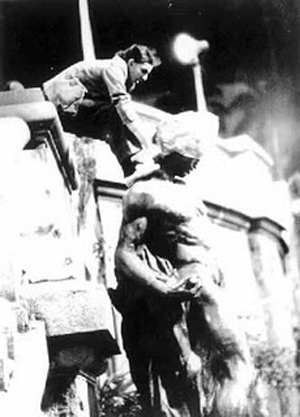 Not one, but two ‘living statues’ perform in the main square – see above and below. We have lunch at the excellent Emporio Sao Pedro, a business which has successfully combined food and antiques for a number of years. A James Taylor sound-alike troubador sings and plays guitar in accented English. The restaurant’s address, the steep Viela das Lavadeiras or Laundress’ Alley suggests something of the history of the town centre. 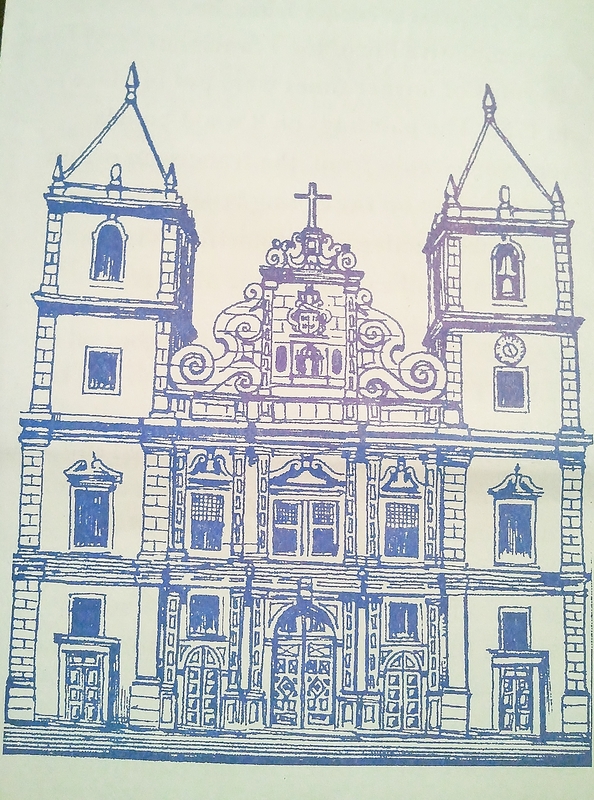 As in much of Brasil, European settlement was led by the Jesuits, who established a church here in 1554, later adding a monastery, which buildings today form the Museu de Arte Sacra dos Jesuitas. Built to a simple rectangular plan with high white walls, blue shuttered windows and a pan-tiled roof, the church is both elegant and cooly functional. The white walls, plain wooden floor and ceiling help to focus attention on the ornately carved and painted baroque wooden altar pieces, with twisted columns framing illuminated saints, a central crucifix and a monochrome Madonna above. Clerical vestments are displayed as if kneeling, wooden candelabra are backlit on the altar. 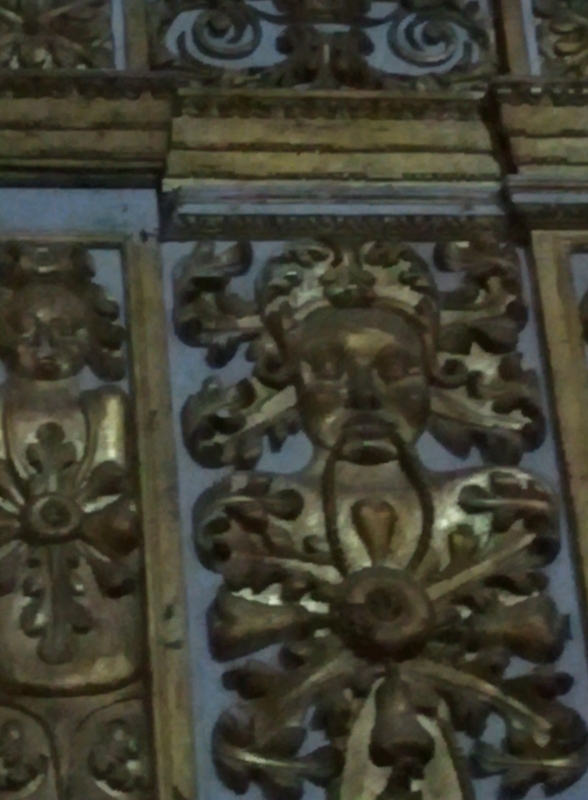 A carved balcony decorated with the monogram of the Society of Jesus juts out of the right-hand wall at first-floor level, presumably for the principal of the monastery to be able to address the lay faithful. The construct is intensely theatrical, the large bare space for the audience focused on the miraculous images in the cabinet beyond the fourth wall of the altar rail, the front row reserved for the brothers now at rest beneath the polished wooden panels let into the floor, the decorated balcony ready to broadcast the devotional word of the Society. Out in the brothers’ cloistered garden, a plain cross is picked out with red flowering plants and a white gravelled border behind a low clipped hedge. 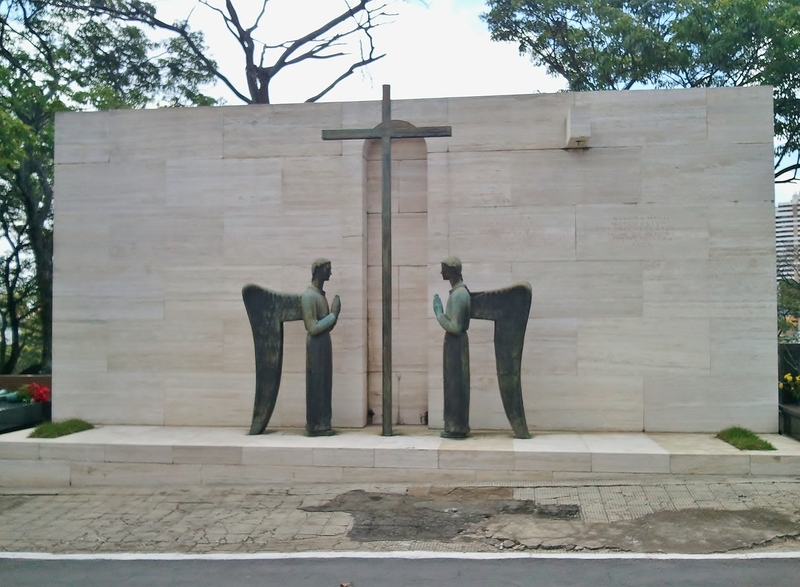 Though the museum has a rich holding of religious art, artefacts and architecture, you can sense in the simplicity of how its message is formulated that the organisation is trying to reach beyond its history to its mission – AMDG, ad maiorem Dei gloriam, to the greater glory of God. The Google Earth satellite view below of the Society’s monogram in the garden at Embu – zoom in, right hand side – continues to broadcast its devotion. 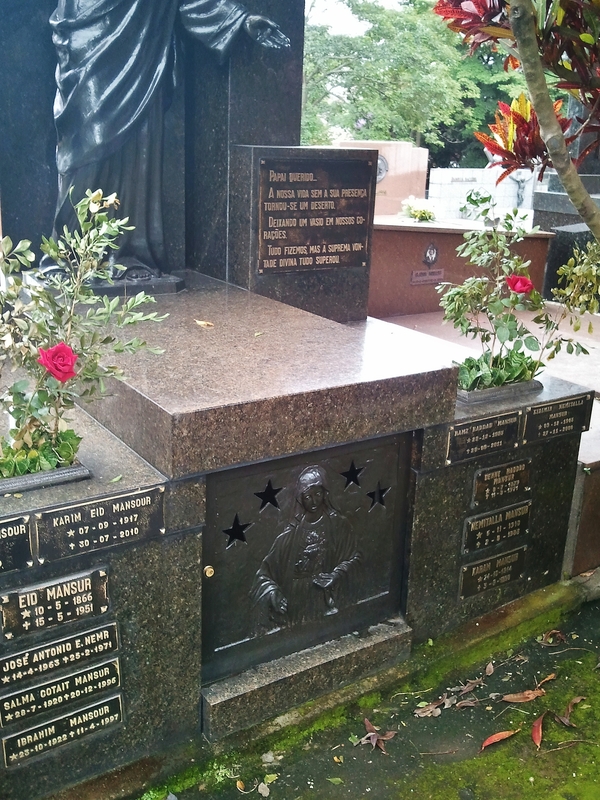 I am reminded by this view, by the street-names in Embu, by the dedication of the museum volunteers, by the everyday use of expressions like “Nossa!” – for Nossa Senhora – and “Graças a Deus” – Thanks be to God – how intensely religious a culture is Brasil. 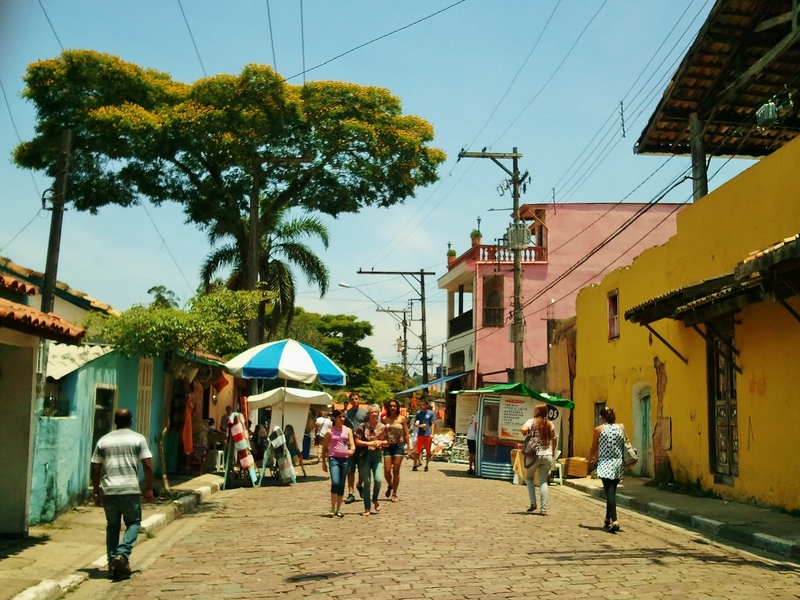 In the old centre of São Salvador da Bahia de Todos os Santos (‘Salvador‘ or more often ‘Bahia‘), you can sense the fresh breezes from All Saints’ Bay (‘Bahia de Todos os Santos‘), but a view of it is more difficult. 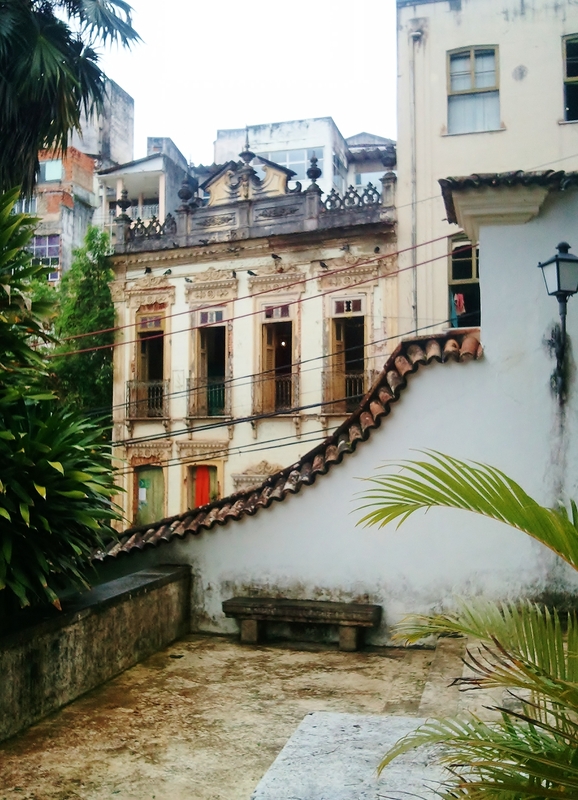 In the upper town or Cidade Alta, the two- and three-storey buildings block your view with a beauty of their own, while in the lower town or Cidade Baixa you glimpse it at sea level from between the buildings of the industrial waterfront, or right down on the beach. 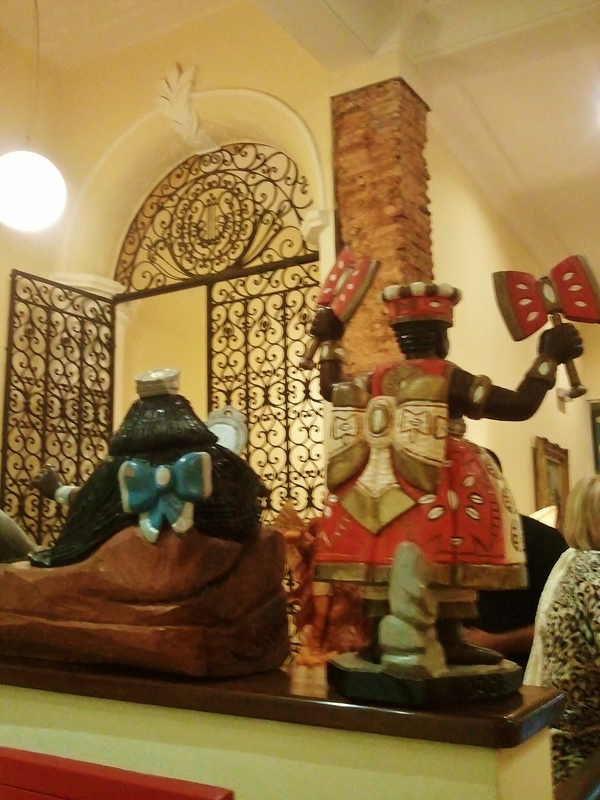 Hotel Casa do Amarelindo is a 10-room hotel in Pelourinho which also serves the public in its restaurant and at the panoramic bar let in to the roof on the fifth floor. The owners have restored this nineteenth century town house with care, preserving floor tiles, wrought iron and plaster-work, and decorating with imagination, in strong yellow (amarelo) and other colurs. 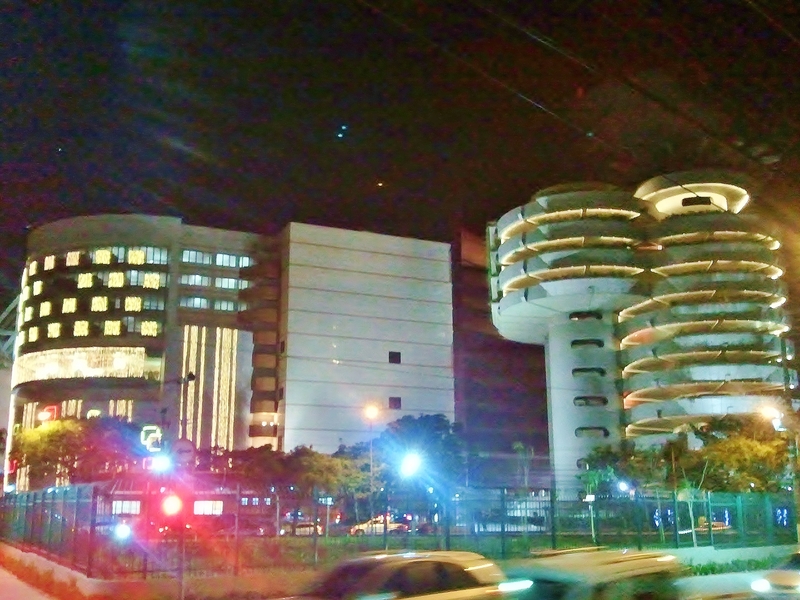 http://www.casadoamarelindo.com/ The view, even at night, is not its only attraction. 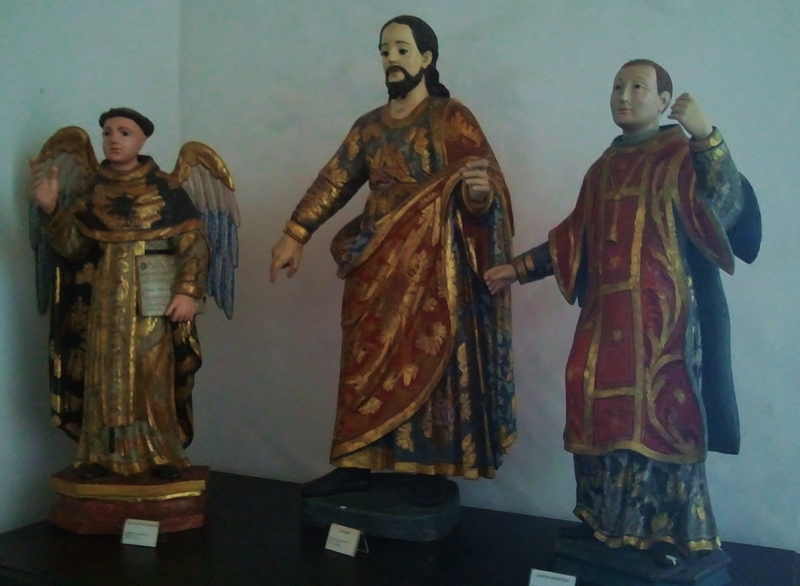 Once more you see the cross-fertilisation of the Portuguese Christian and the Yoruba candomblé traditions: these figures bear more than a passing resemblance to the carved saints of the Catholic churches. If you look carefully, you see the African influence in the Christian tradition too. 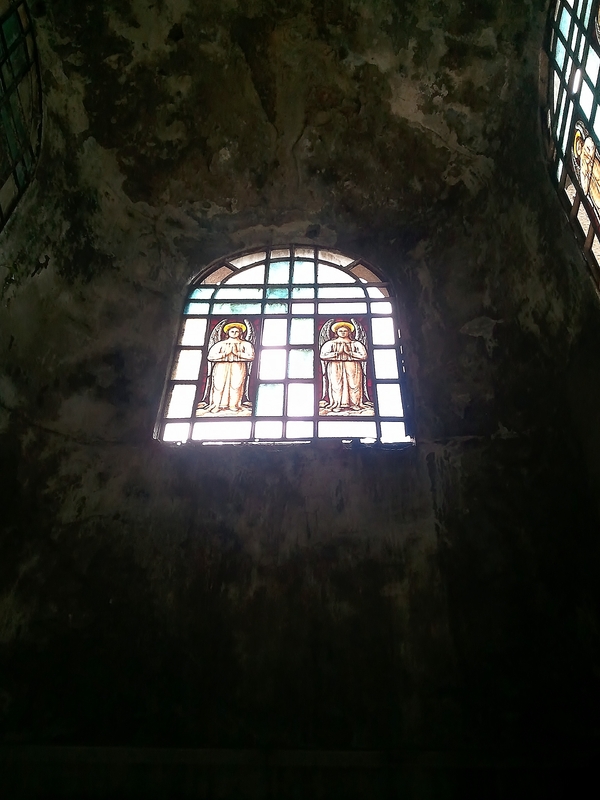 Some painters and wood-carvers of the baroque Bahia churches were indigenous and African, the traces evident in their work. It’s no surprise that the figures being created now have mixed characteristics. 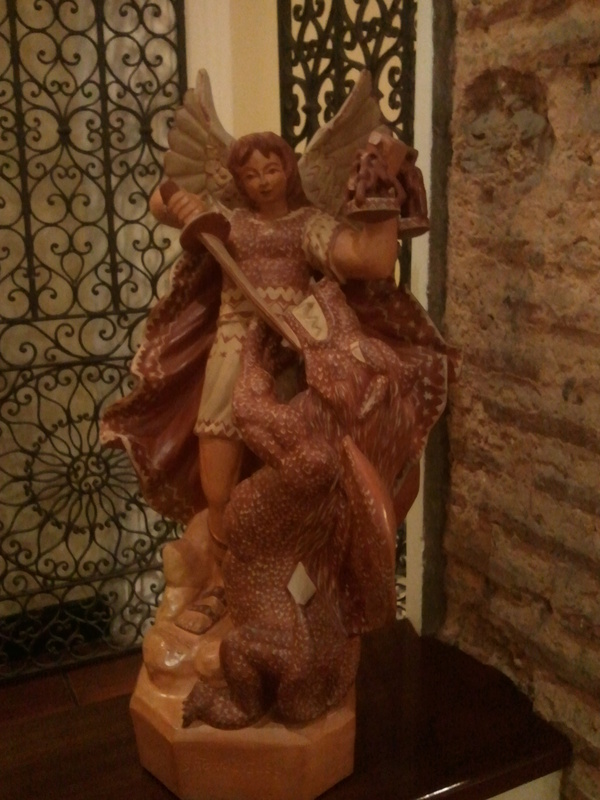 This is the Archangel Michael of Chrisitian, Jewish and Muslim tradition, weigher of souls and defeater of Satan. 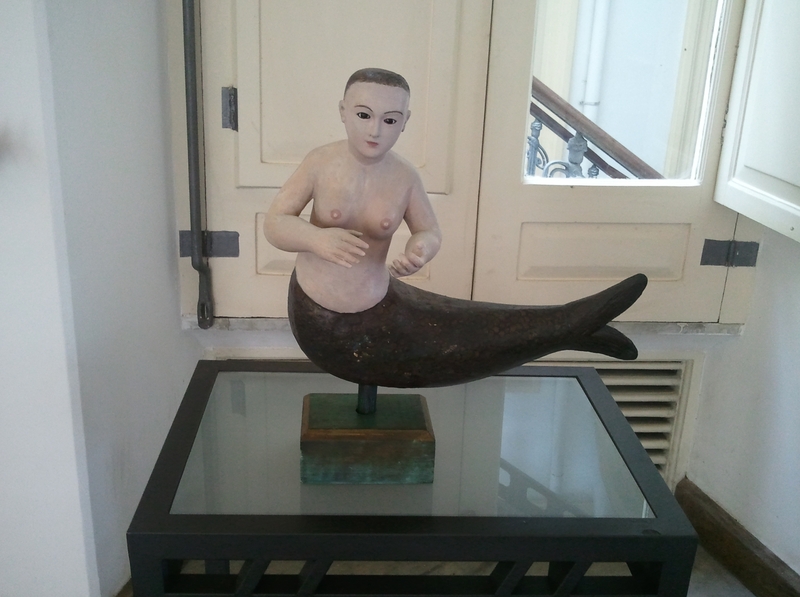 She is the African goddess Iemanja (see also https://theproverbial.org/2012/07/10/mermaid/ ) , her colours light blue, pink and white. 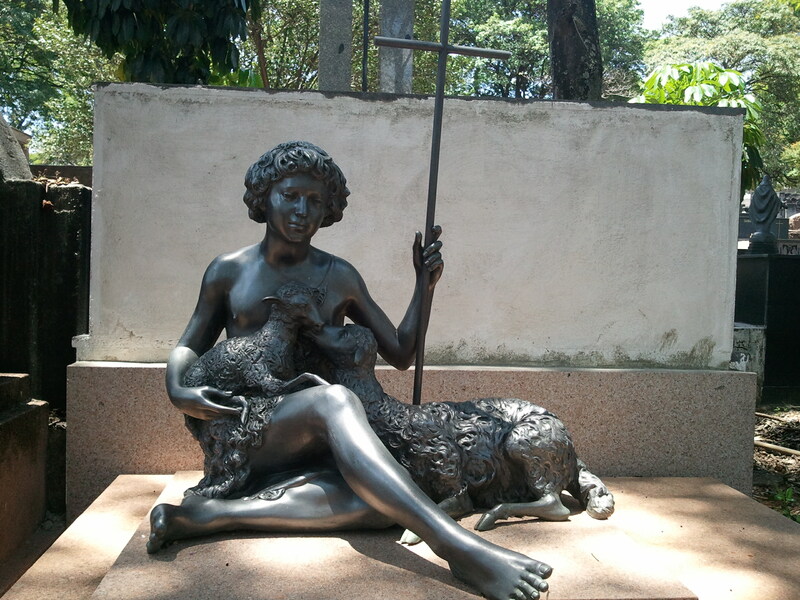 Is that why she is so pale in this figure from the Afro-Brasilian Museum (MAFRO) in Bahia? 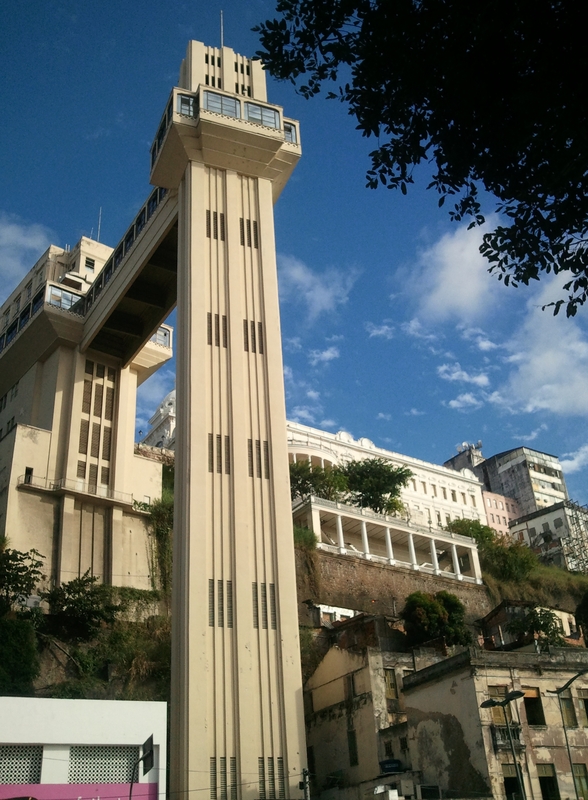 We take the lift to the roof terrace to soak up the fresh night air from All Saints’ Bay and to taste a caipirinha made with best local cachaça (sugar cane spirit) and maracuja (passion fruit) juice. 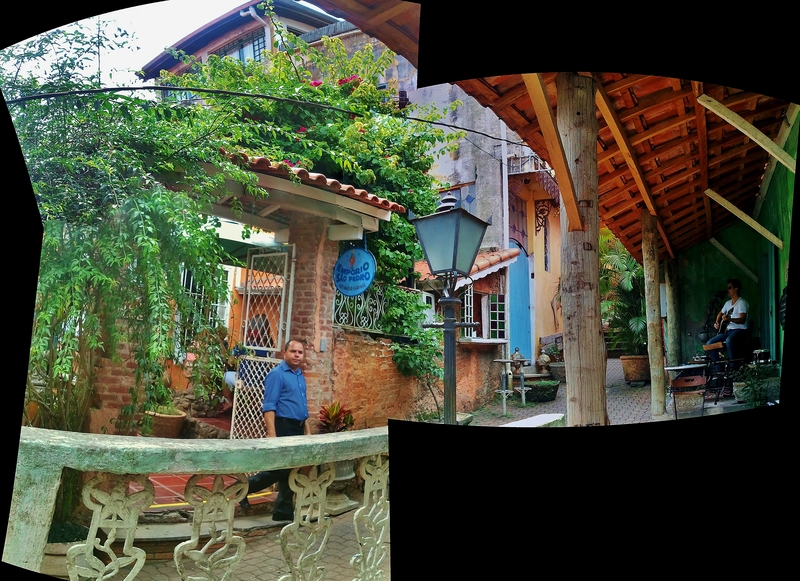 The restaurant downstairs serves an excellent moqueca (seafood stew). 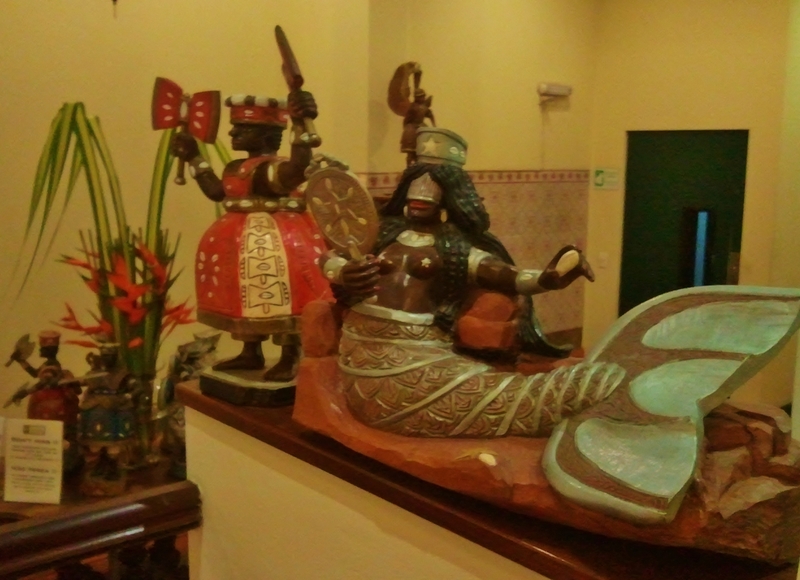 I reflect that in Bahia it seems to be possible to have the best of both worlds, a happy combination of old and new, of African and Portuguese, in a beautiful setting. Long may it be so. 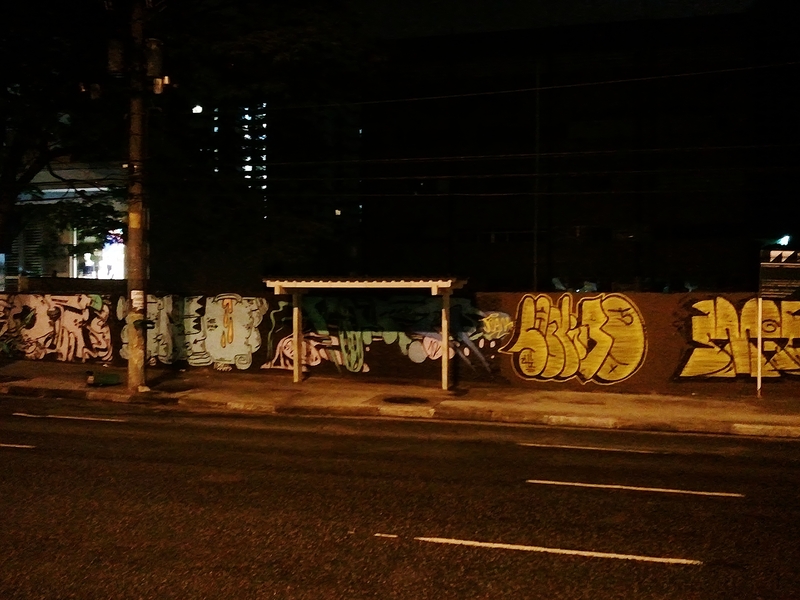 Saturday night in Santa Teresa, Rio de Janeiro. The street market is in full swing, stalls everywhere in the grounds of a local institution (we never did discover what it was), high above the traffic of the street. On sale are handicrafts of all kinds – lace and embroidery, wooden, metal and ceramic ornaments, clothes of all kinds and for all ages, sweet and savoury food, and above the terraced gardens where the stalls are pitched, a rudimentary bar in a large room. And visual artists. Paintings are regularly on sale in street markets in Brasil, testifying to the strong visual sense of the Brasilian culture. In Praca Republica in Sao Paulo on Sundays, here in Santa Teresa in Rio, in Praca Benedicto Calixto on Saturdays in Sao Paulo, fine artists, amateurs and decorators jostle to attract the eye. 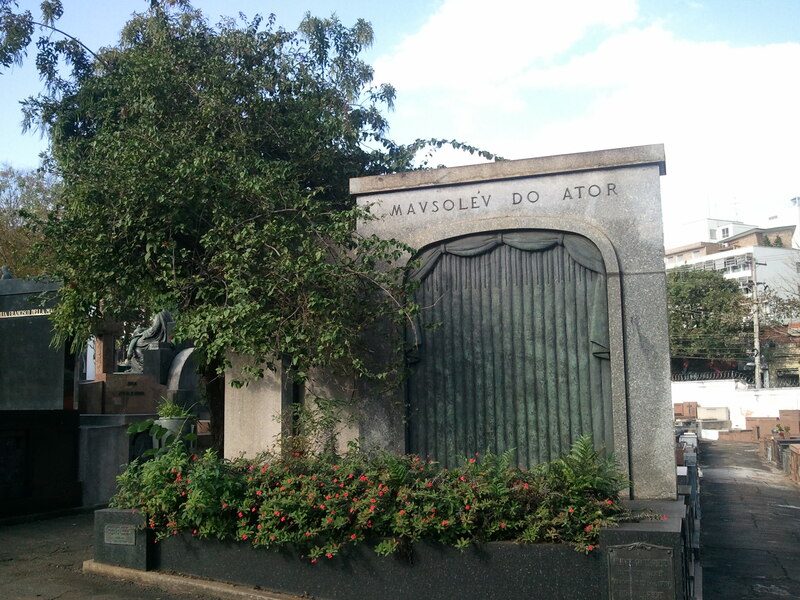 We stop at a pitch on the corner of a terrace, occupied by Edson Louzada. 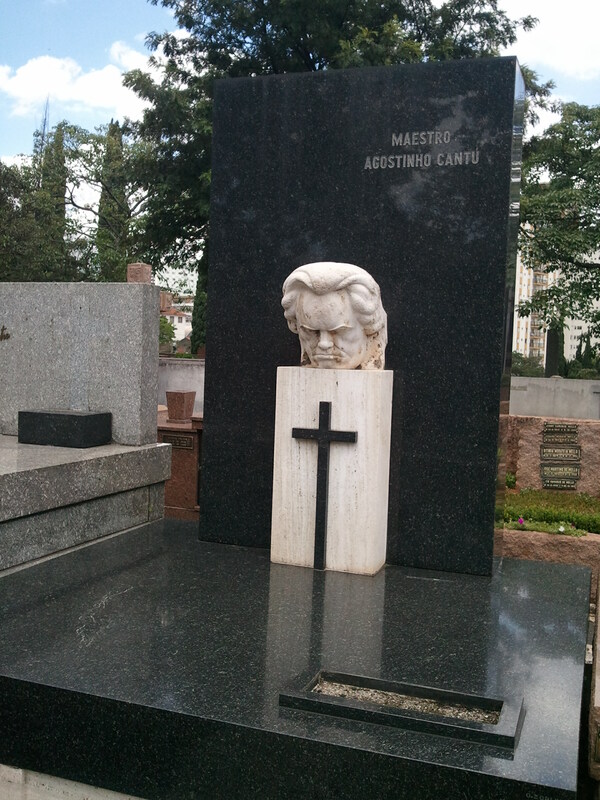 A genial presence with curly white hair, he appreciates our attention and talks freely about his work. Pop artists – Roy Lichtenstein, Andy Warhol, Peter Blake – are clearly his artistic forebears. 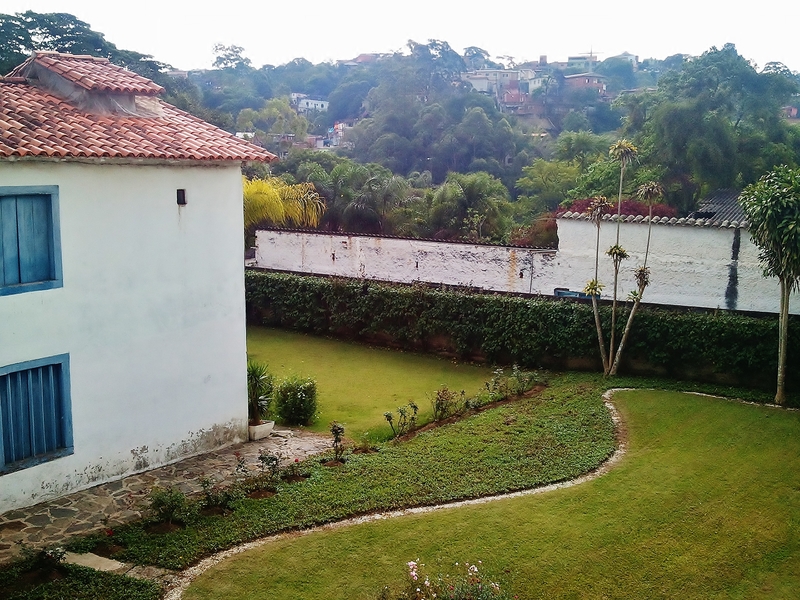 He’s a Paulistano retired from advertising to paint, and to enjoy the Rio lifestyle. 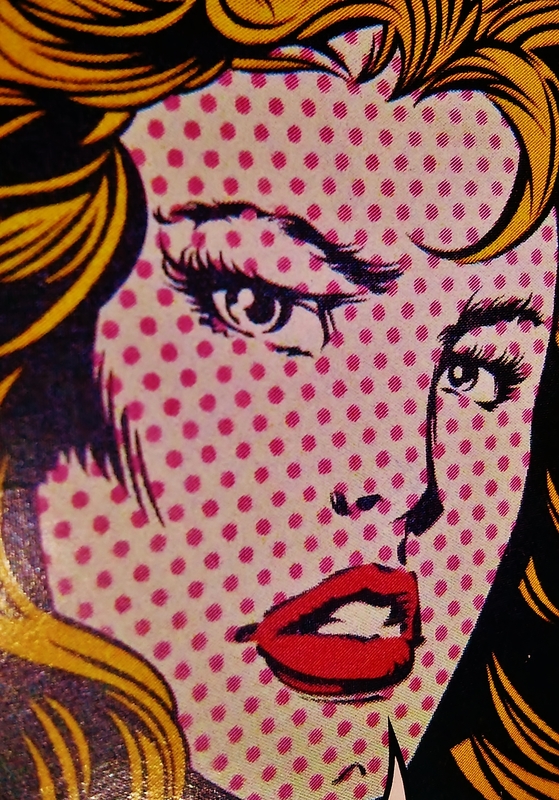 Many of his works are homages to the Warhol full-face portrait, executed in the large-scale comic-book style which Lichtenstein popularised. Warhol’s portraits had a tongue-in-cheek element – photo-booth portraits, and large daubs of bright silk-screened colour, to accentuate the ‘famous for fifteen minutes’ style of his clients. In Brasil the celebrity portrait has reverted to iconic status, and Louzada’s work fits the bill. He needs to sell. 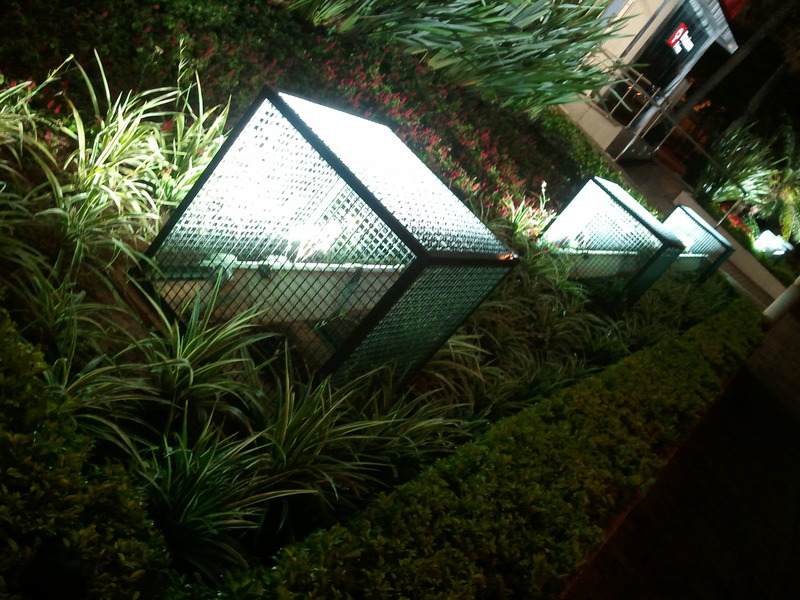 Something else attracts my eye. He has used another kind of icon. 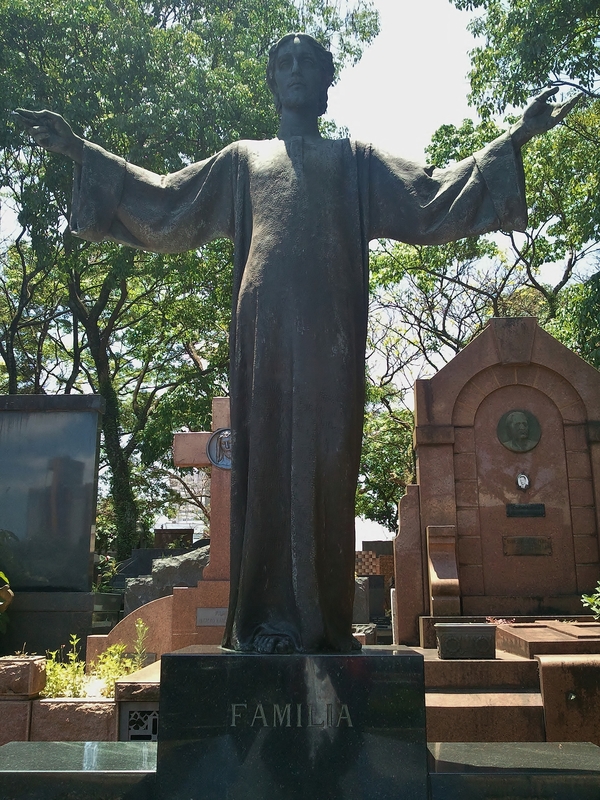 The statue of Cristo Redentor, “the world’s largest Art Deco statue”, is floating in a field of mixed-media images. 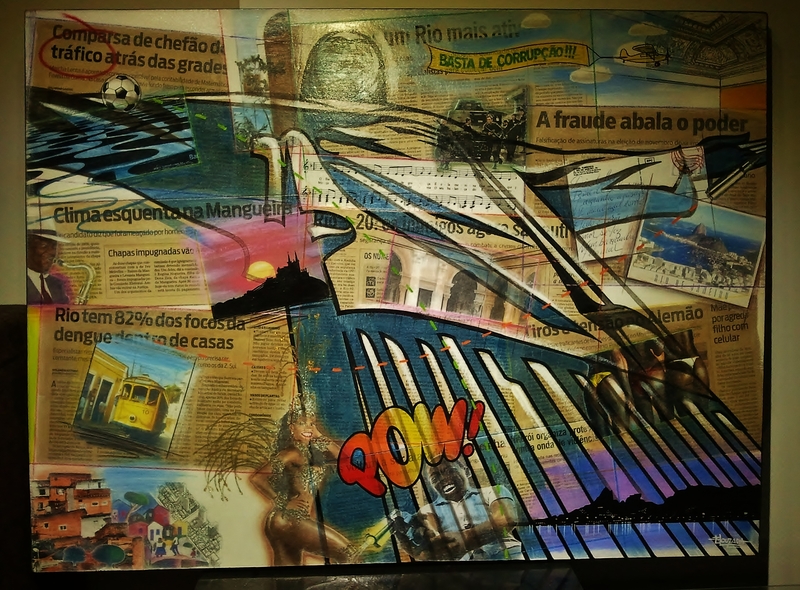 Postcards, newspapers, tourist snaps and scraps of musical score draw your attention to and fro, skimming over a comic-book Cristo which both embraces and shrugs at Rio life – the hillside favelas and the richly-stuccoed ceilings of the ancien regime, the coastline lights twinkling against the silhouette of the Sugarloaf, the smooth young limbs of carnaval dancers and the handguns of youth crime (POW! really does mean POW! 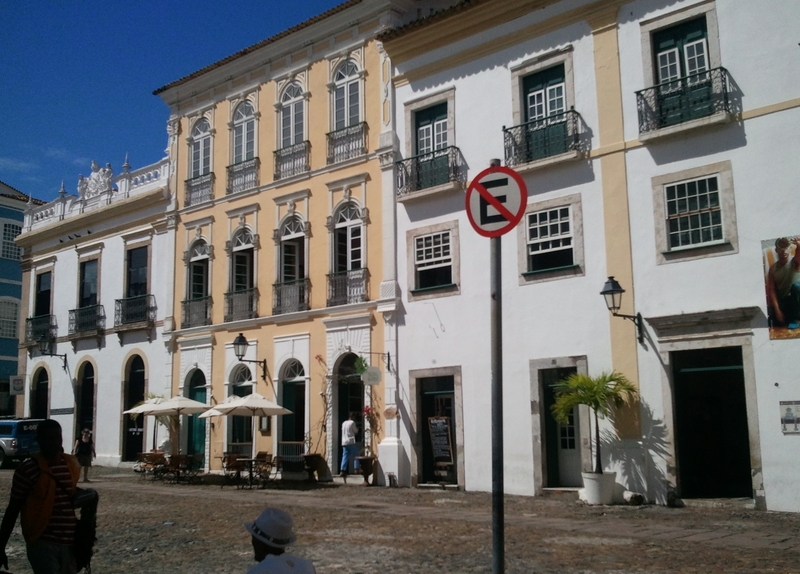 ), yellow Santa Teresa trams and black-and-white pavements, futebol and choro music. Fraud, dengue fever, politics, violence and pacification are yesterday’s news aging on fading newsprint. 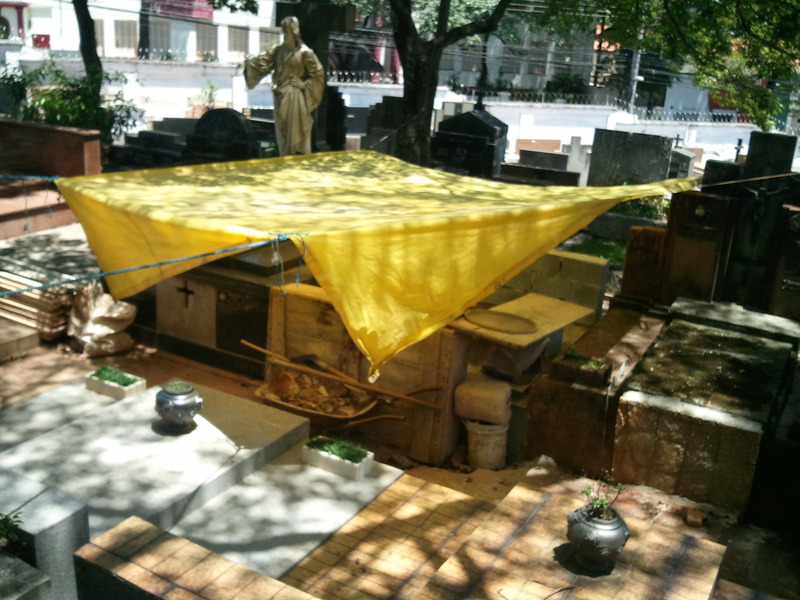 You may take Cristo’s gesture for a fatalistic ‘whatever’ raising of hands except that, in best comic-book tradition, top right a bright yellow aeroplane flys a banner the colours of the Brasil flag proclaiming “Basta de Corrupção!!! “Enough corruption!” Again, an artistic style which has come and gone in the West is reinvigorated in Brasil. Pop art, murals and graffiti, jazz, soap opera – they breathe new life in the Southern hemisphere. When you ask someone here “How are you?” they reply not with a British “Not too bad” but with a Brasilian “Tudo otimo!” “Everything’s grand!” Given the optimistic energy of Brasil, perhaps they will be able to address the problem of political ethics with new vigour. P.S. Edson Louzada can be reached at louzadapop@gmail.com. Every Saturday and Sunday evening between 6 and midnight he is at the Avenida Atlântica market on the central reservation – the calçadão – on the beachfront in Copacabana in Rio. He’s at posto de salvamento 5, opposite Rua Sá Ferreira.